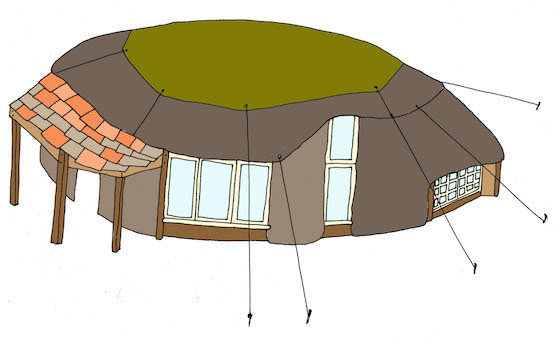 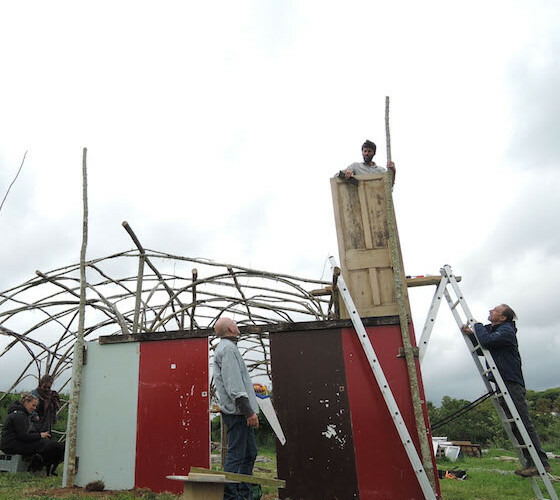 A temporary pavilion designed by artist Paul Chaney. 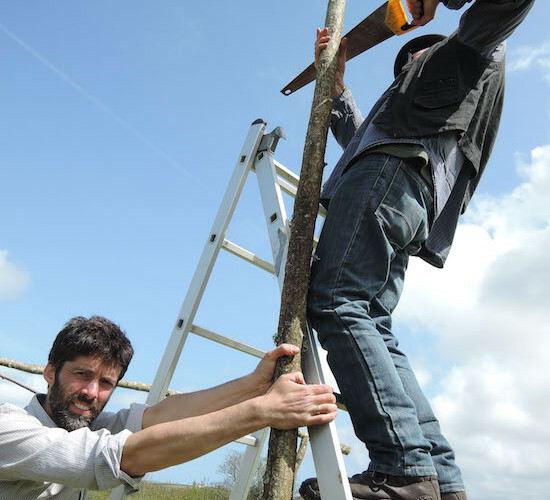 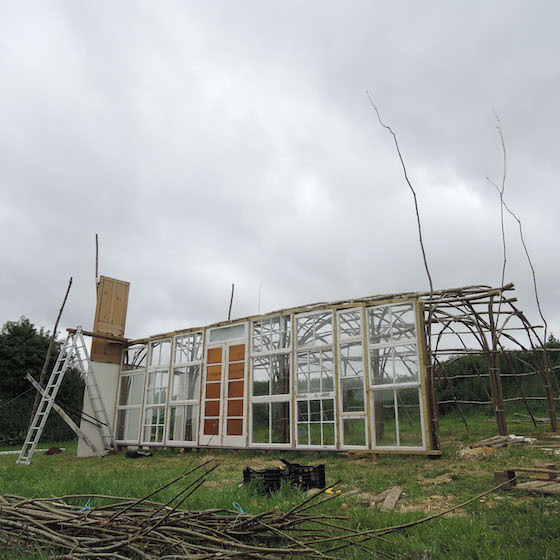 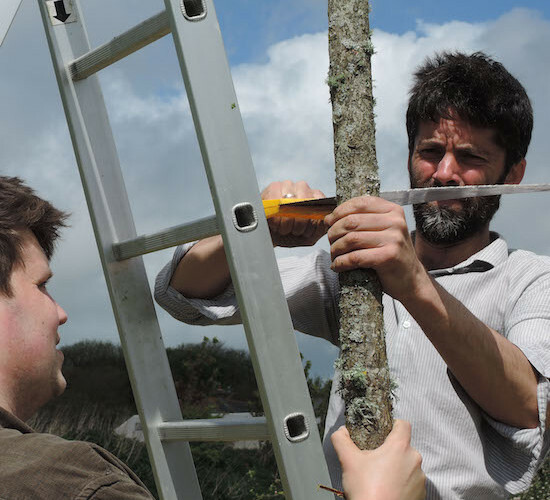 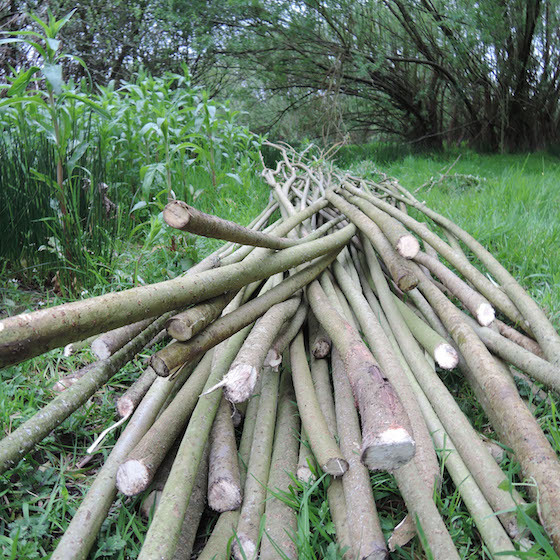 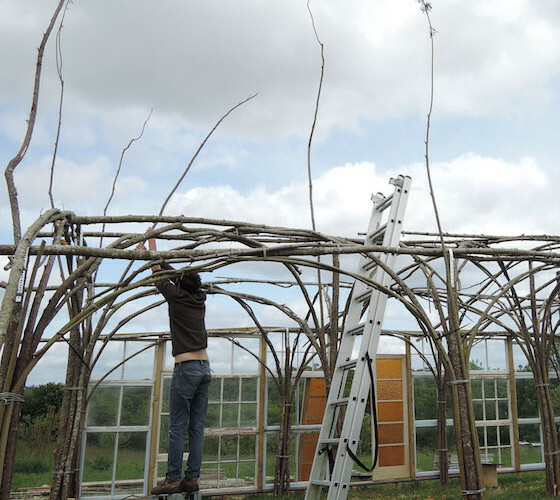 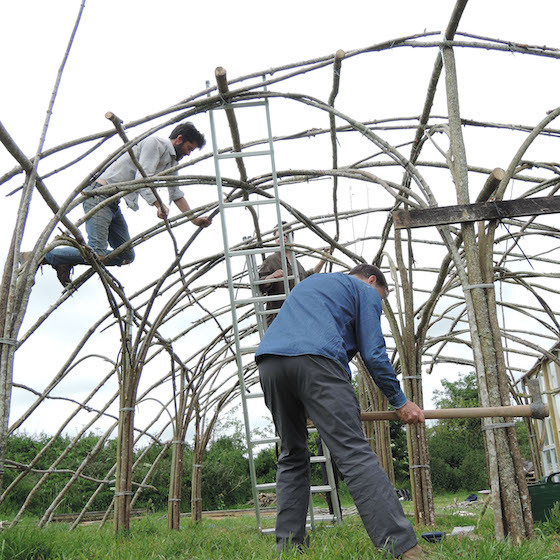 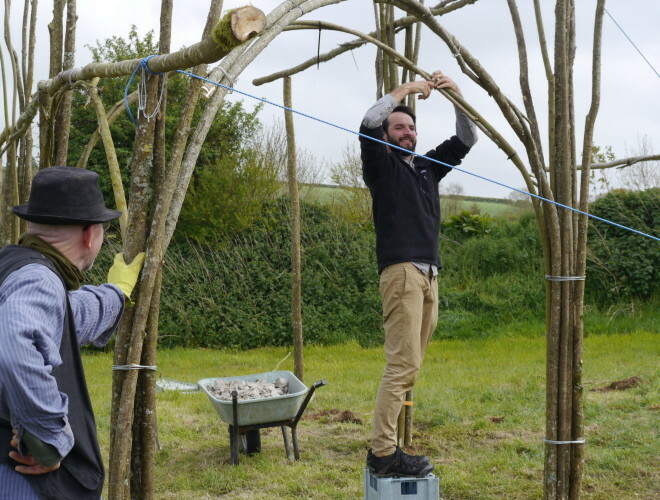 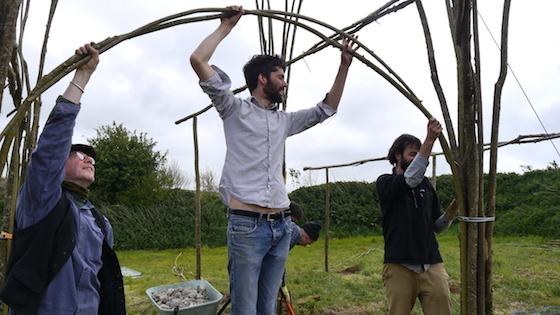 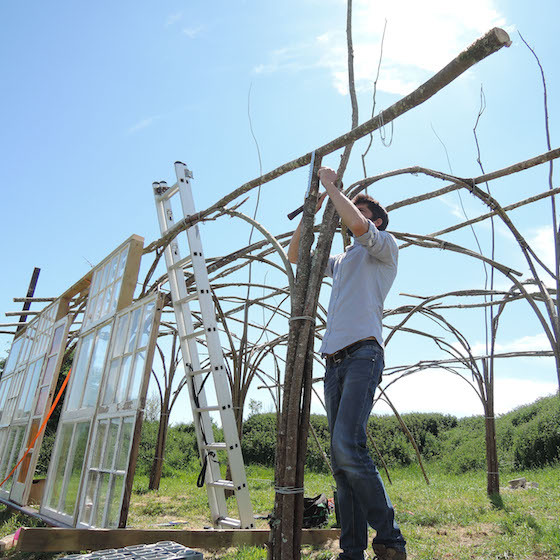 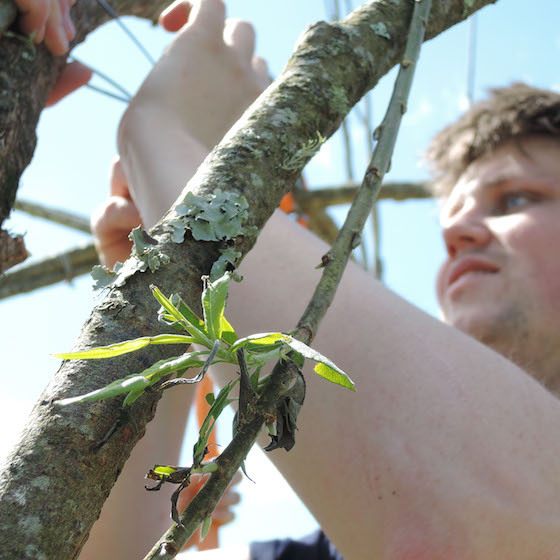 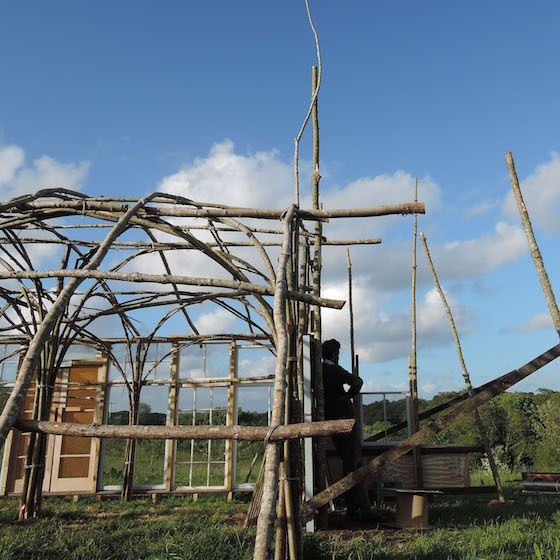 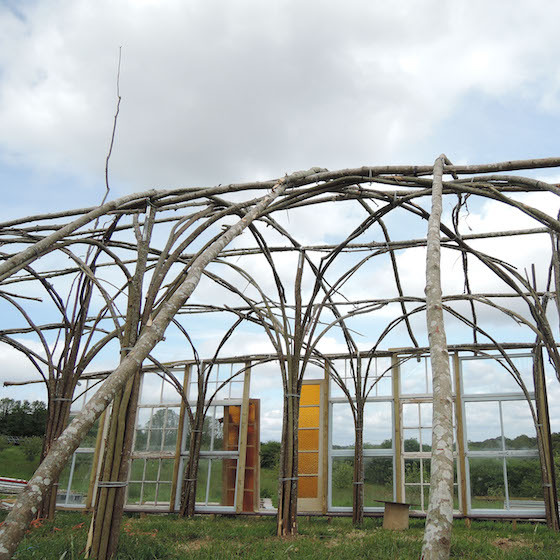 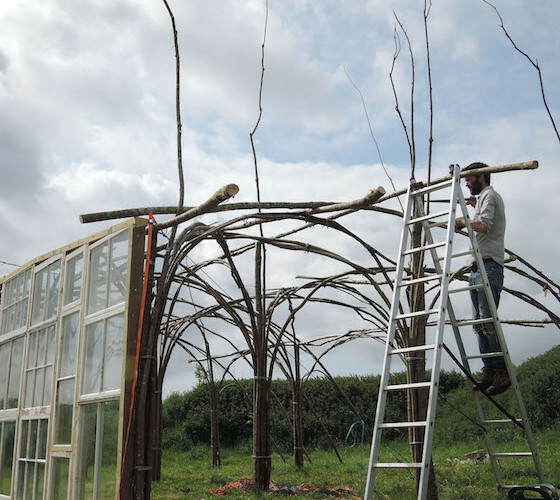 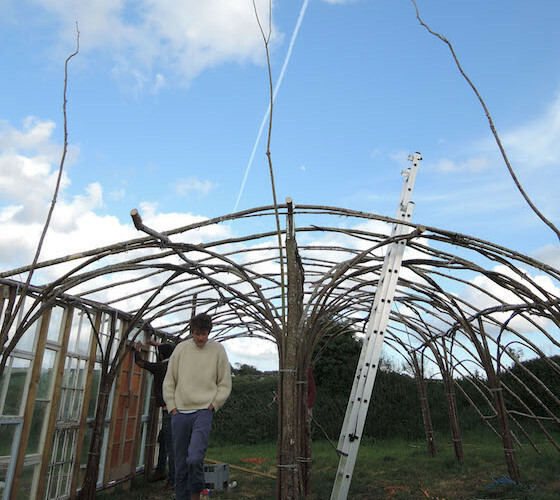 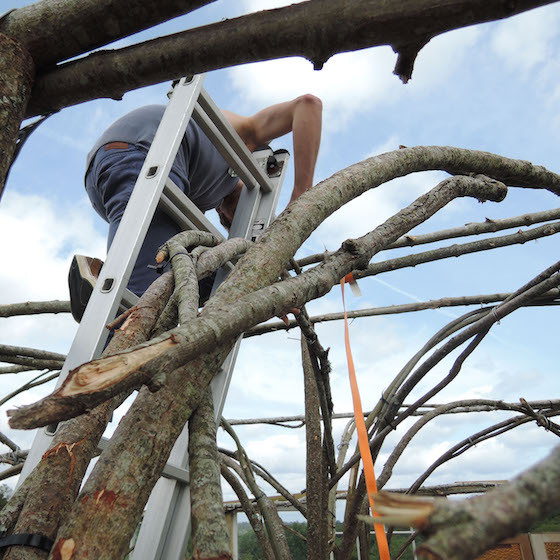 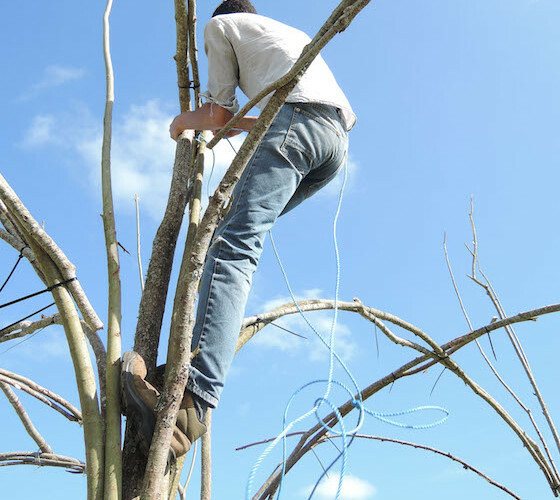 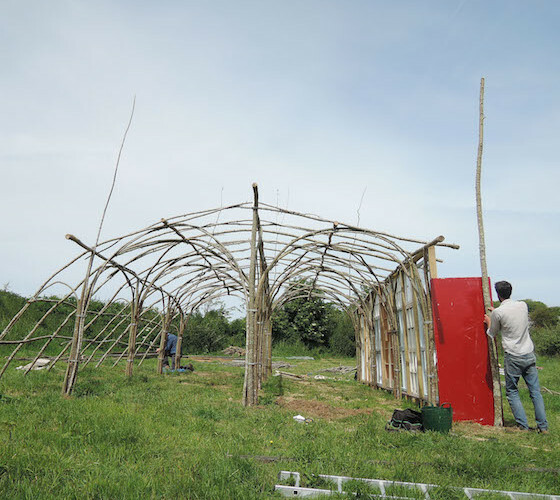 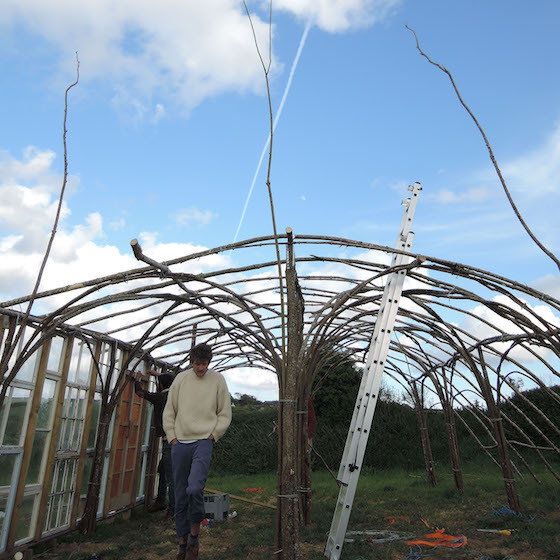 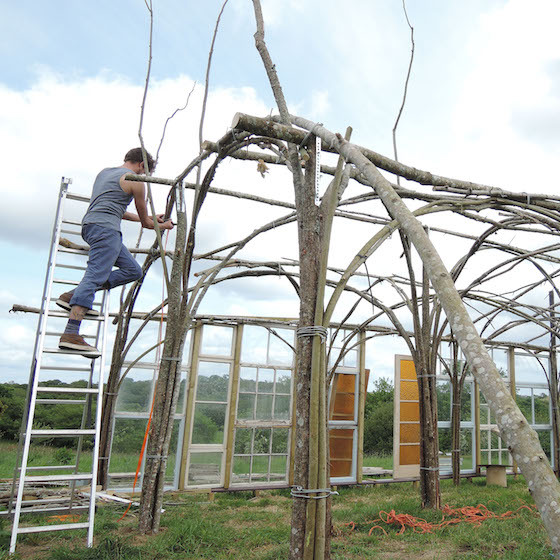 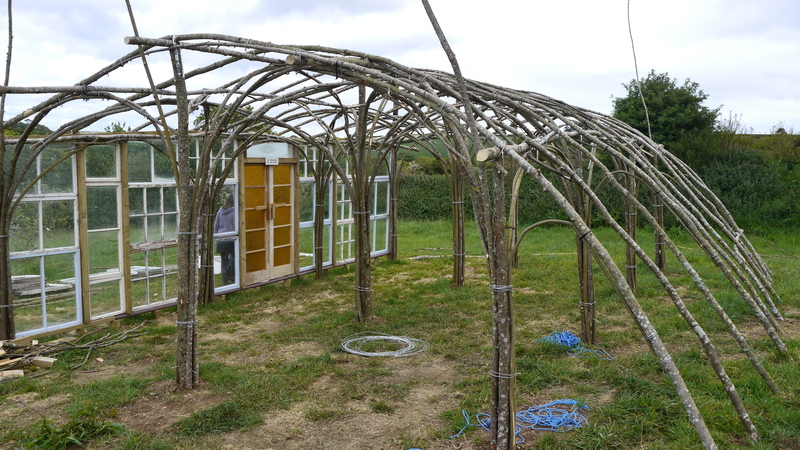 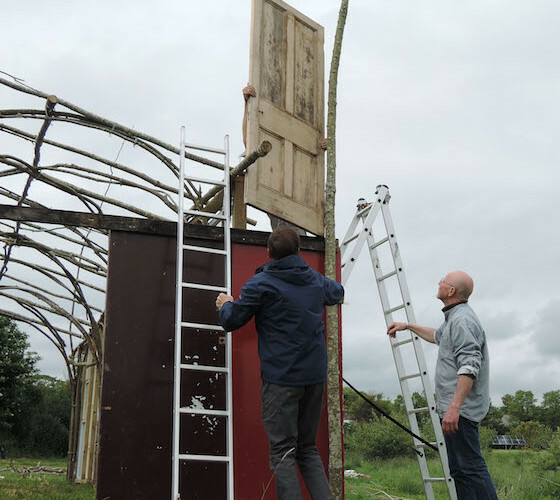 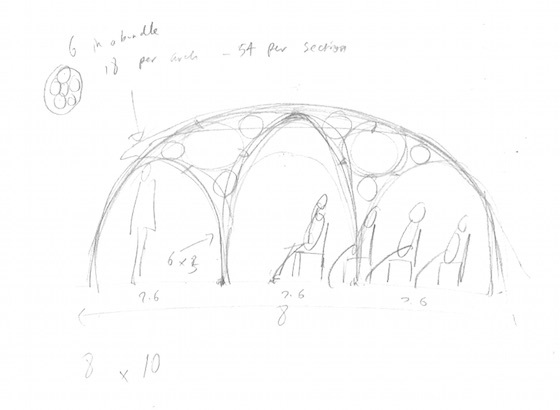 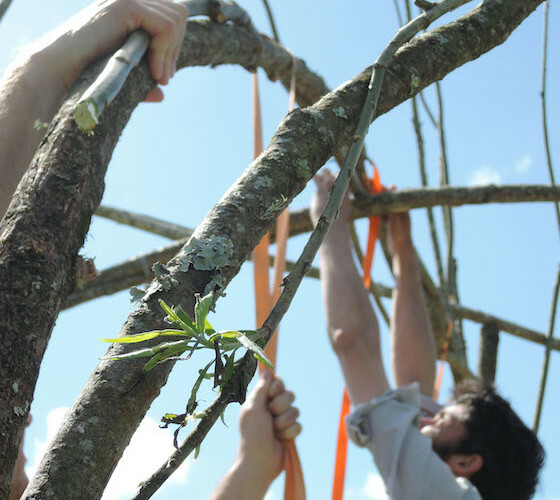 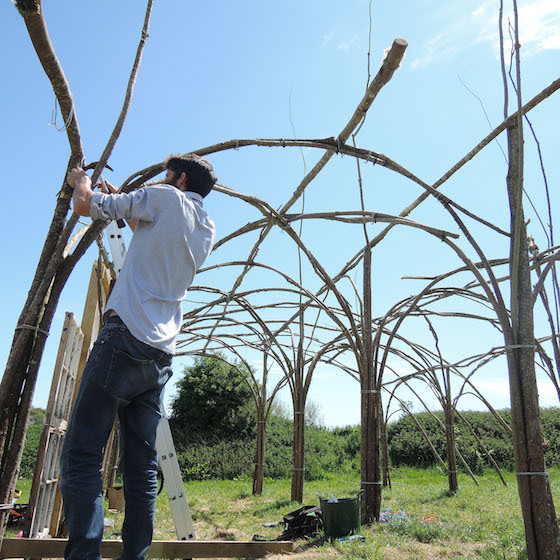 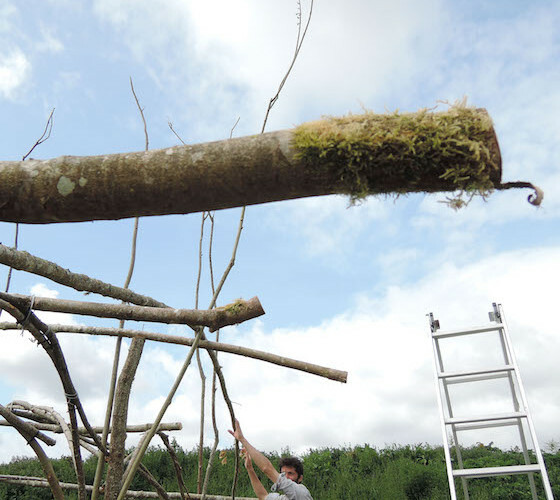 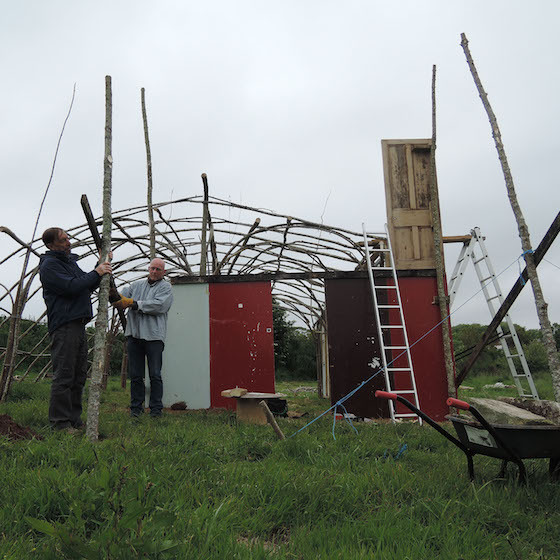 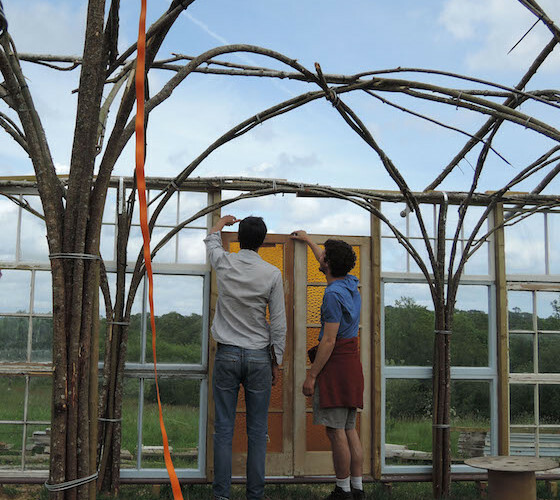 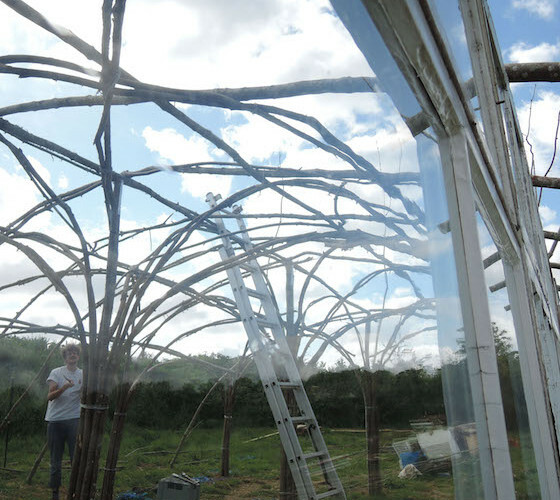 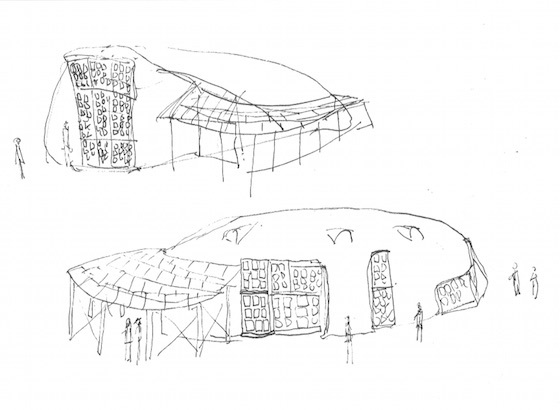 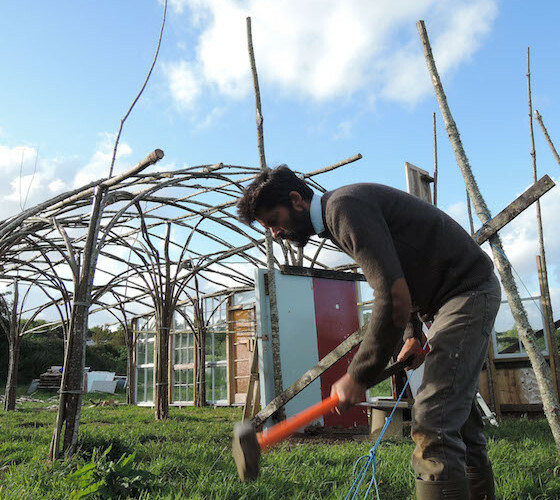 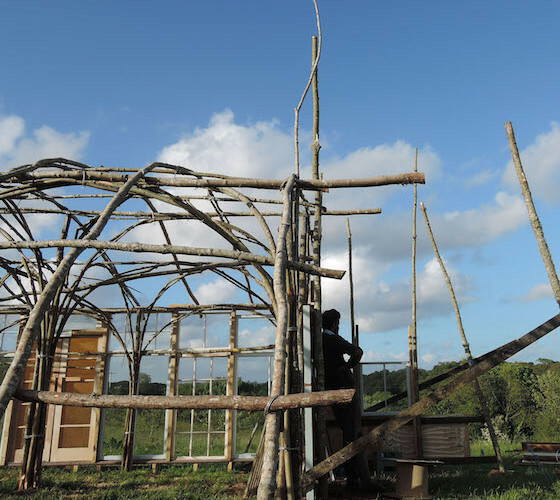 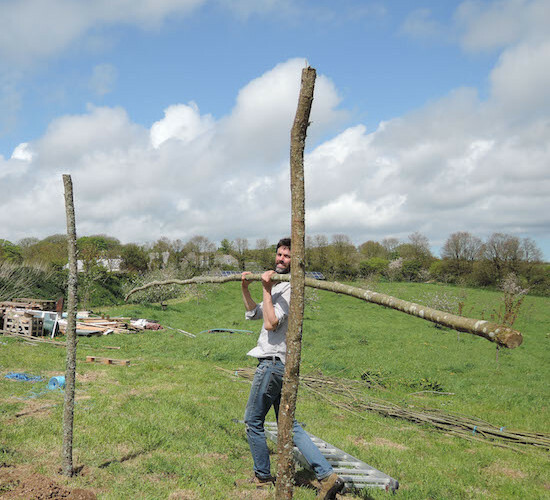 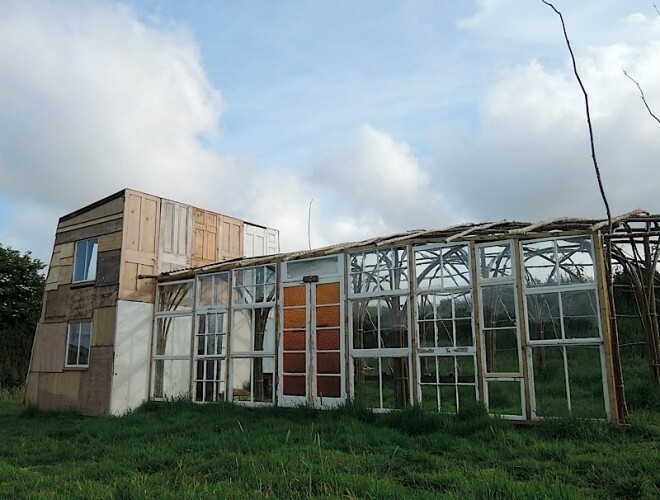 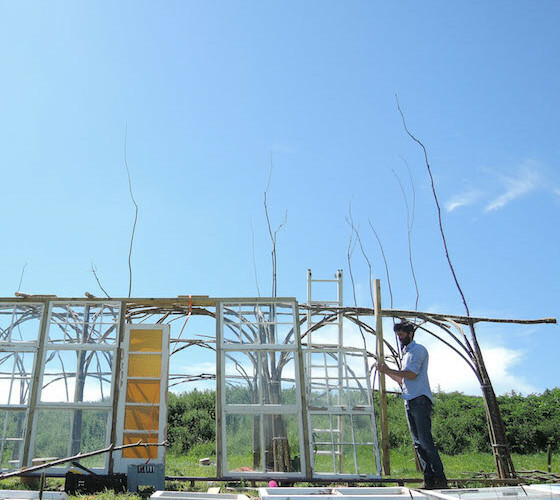 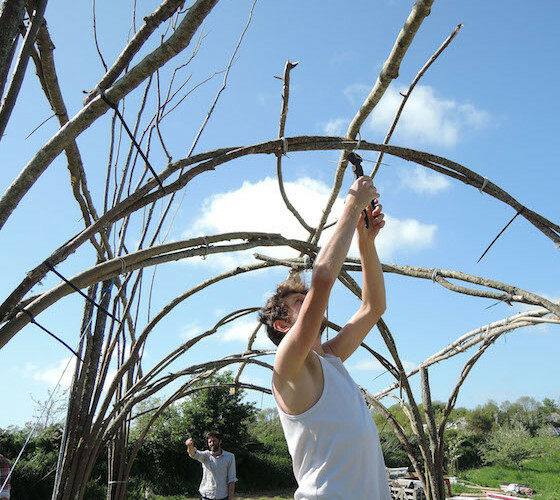 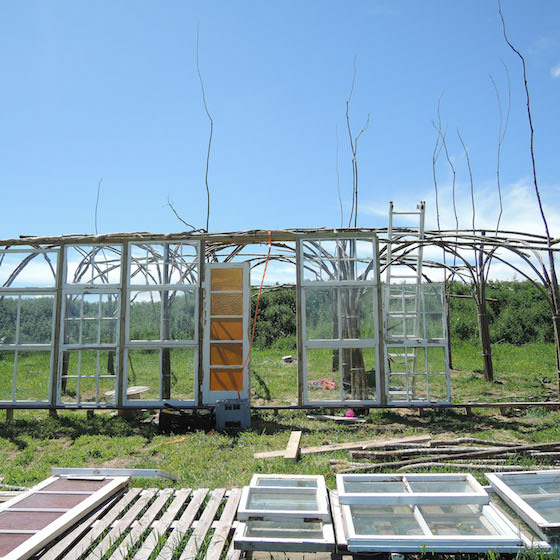 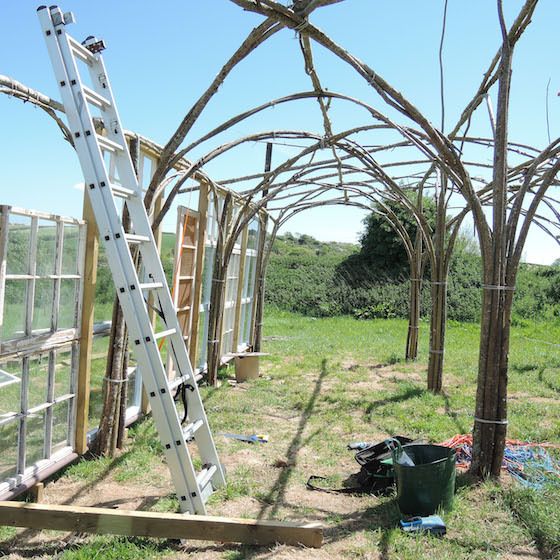 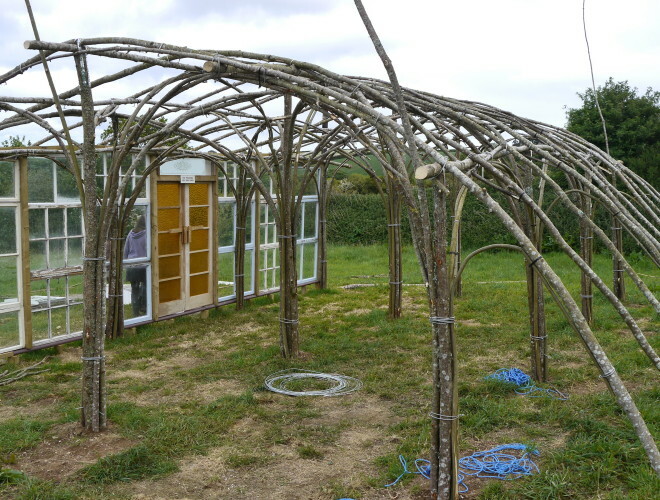 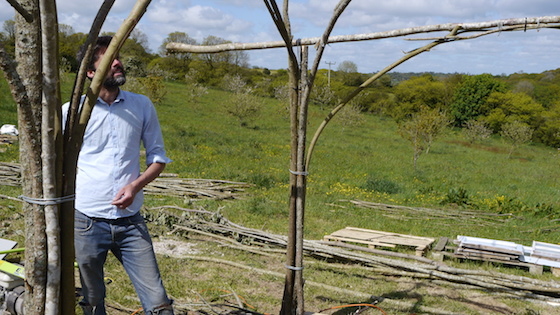 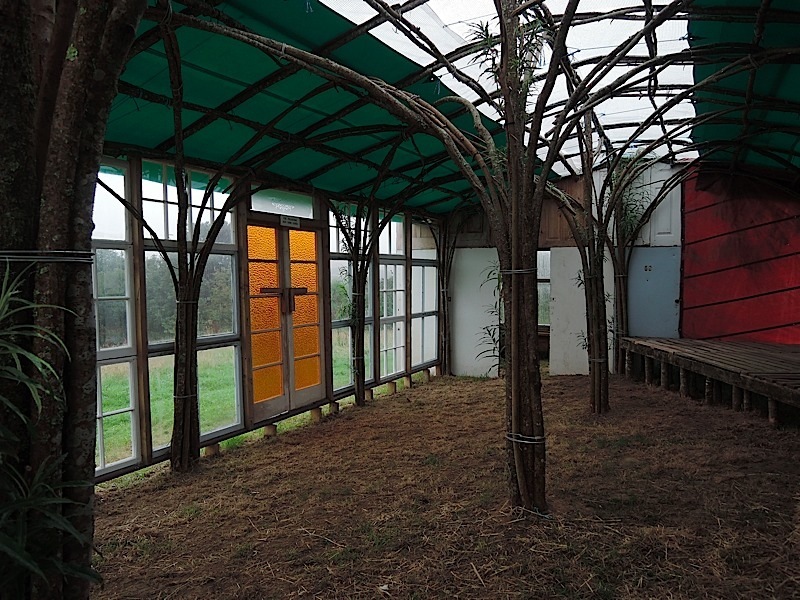 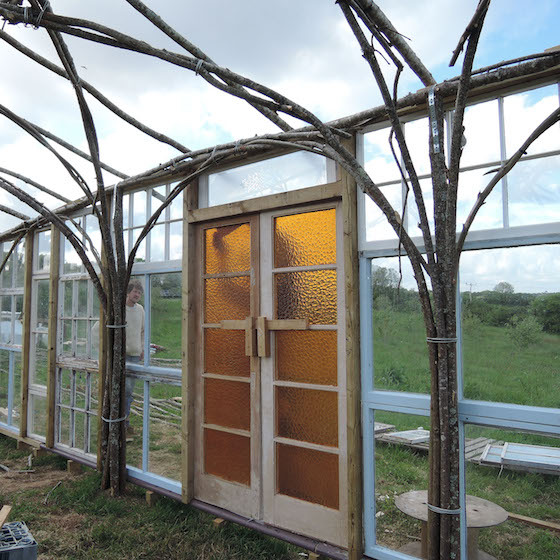 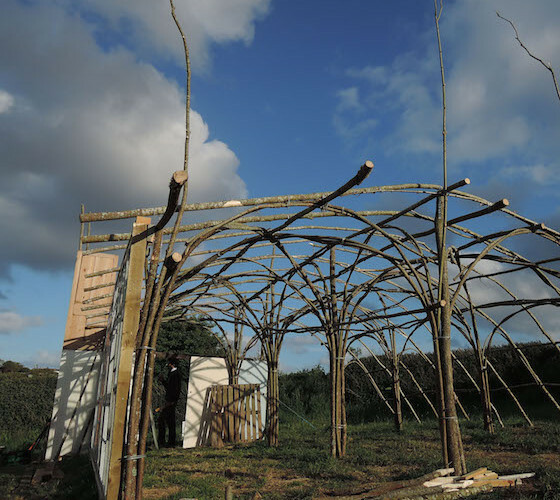 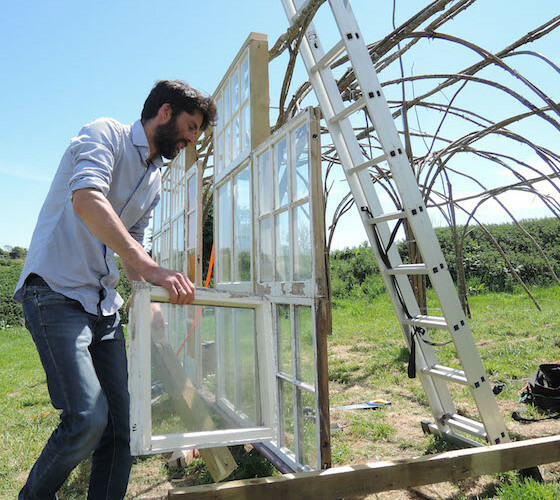 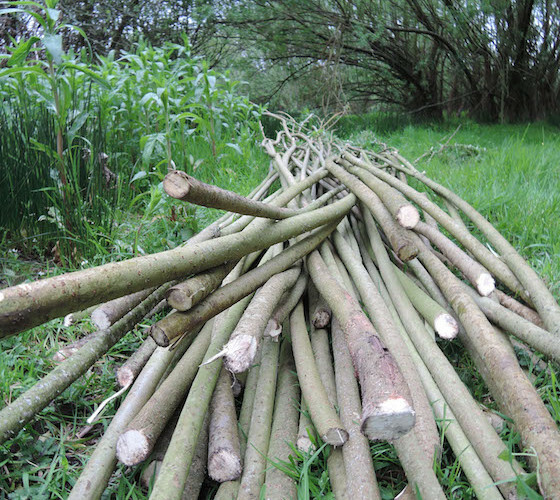 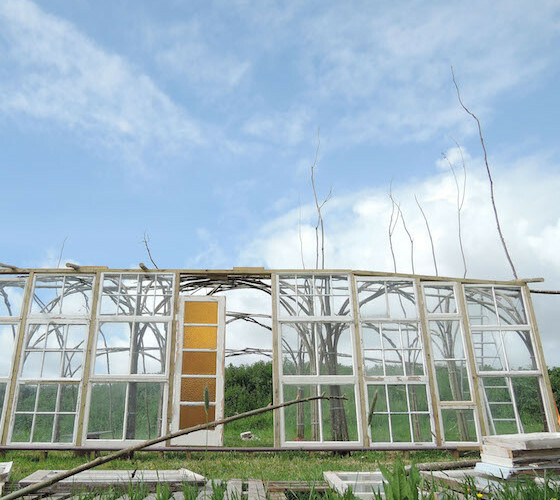 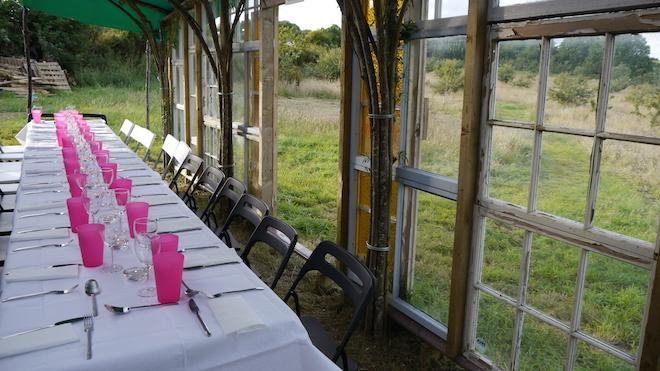 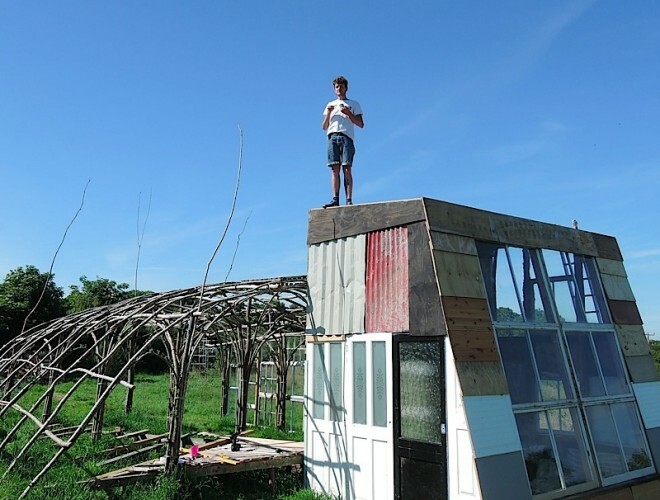 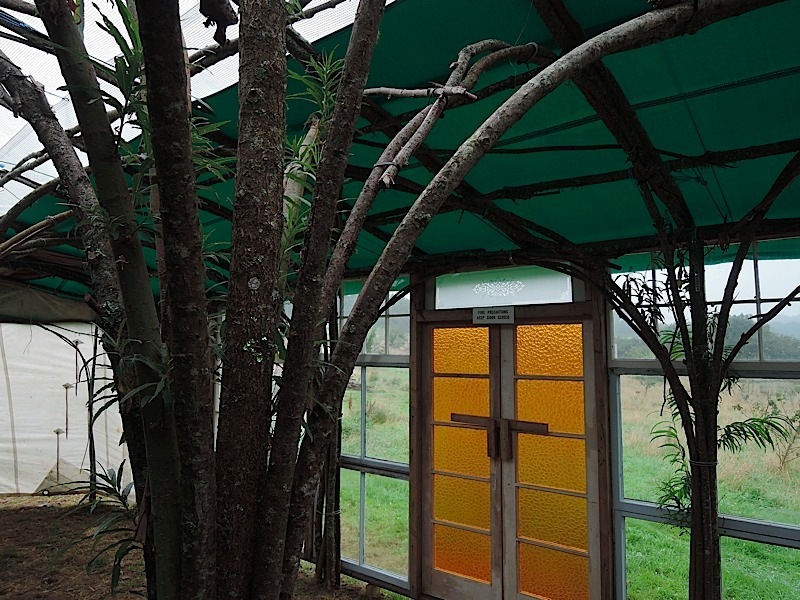 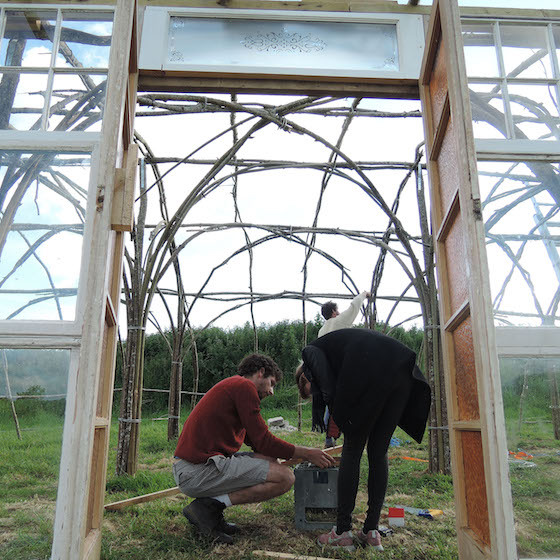 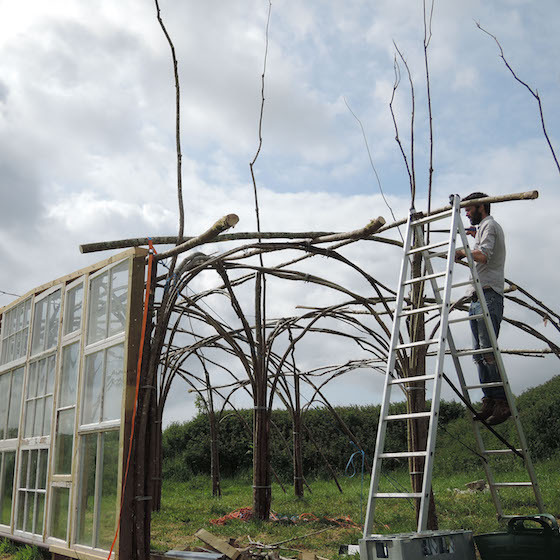 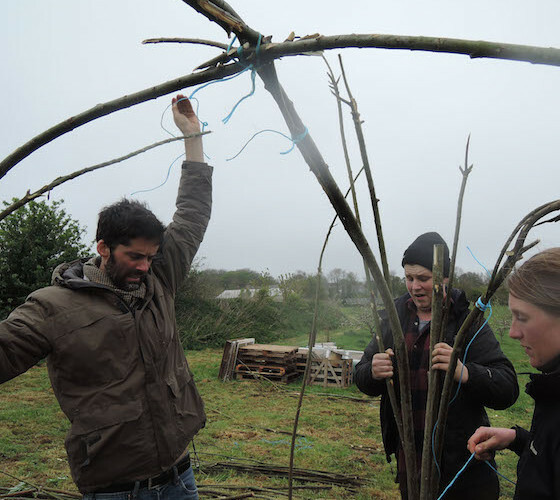 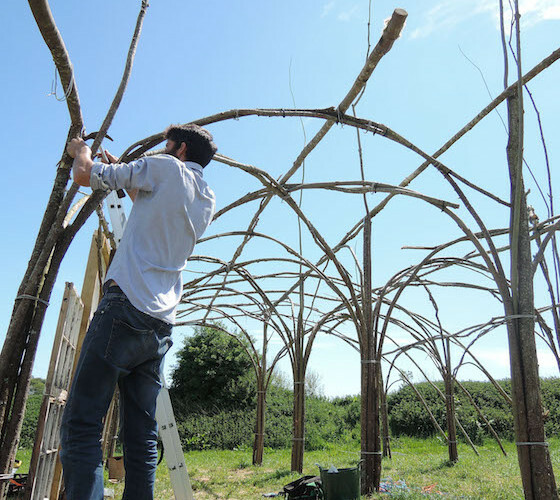 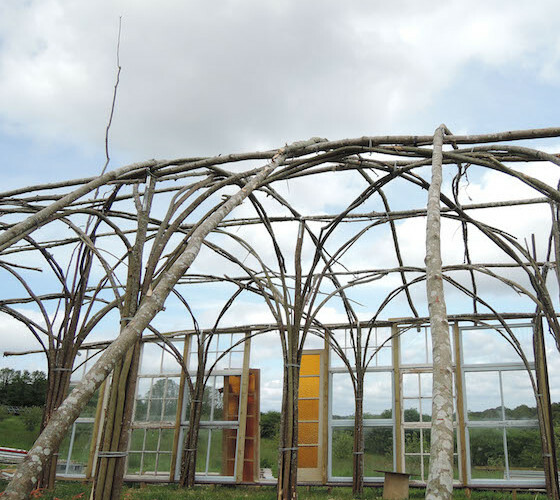 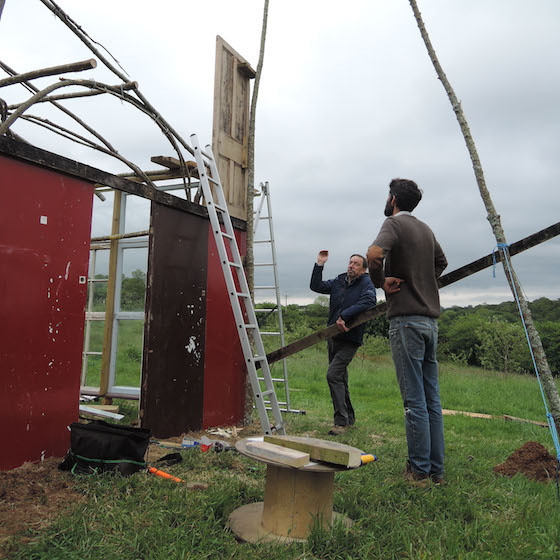 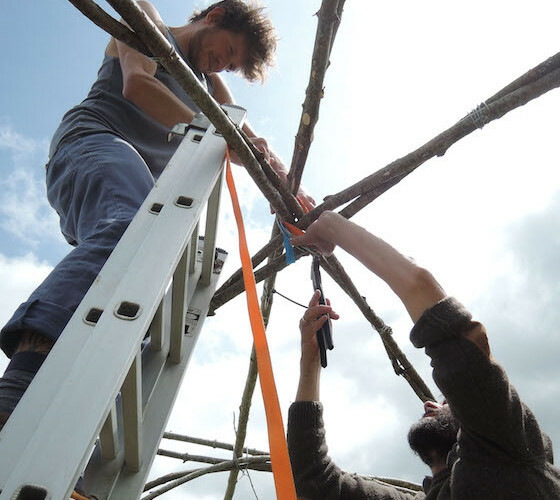 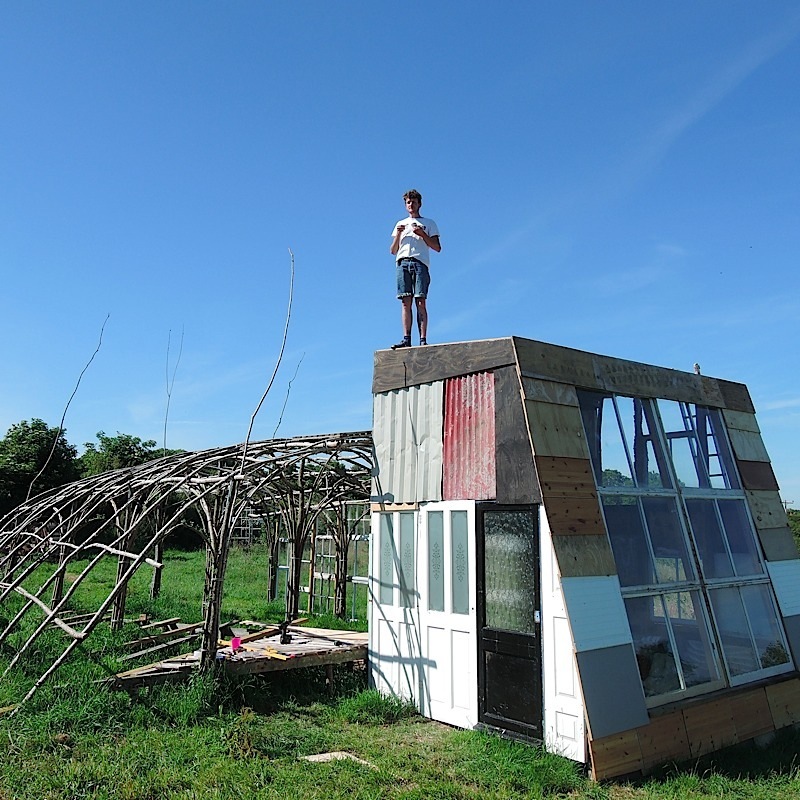 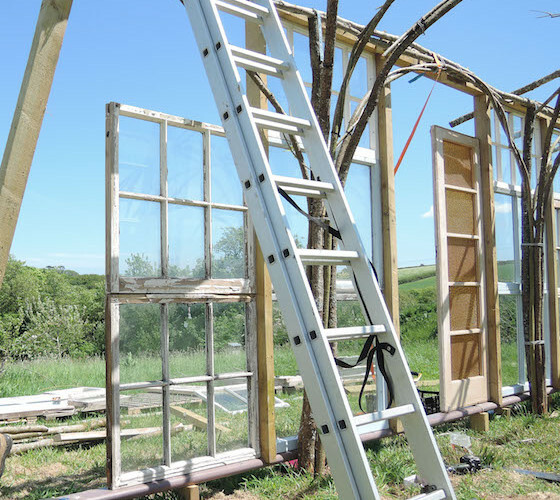 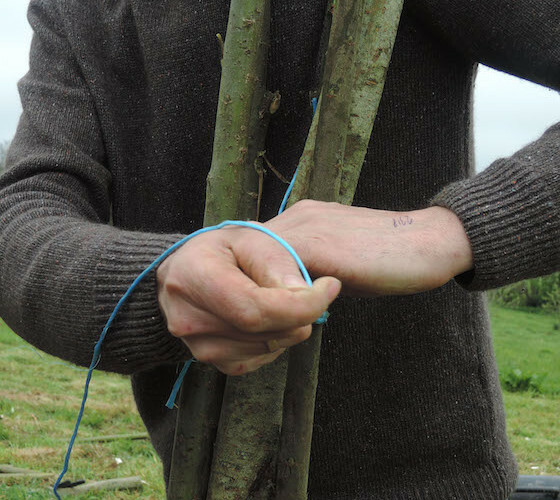 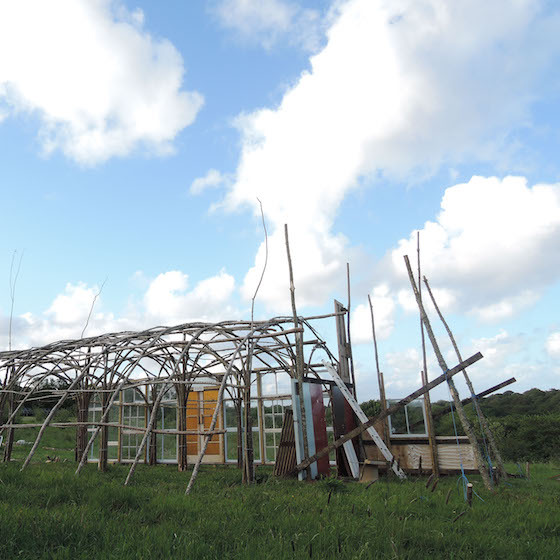 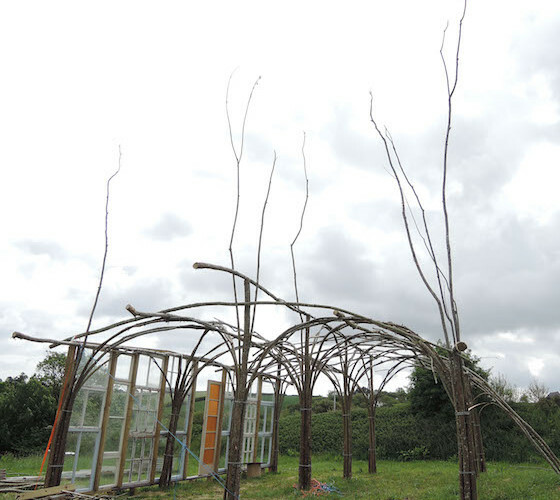 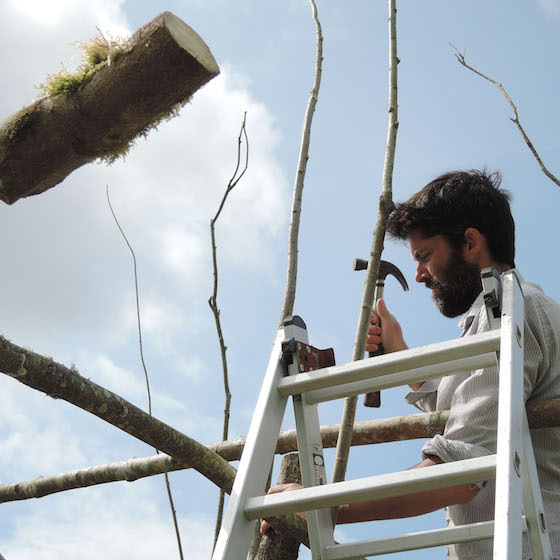 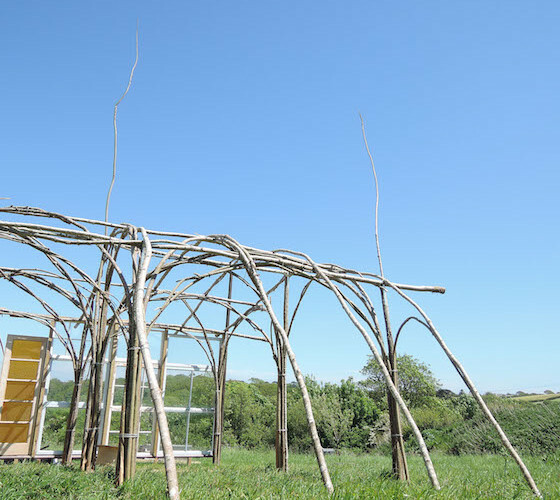 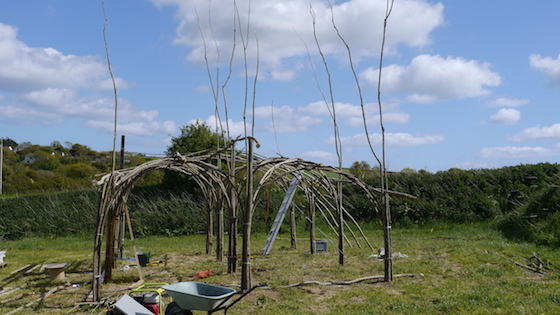 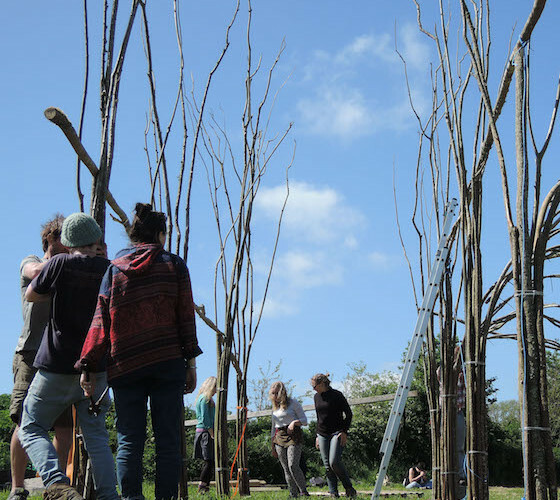 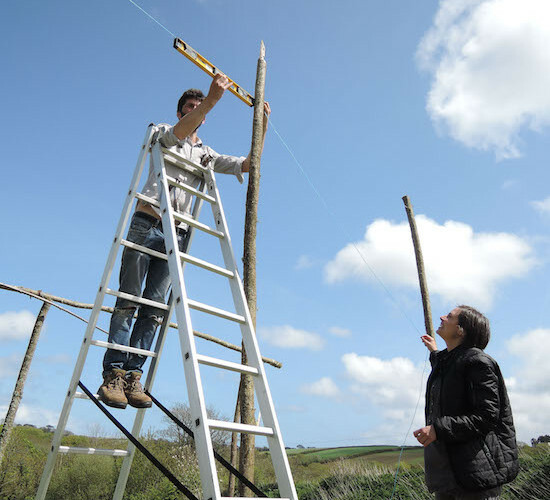 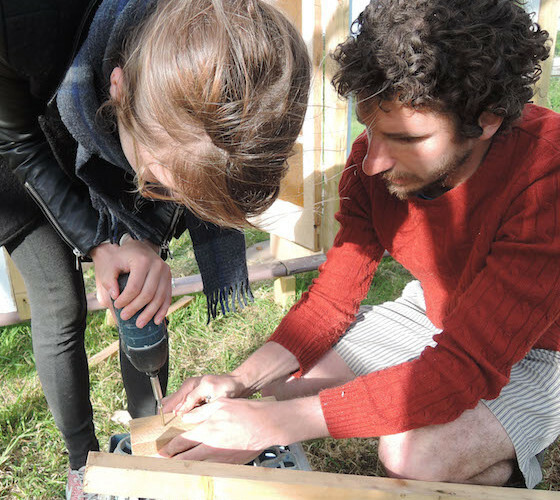 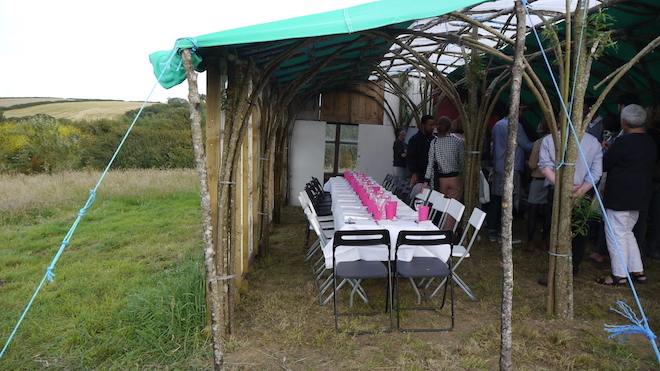 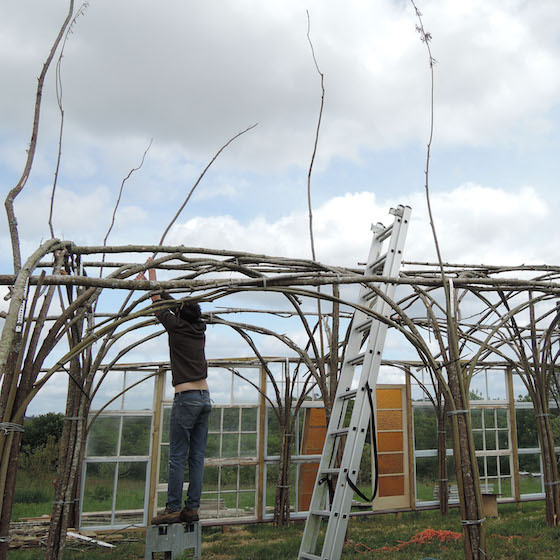 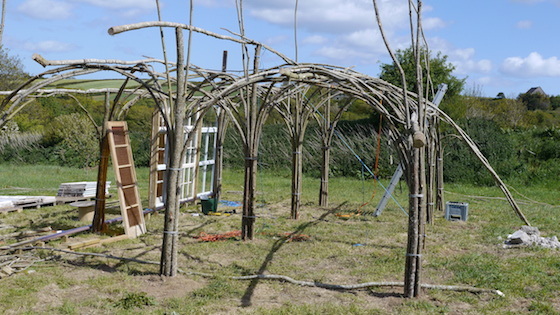 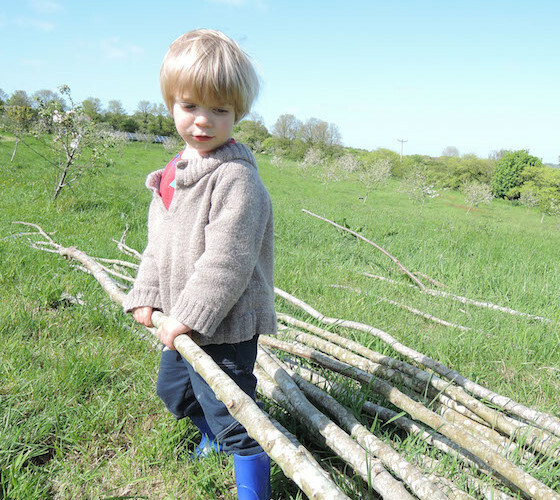 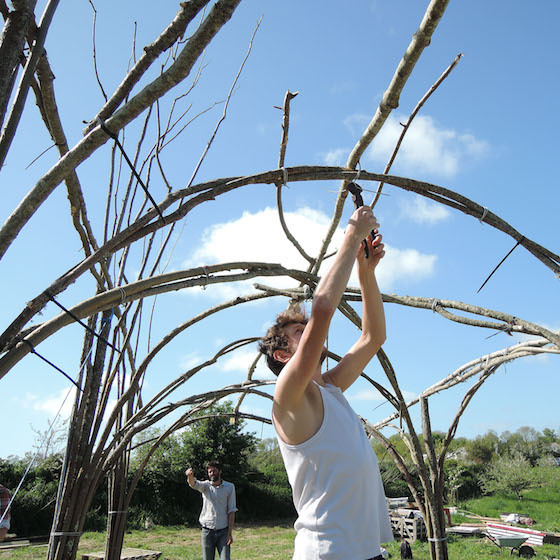 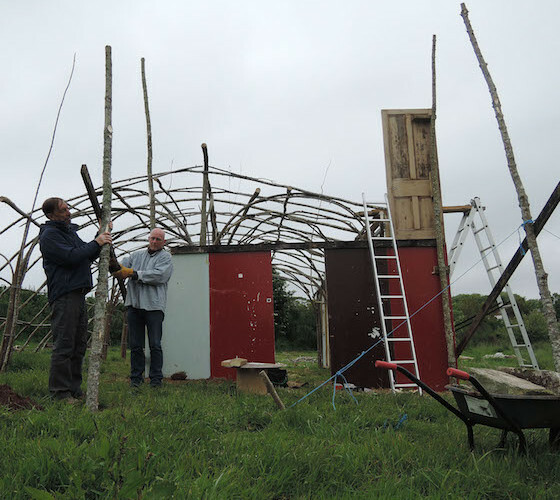 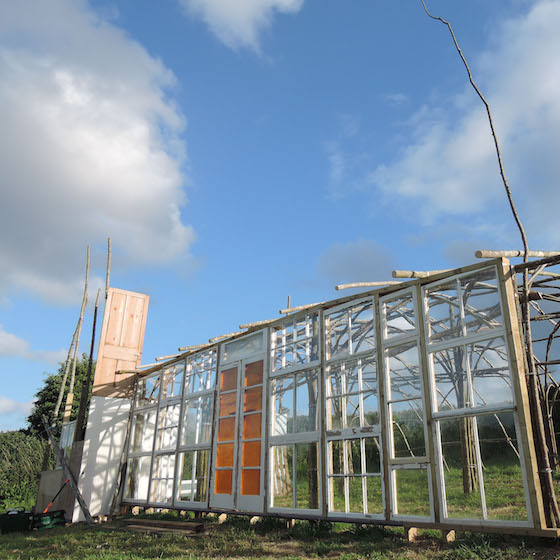 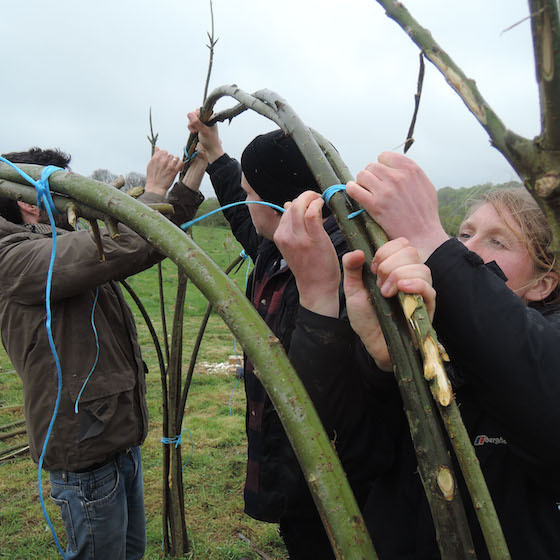 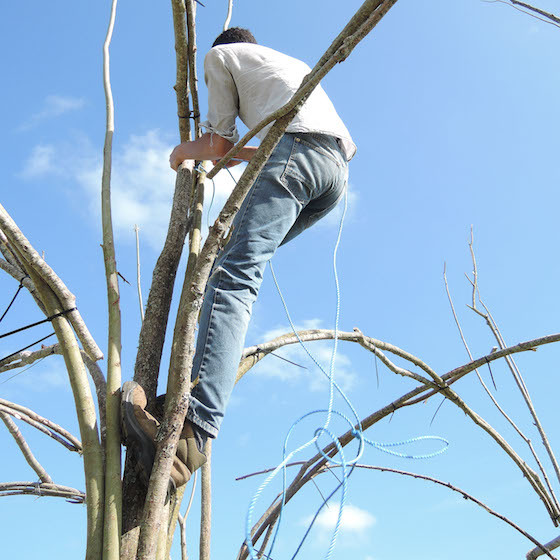 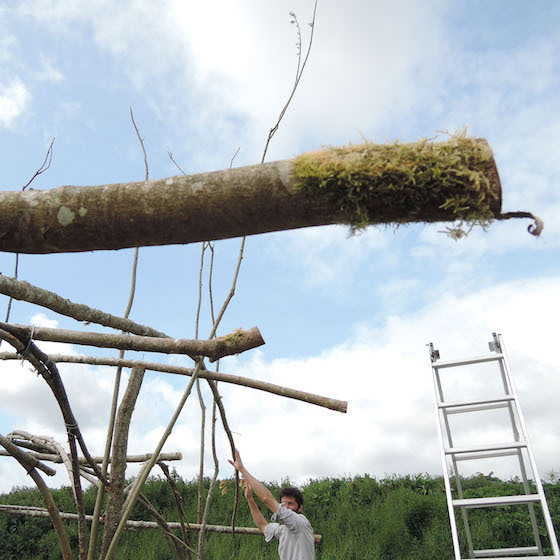 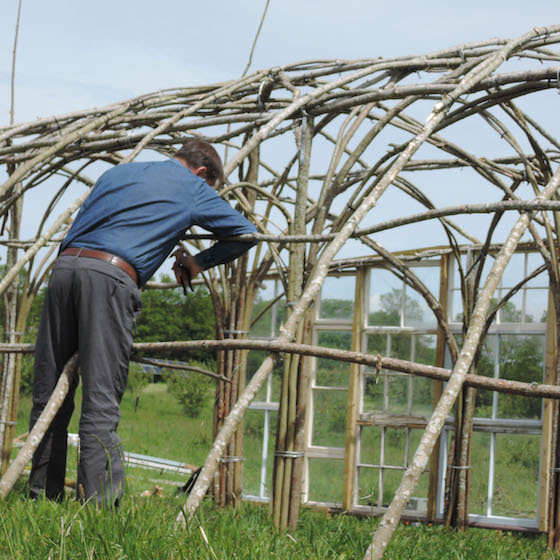 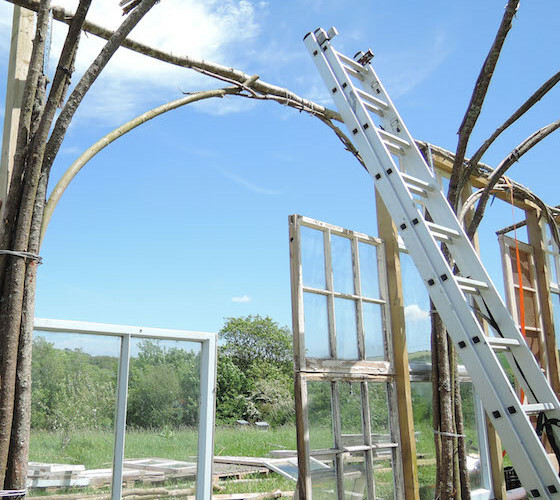 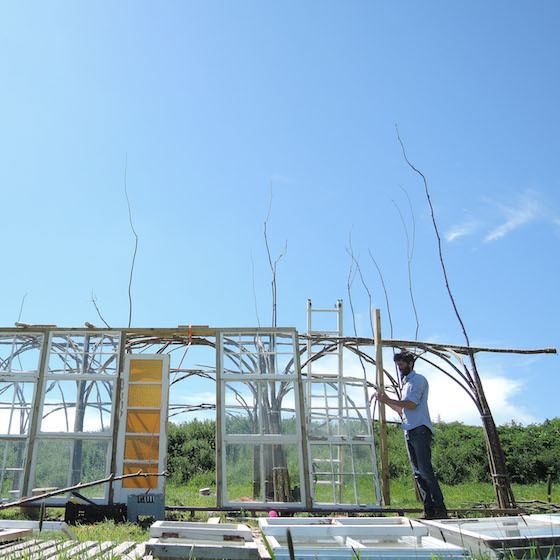 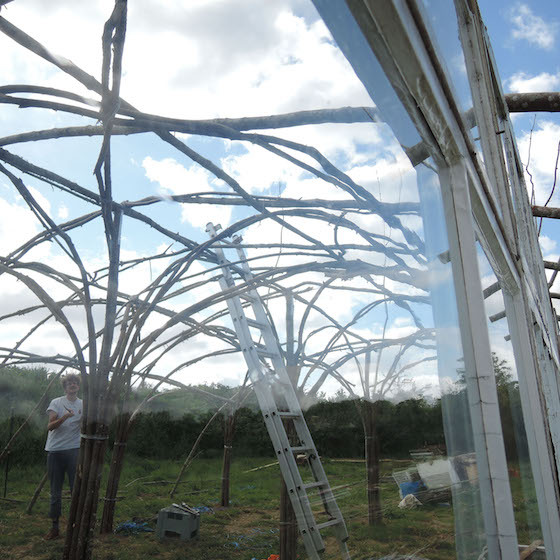 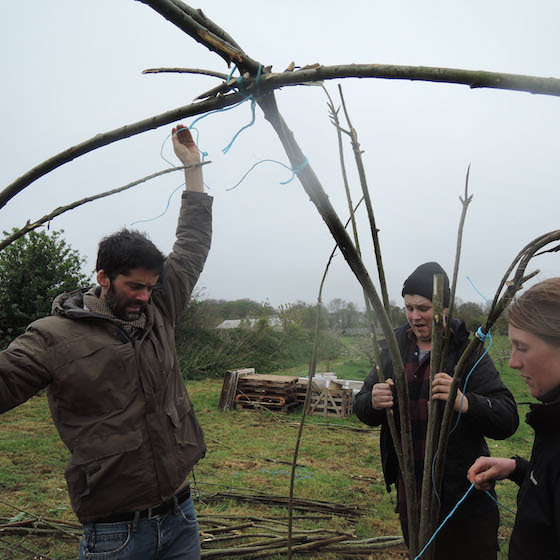 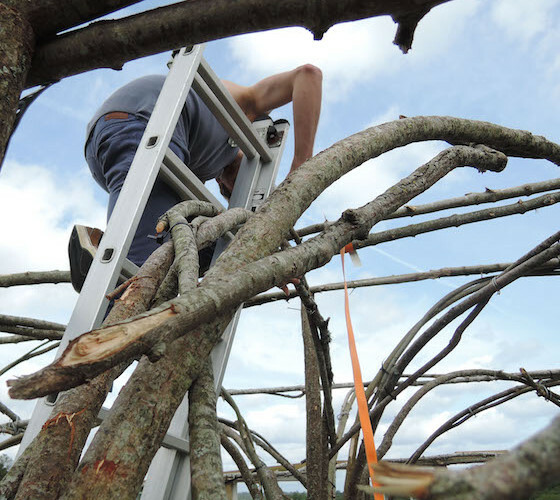 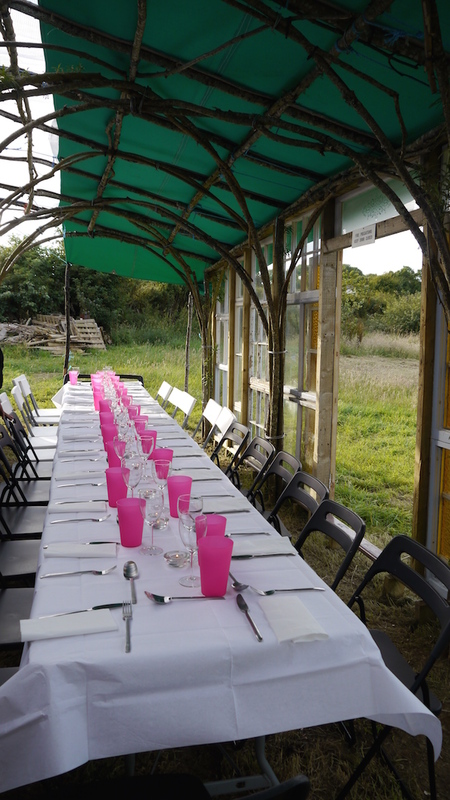 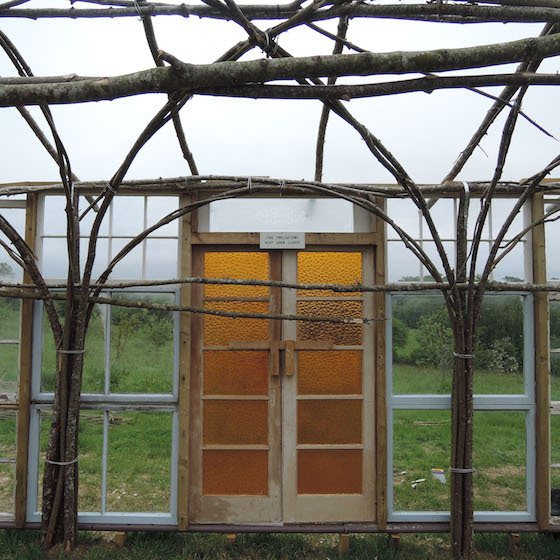 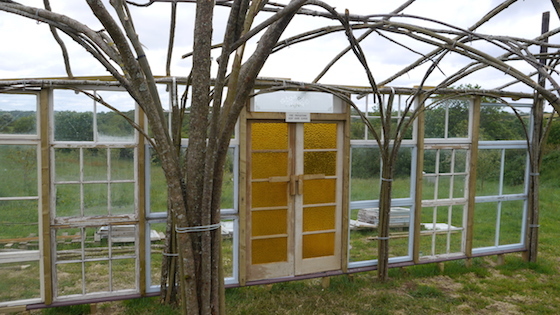 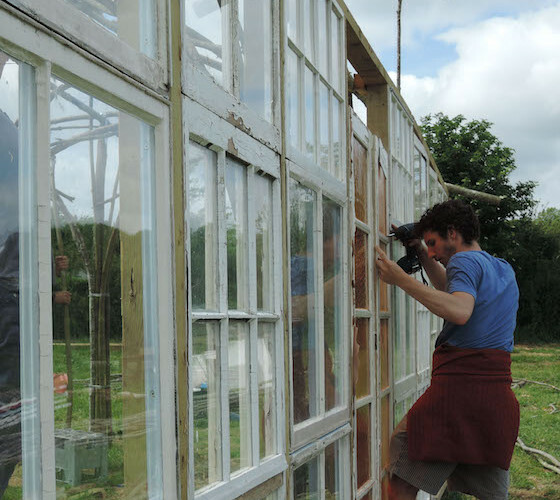 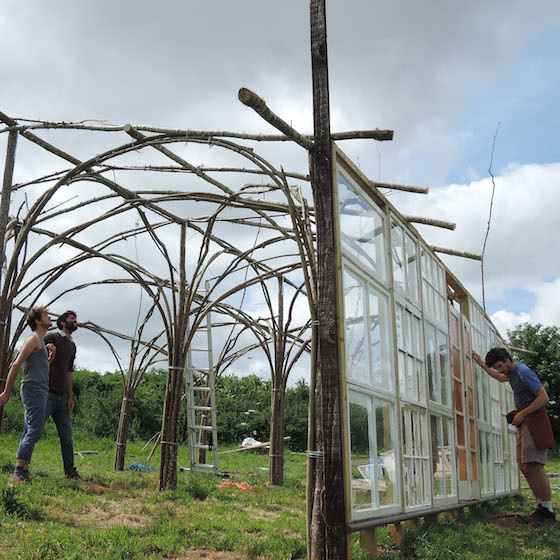 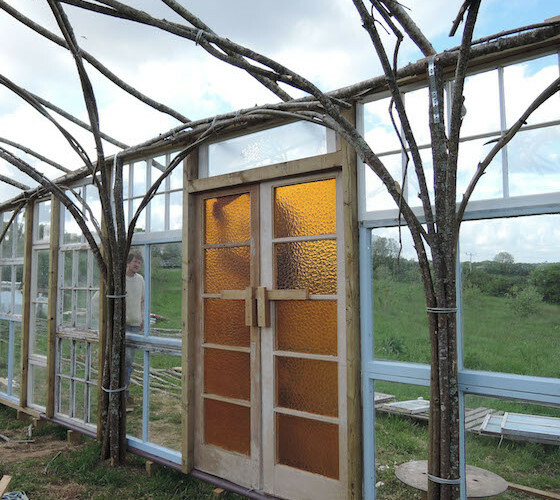 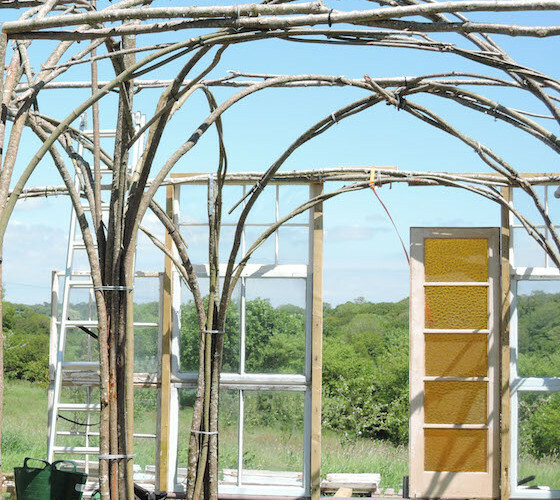 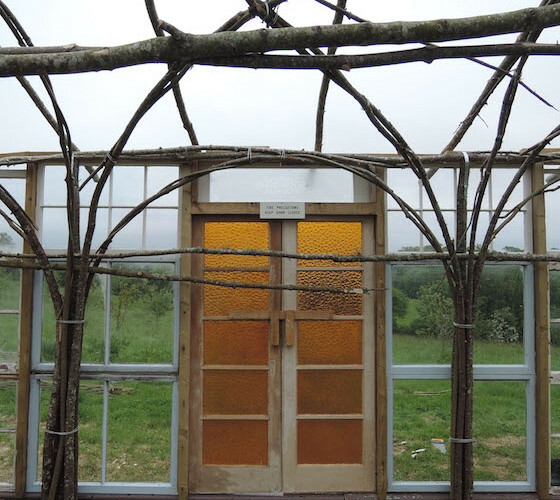 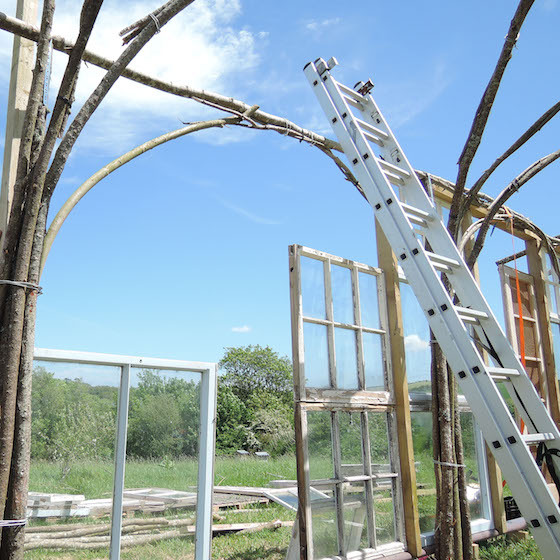 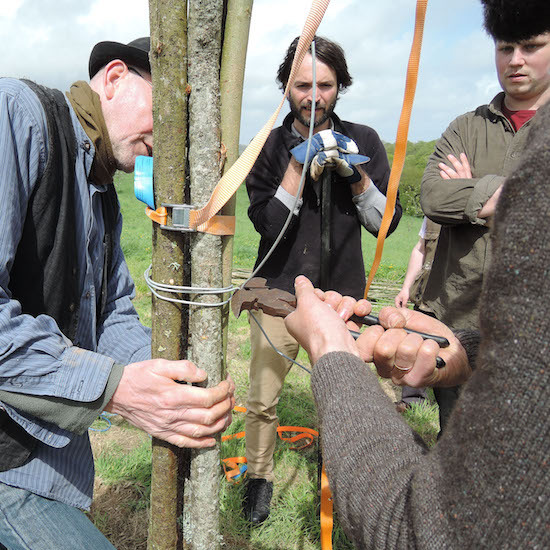 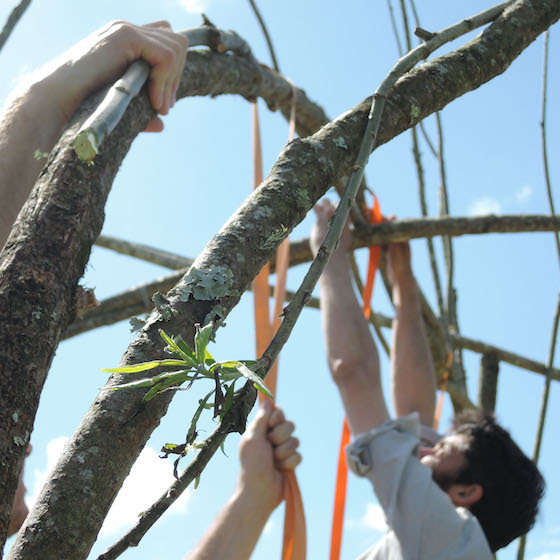 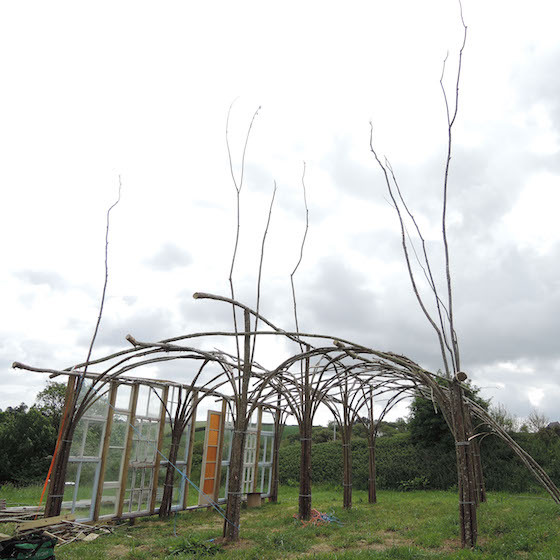 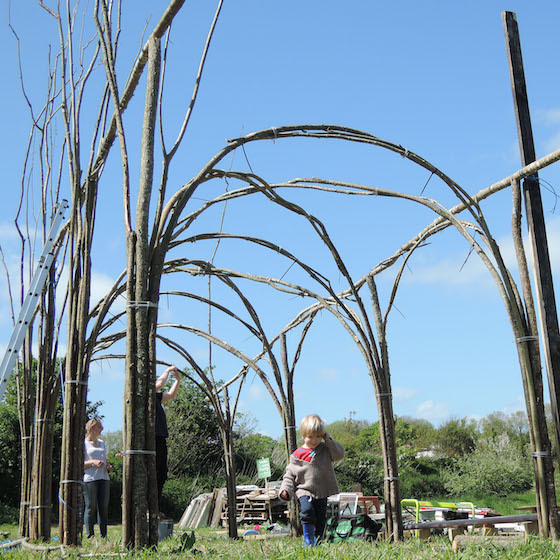 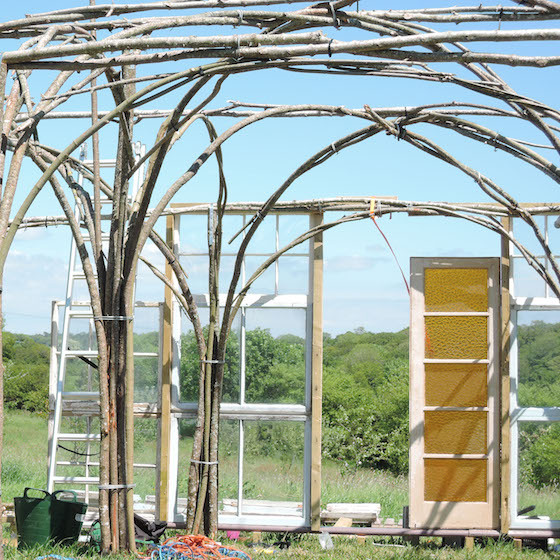 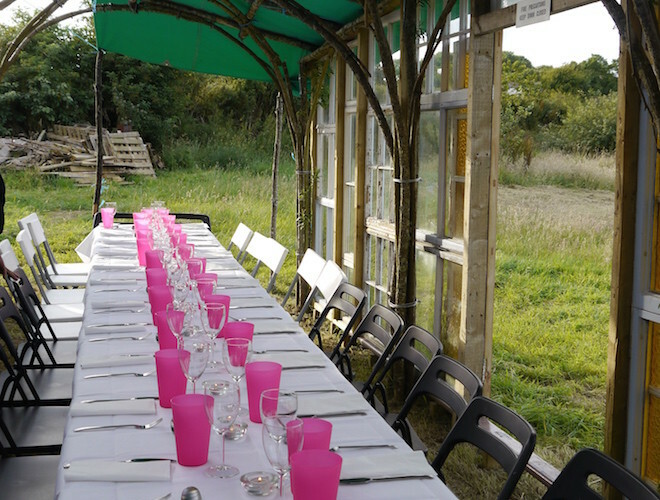 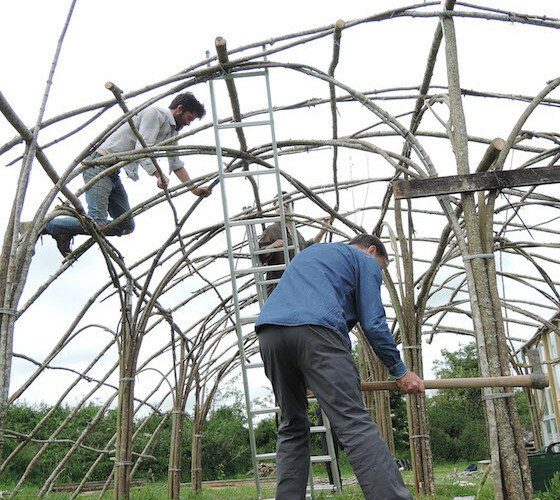 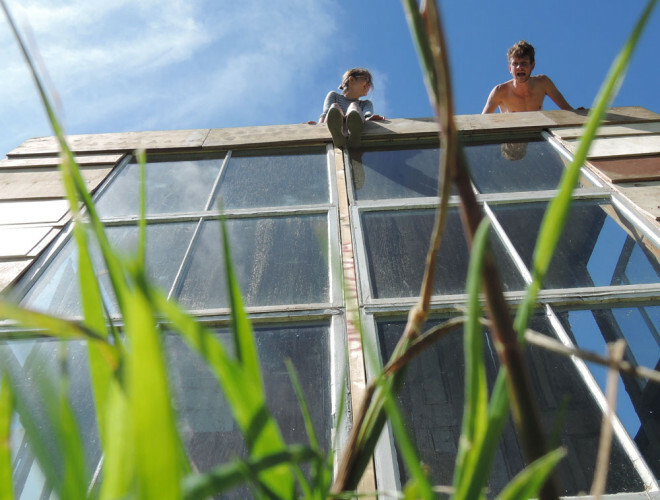 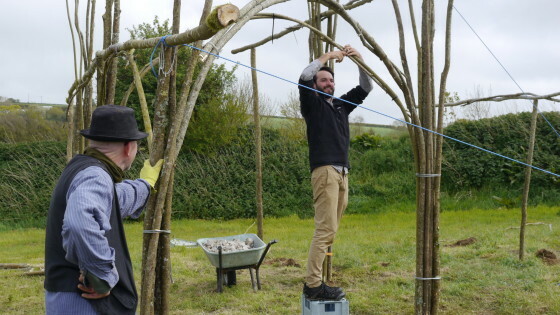 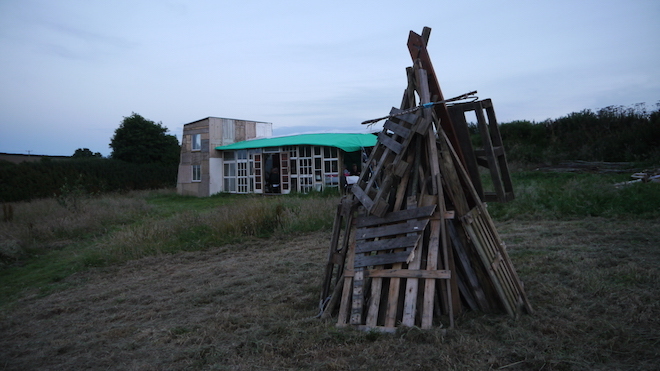 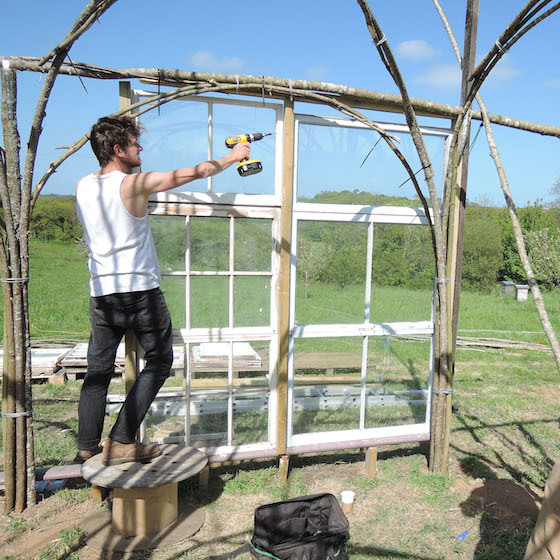 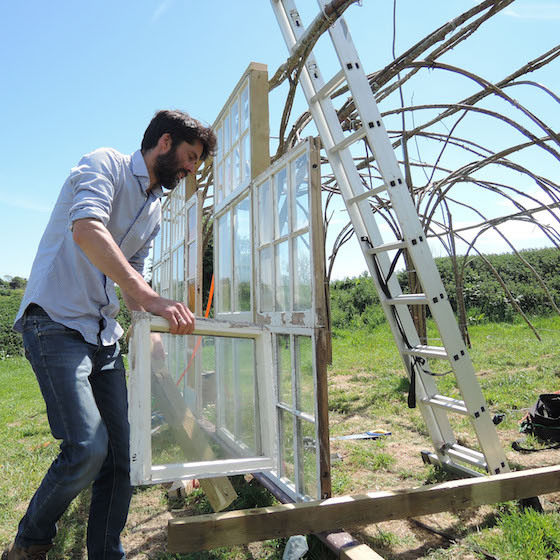 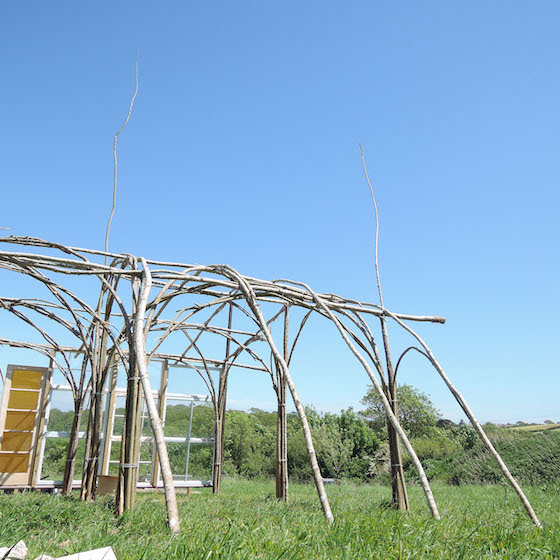 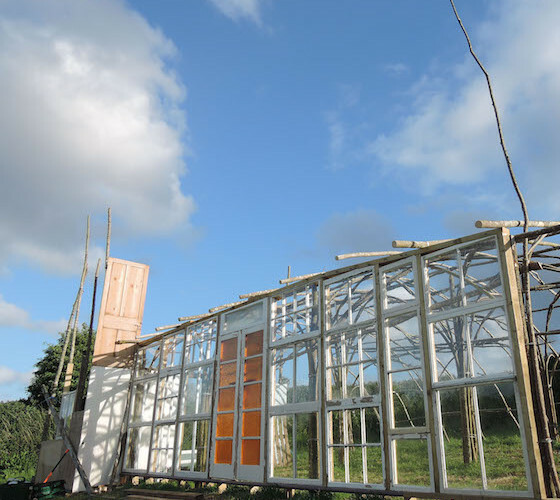 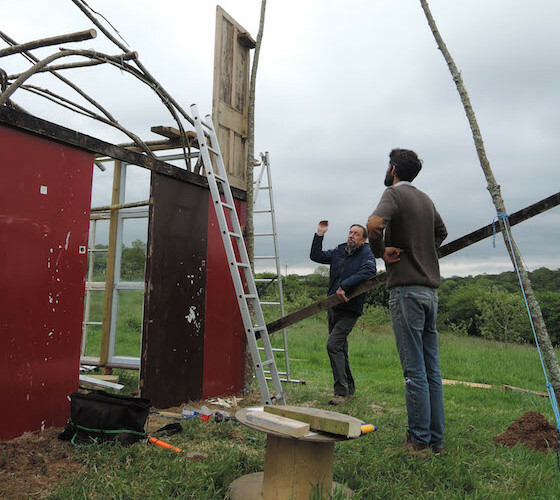 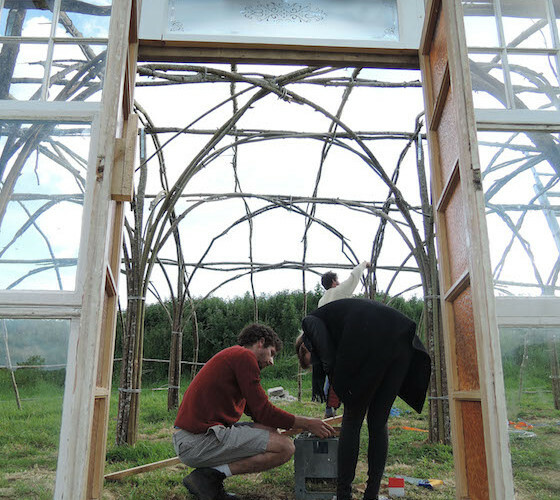 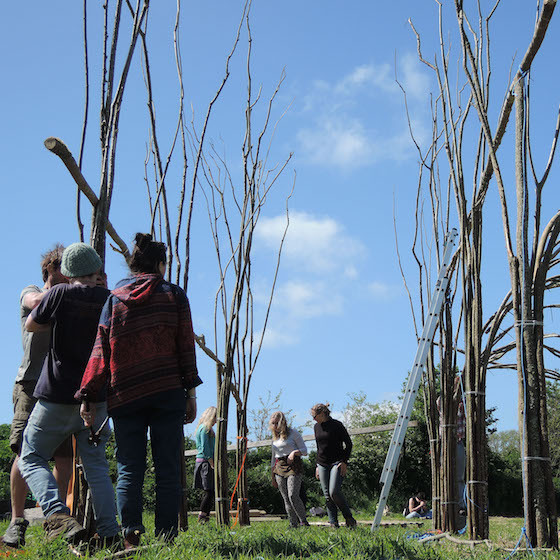 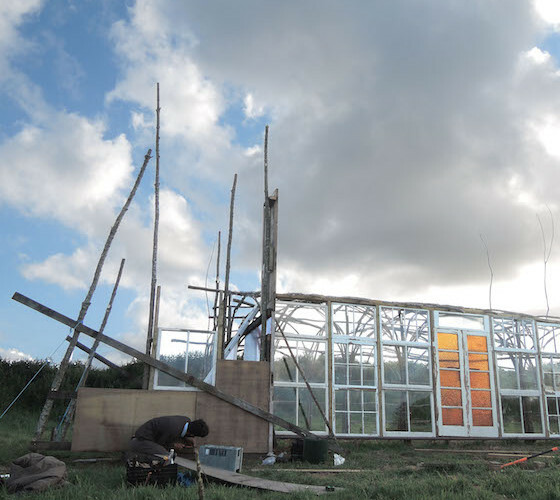 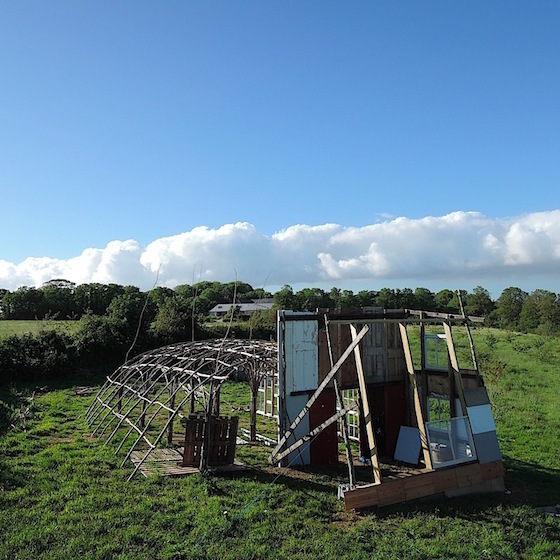 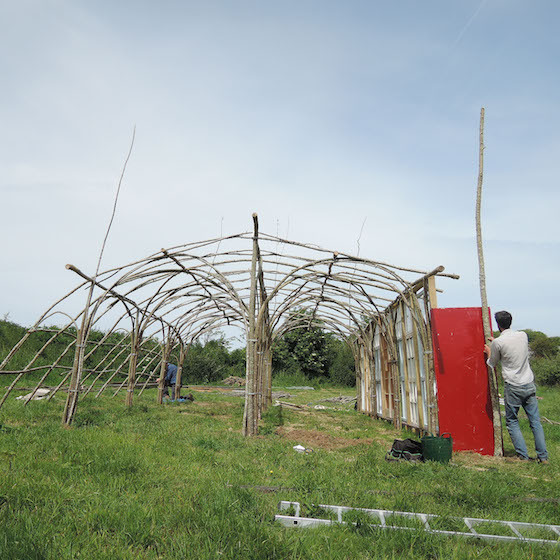 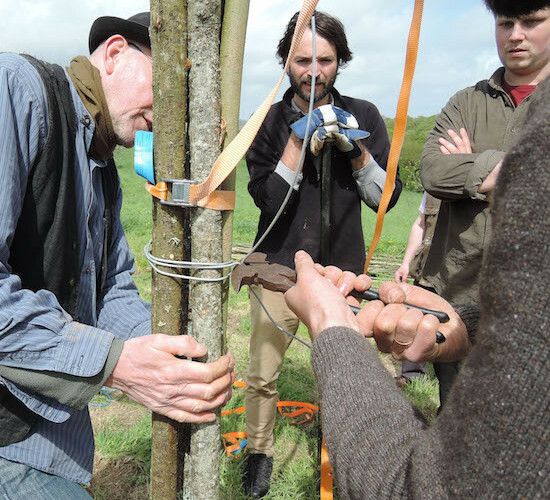 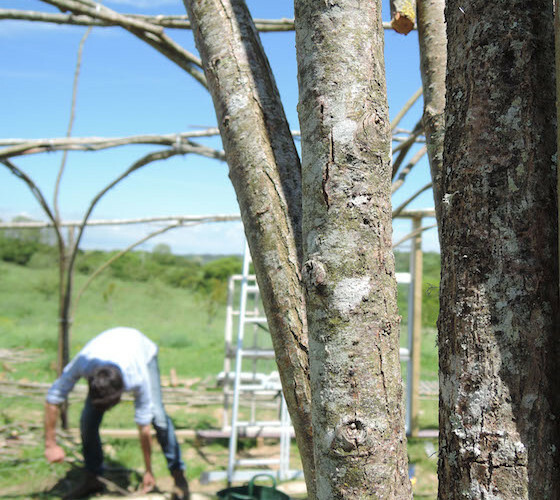 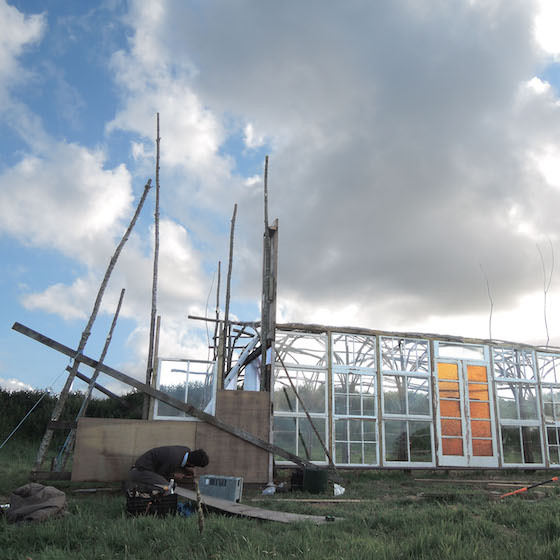 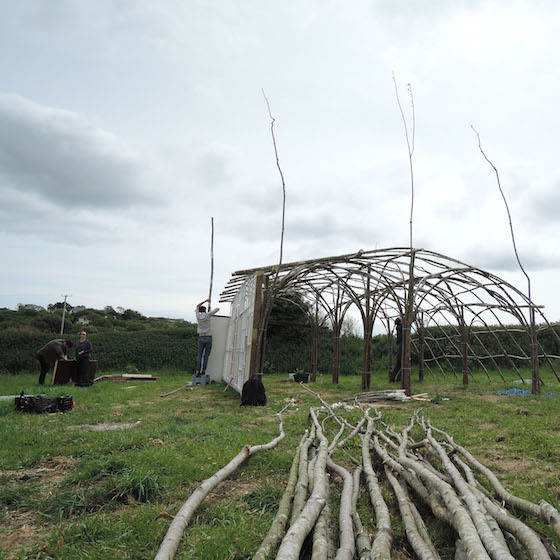 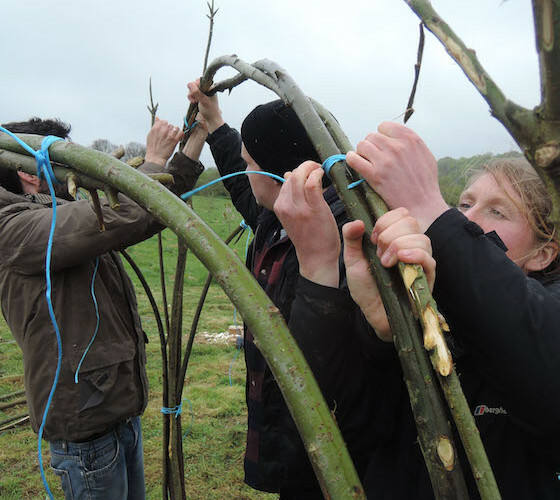 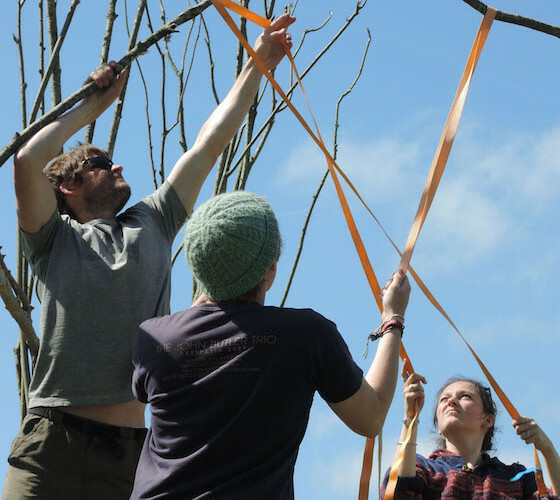 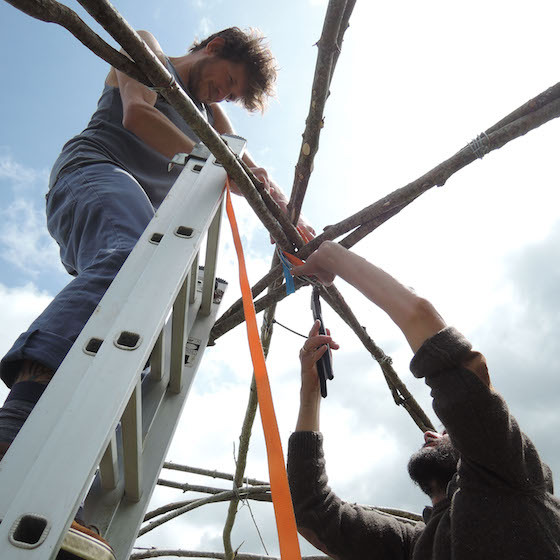 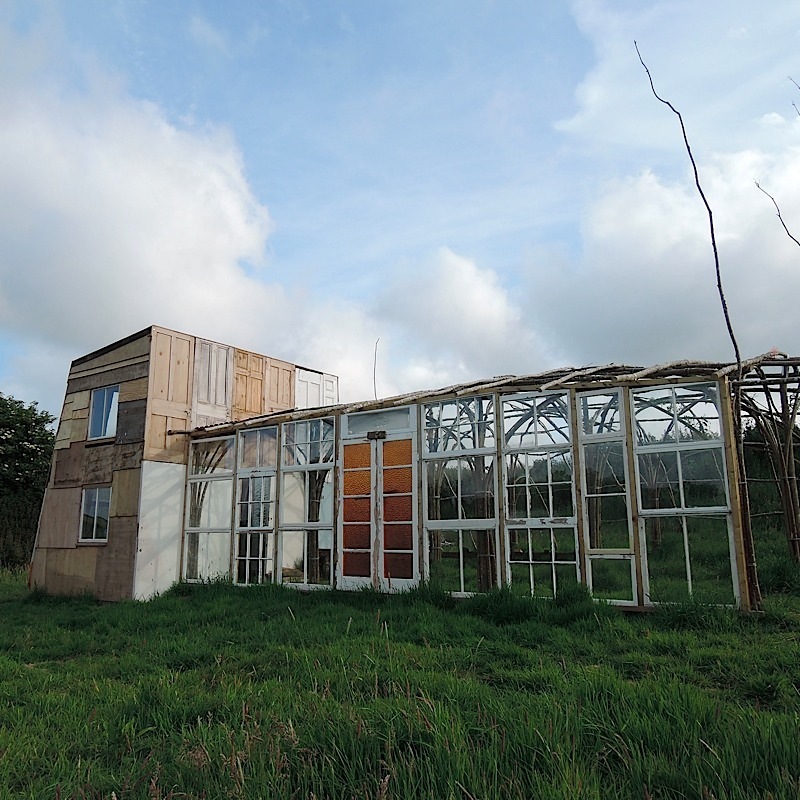 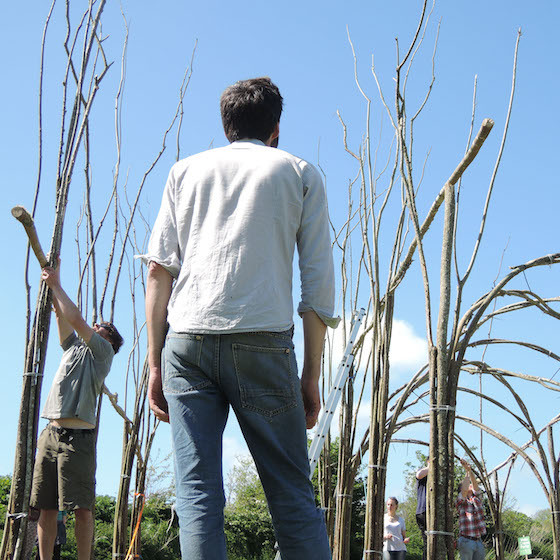 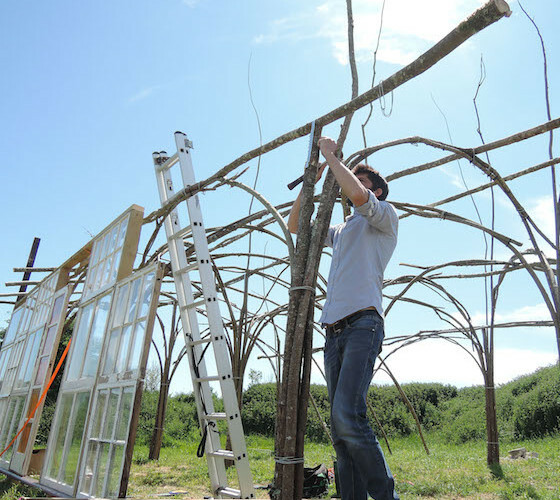 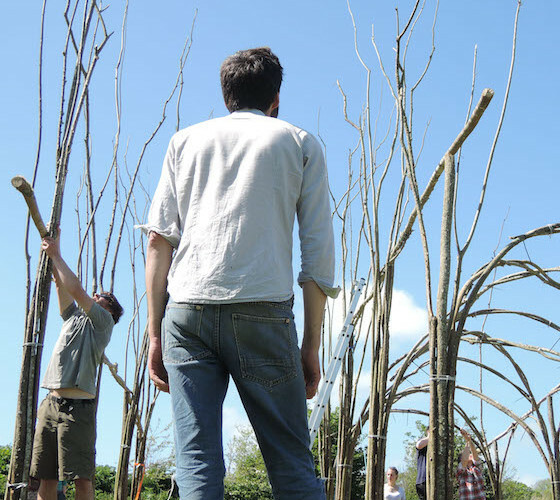 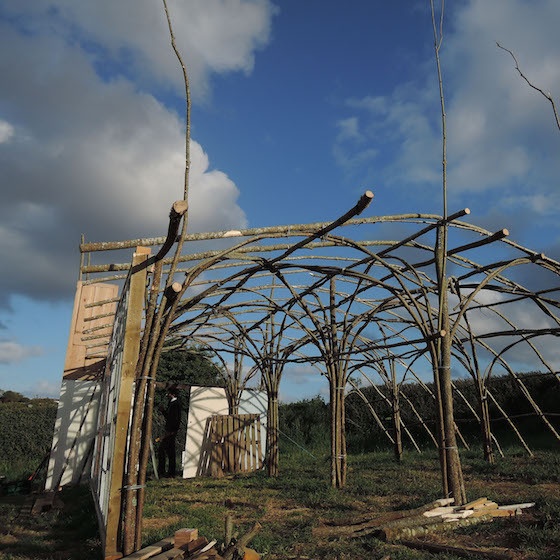 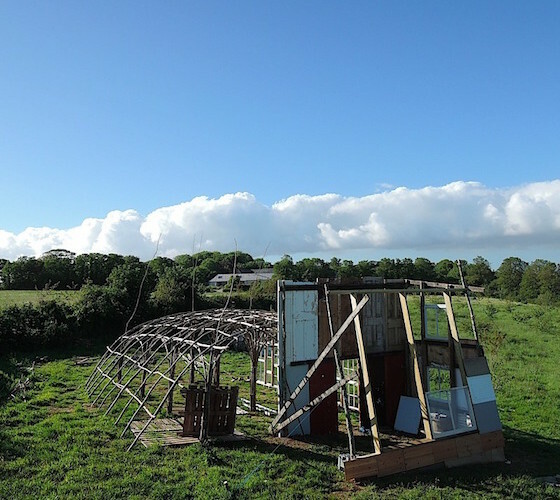 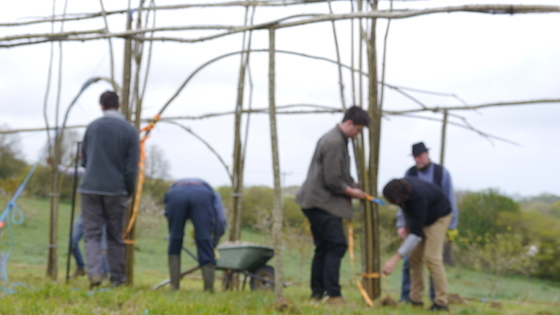 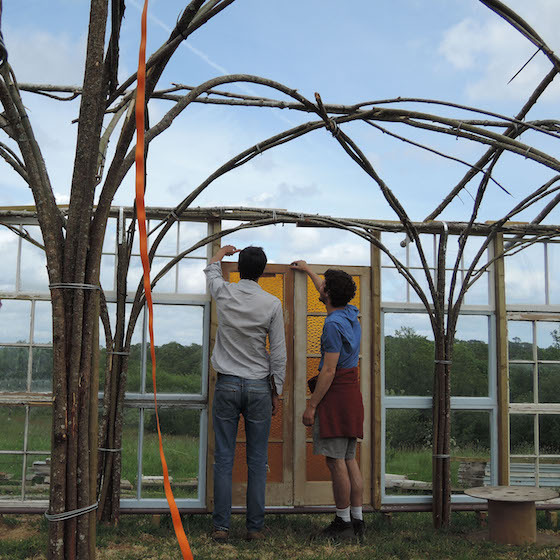 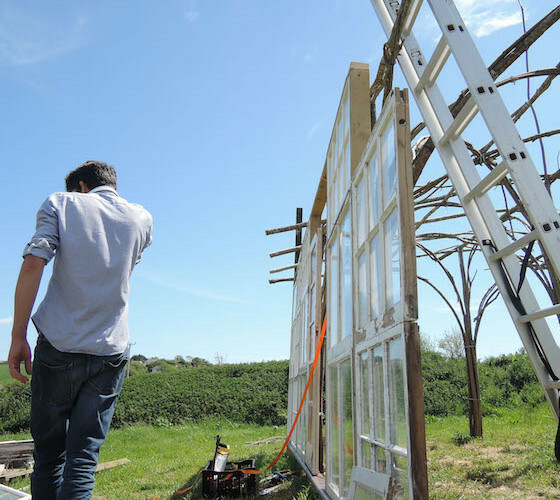 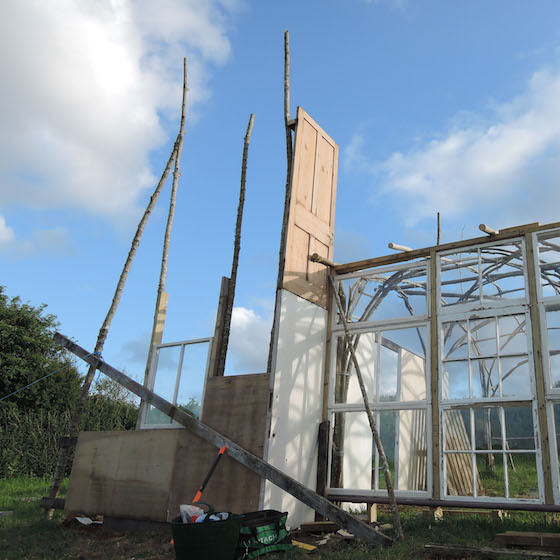 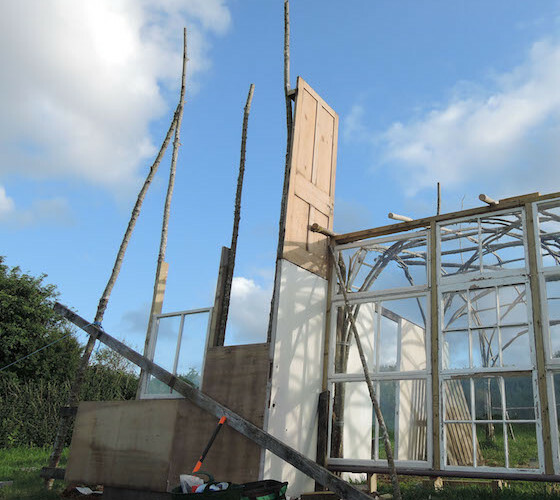 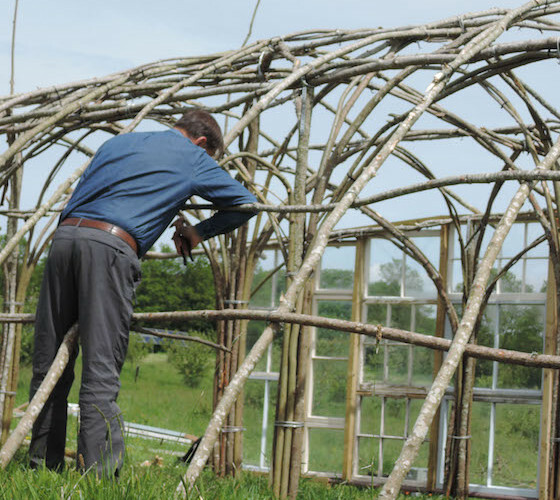 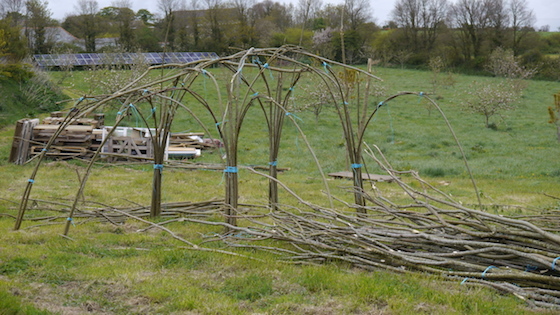 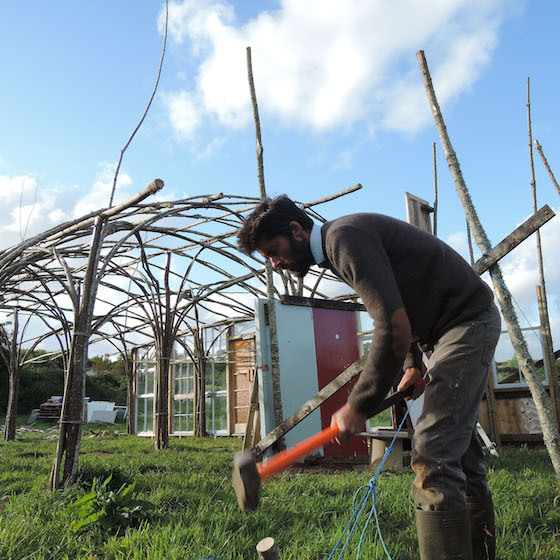 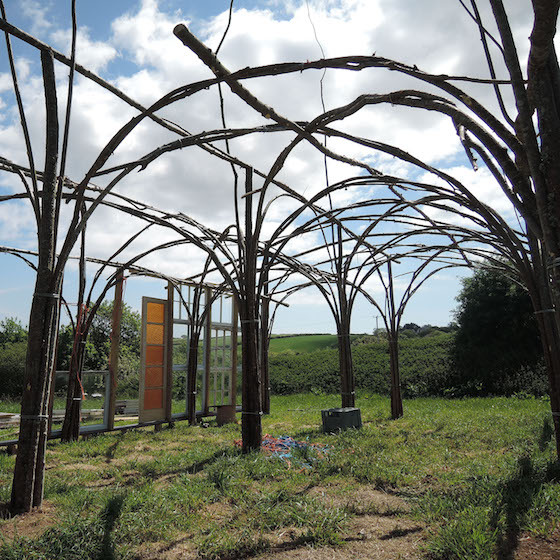 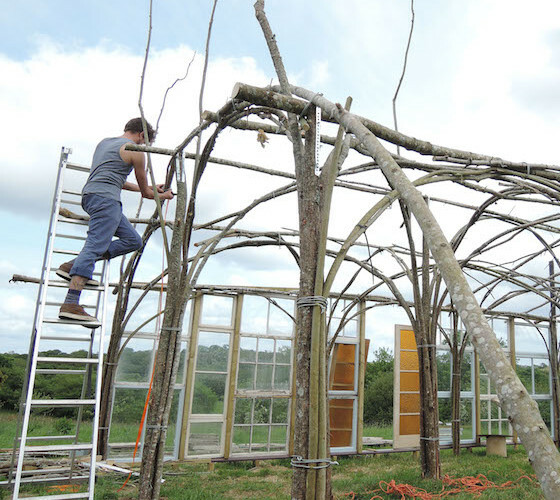 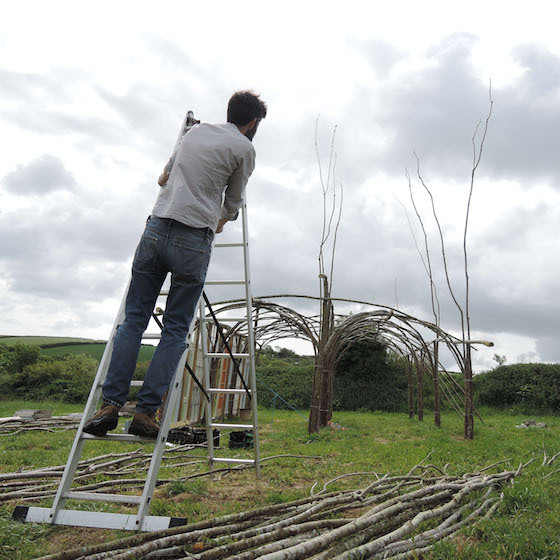 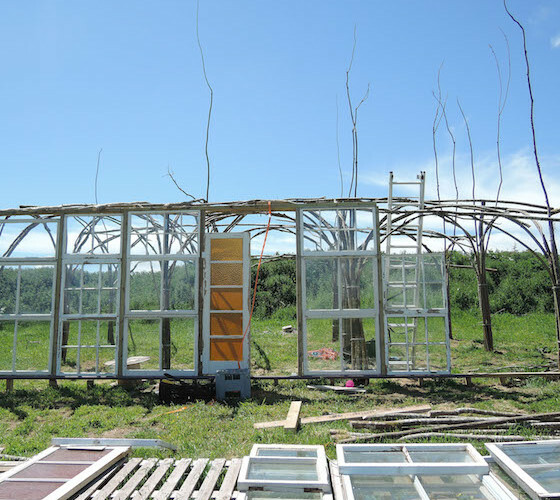 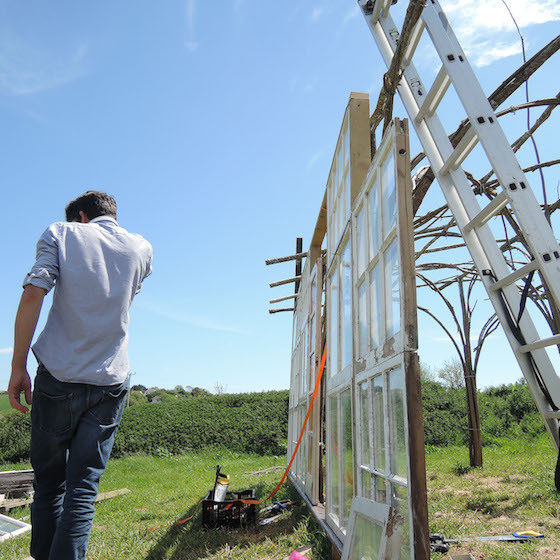 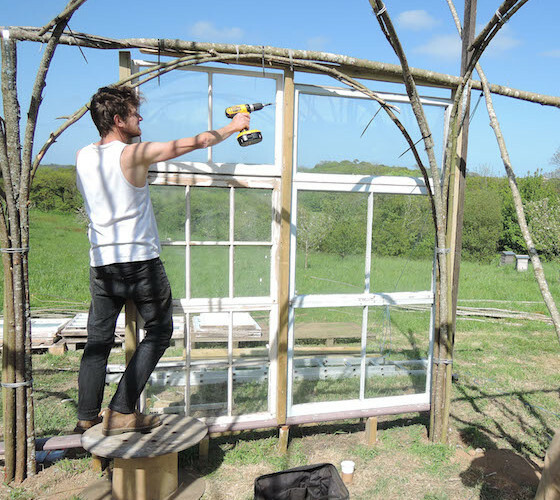 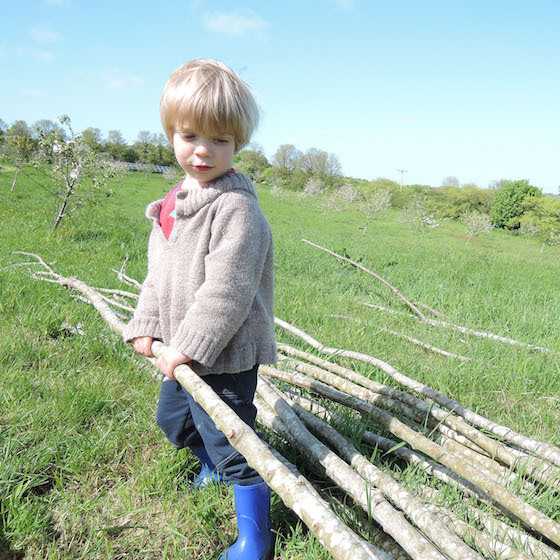 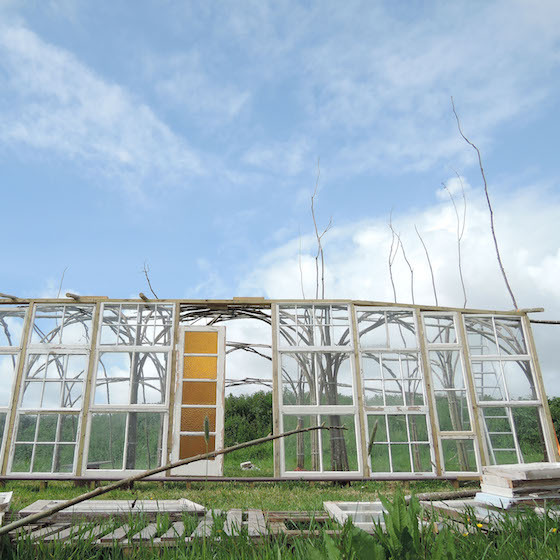 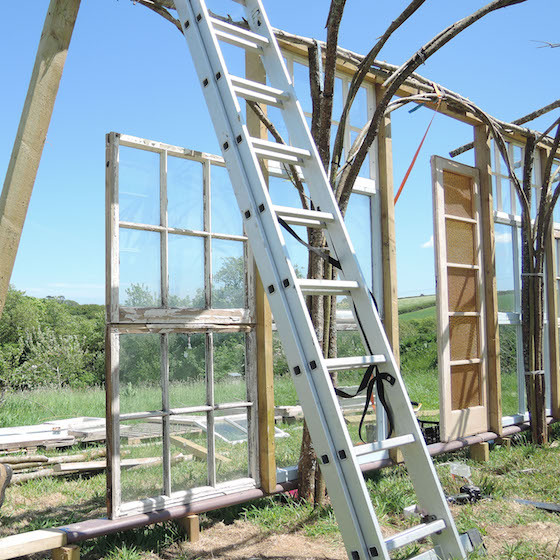 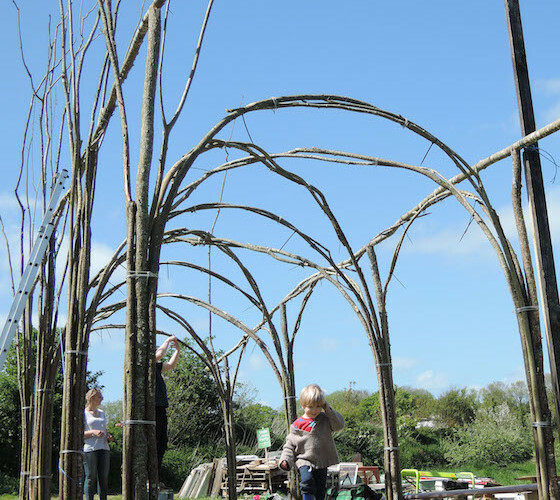 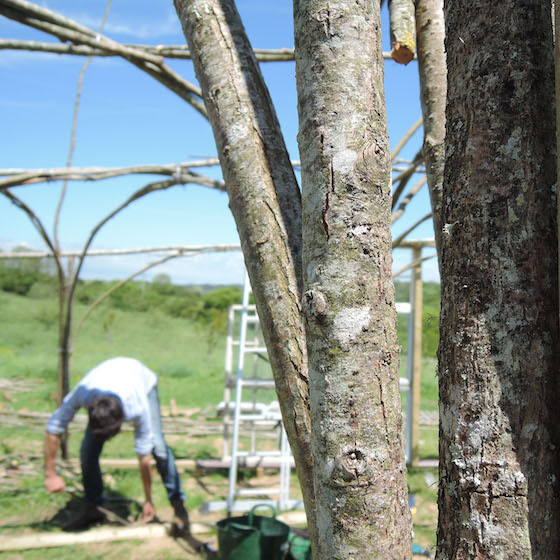 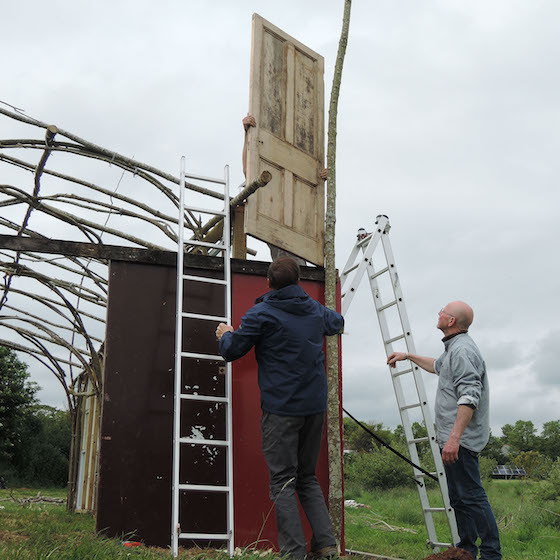 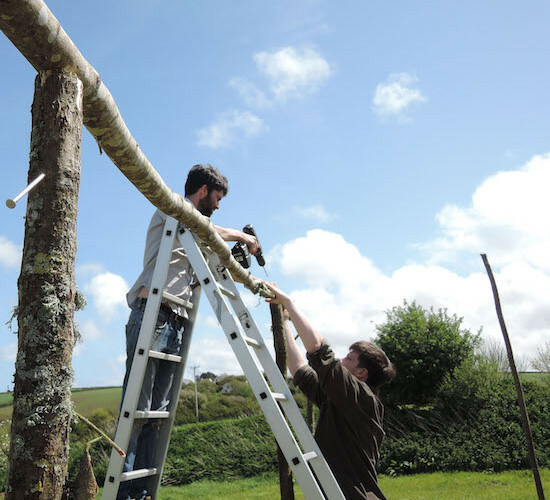 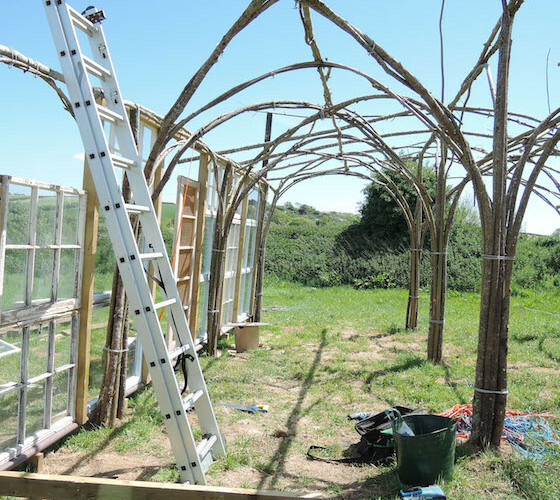 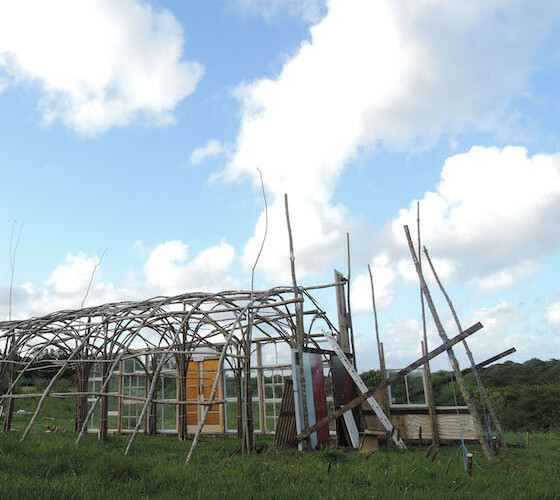 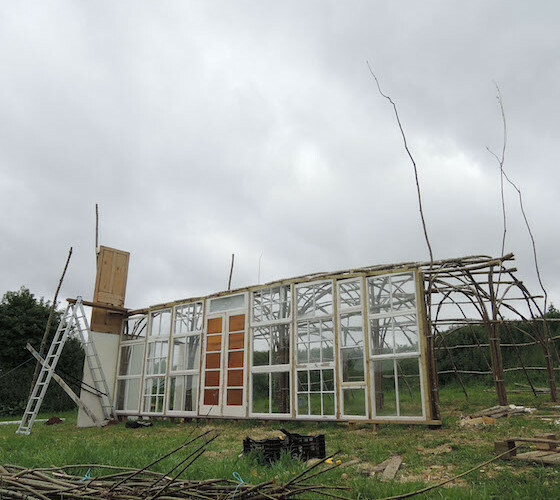 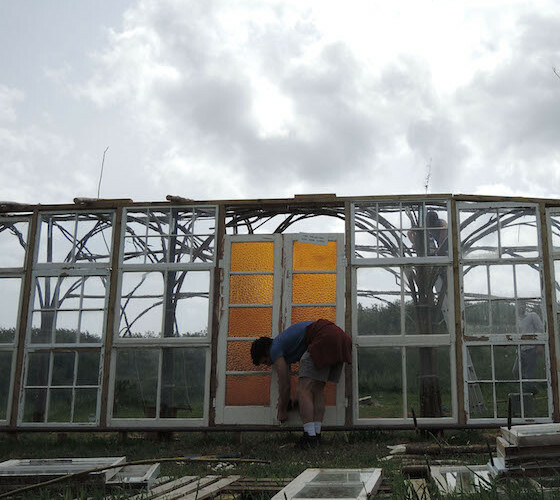 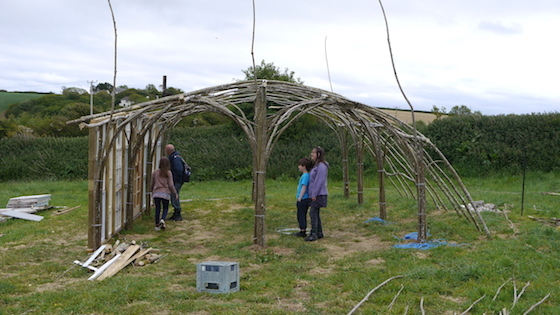 This structure, a continuation of Paul’s ongoing research into low impact ‘grass roots’ architecture, is an unprecedented exploration of building with bent willow and found waste. 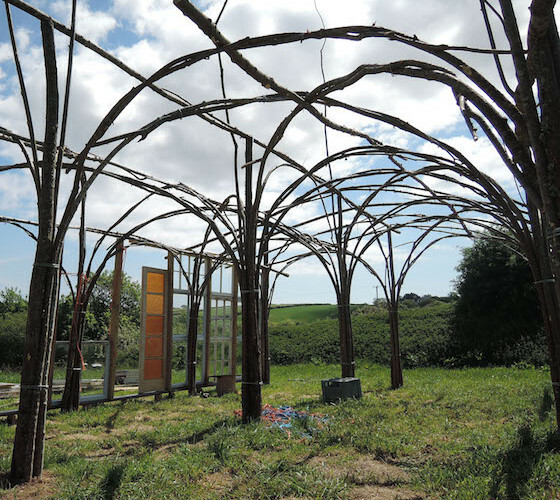 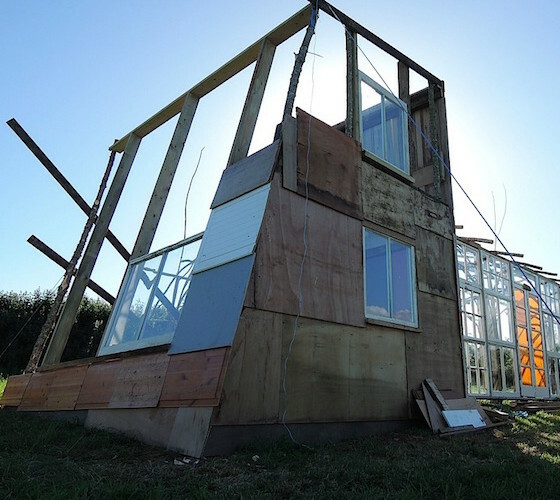 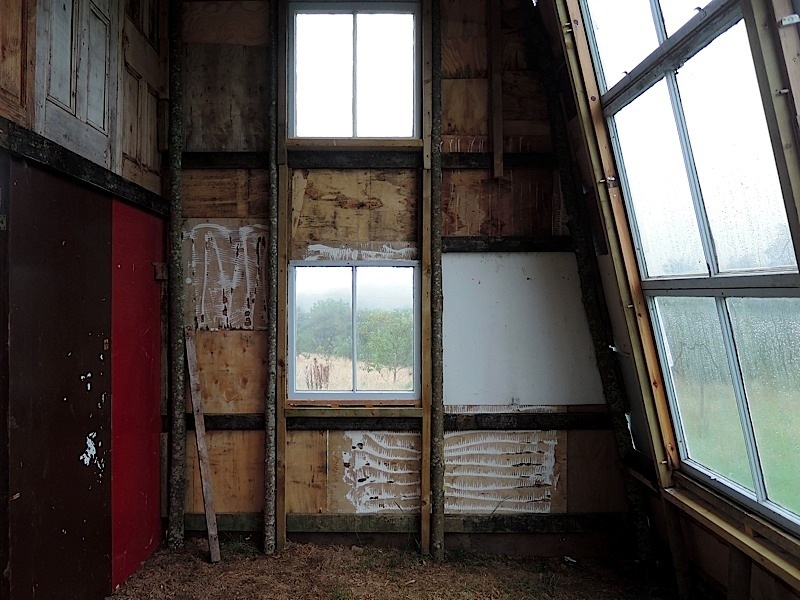 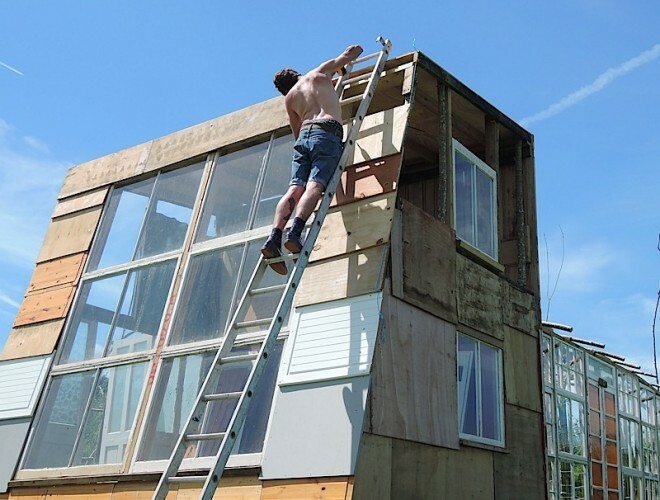 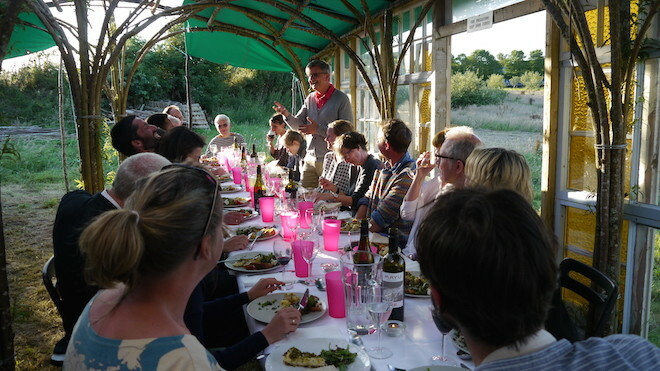 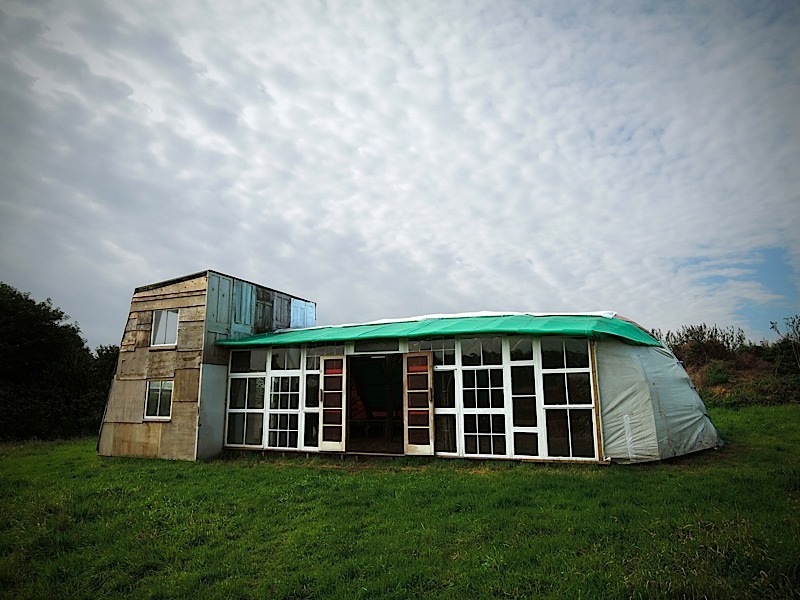 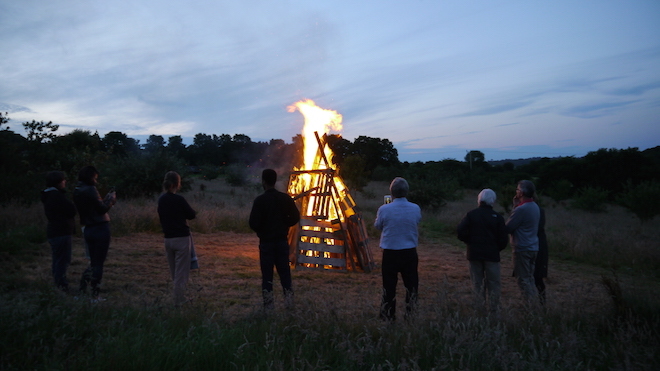 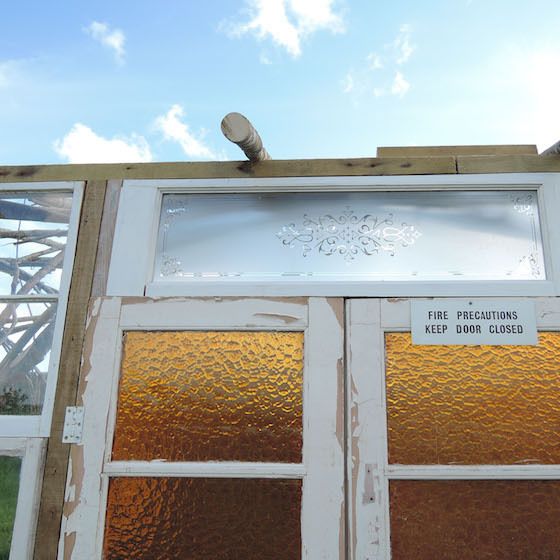 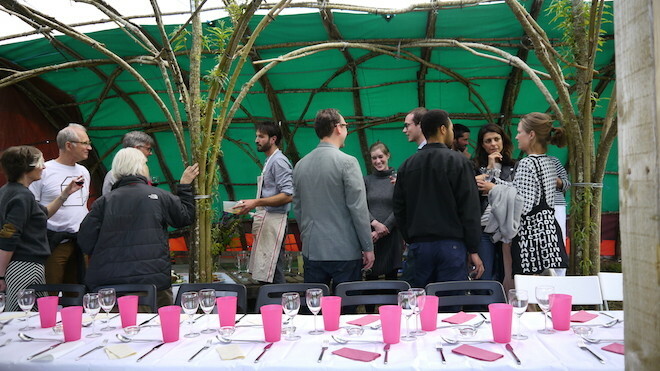 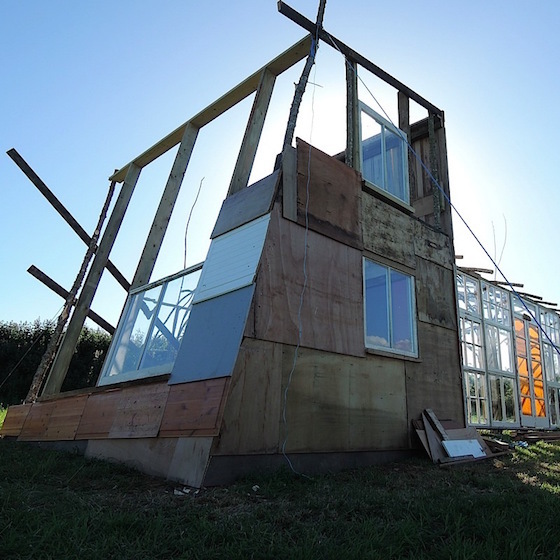 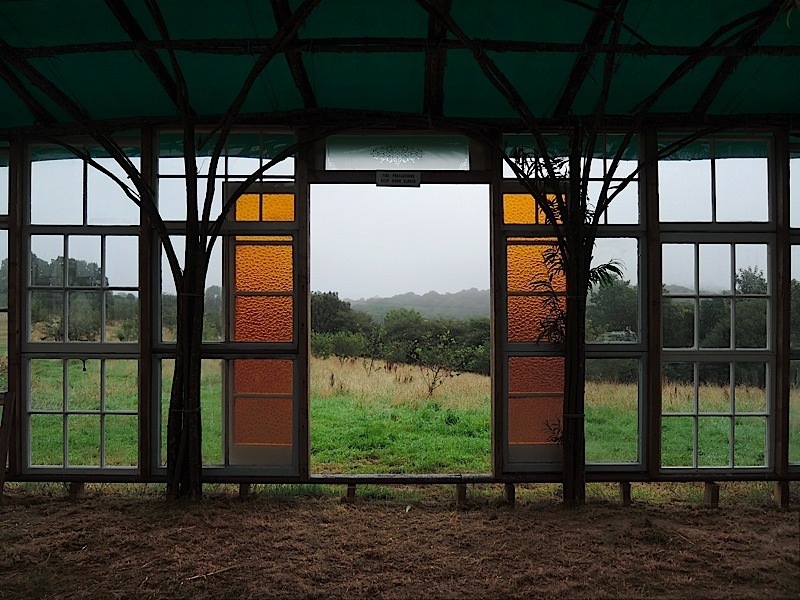 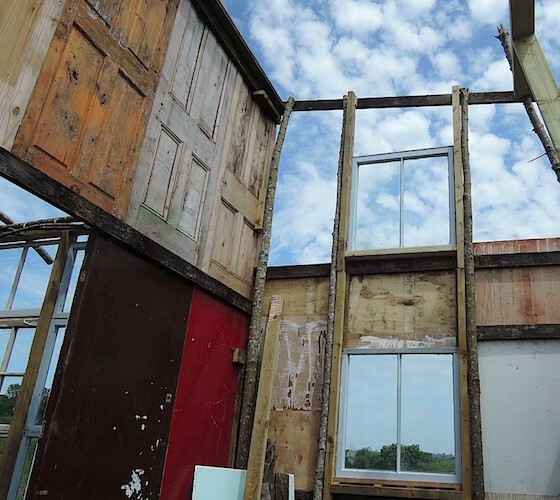 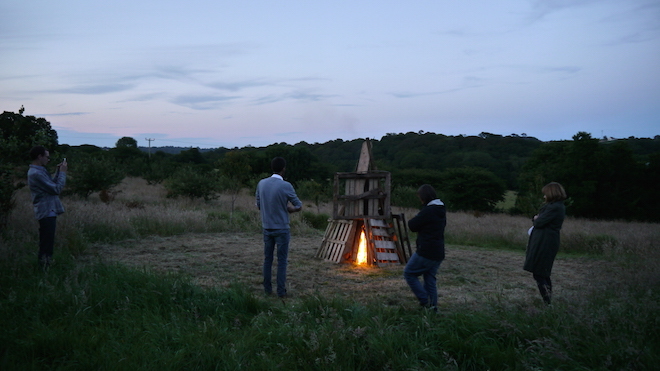 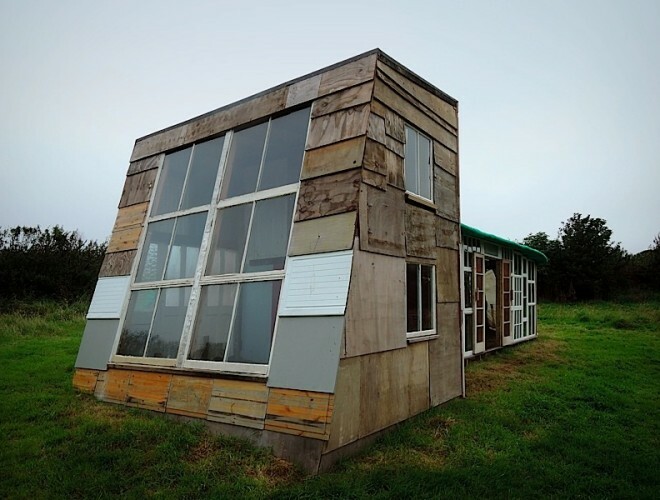 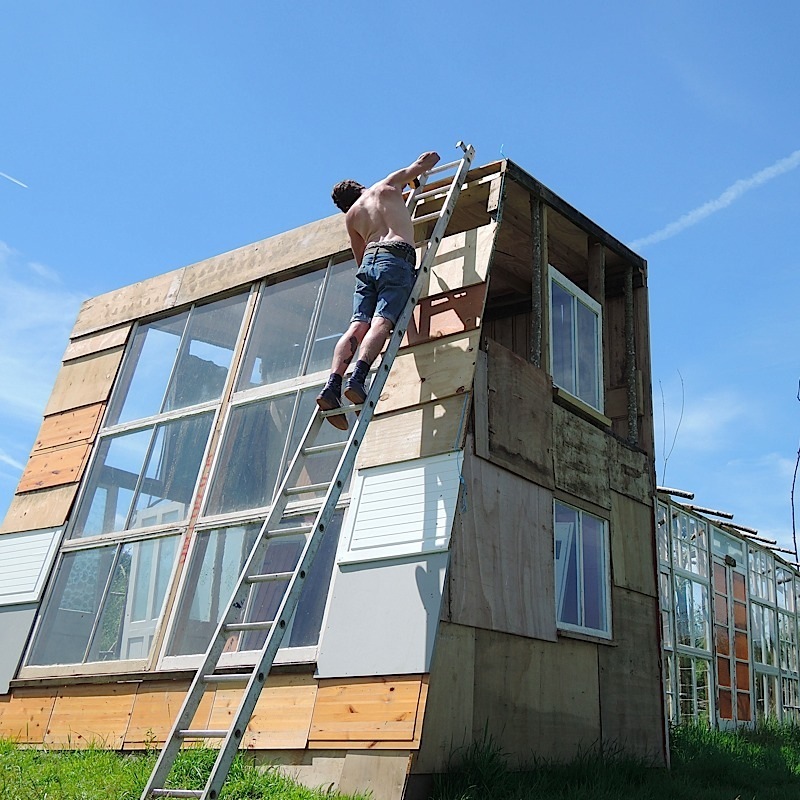 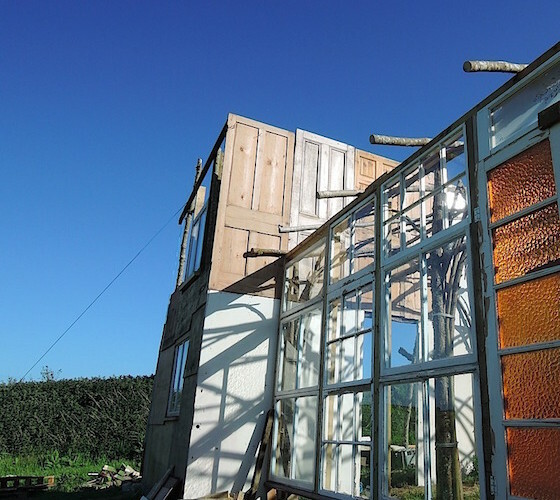 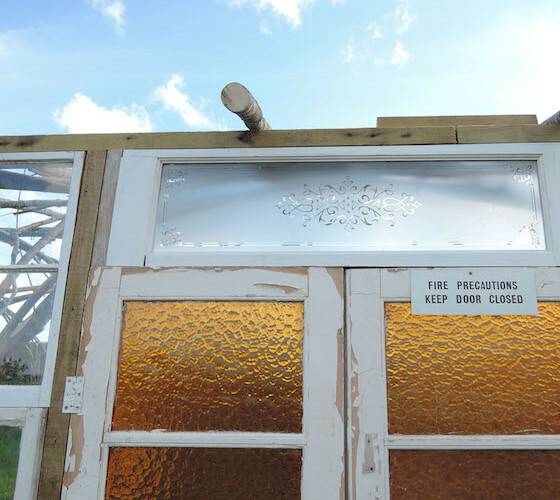 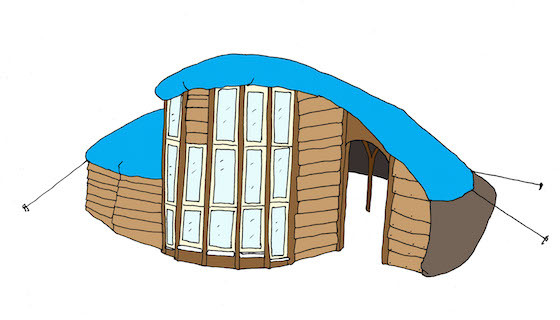 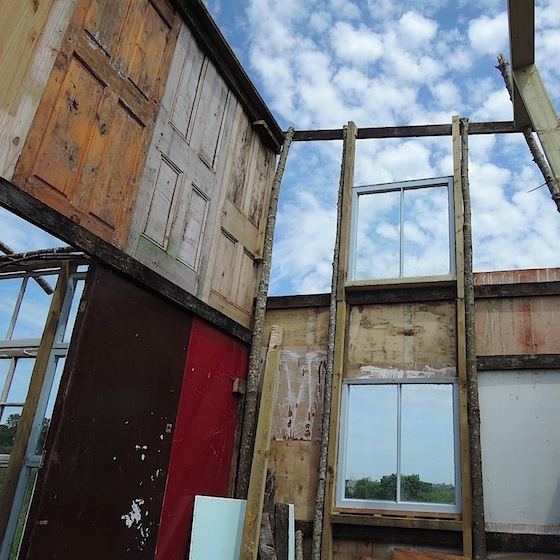 Made using only traditional vernacular building techniques and post-consumer waste, and built during a series of public workshops, The Pavilion will house some of Kestle Barton’s summer events for this year (2015) and next season. 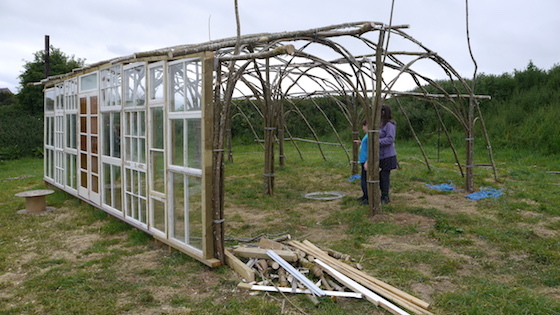 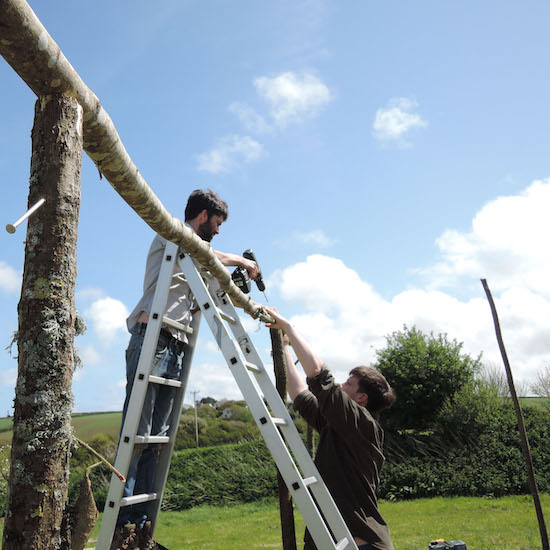 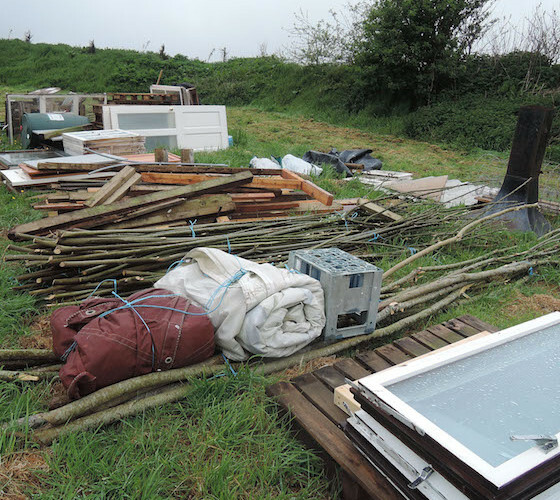 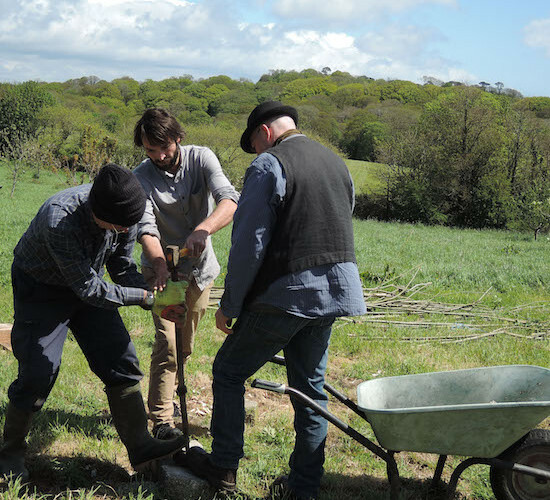 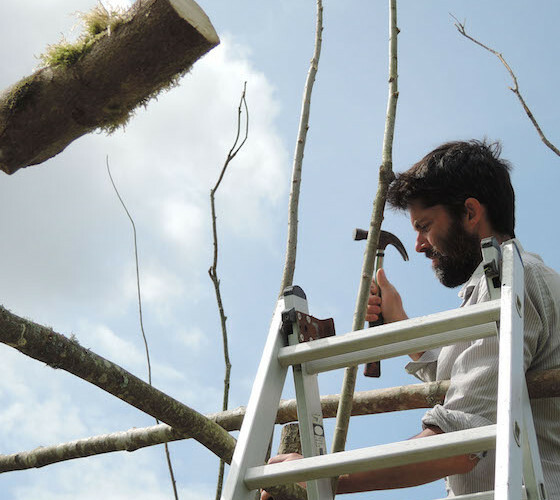 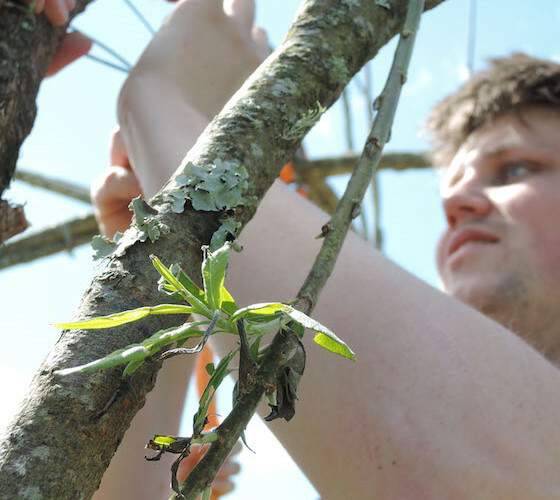 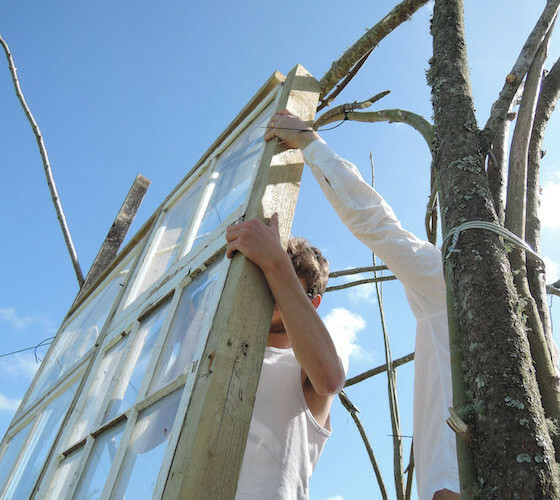 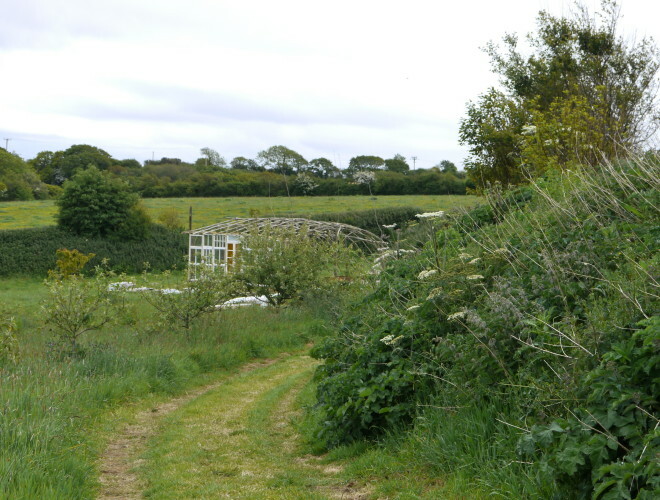 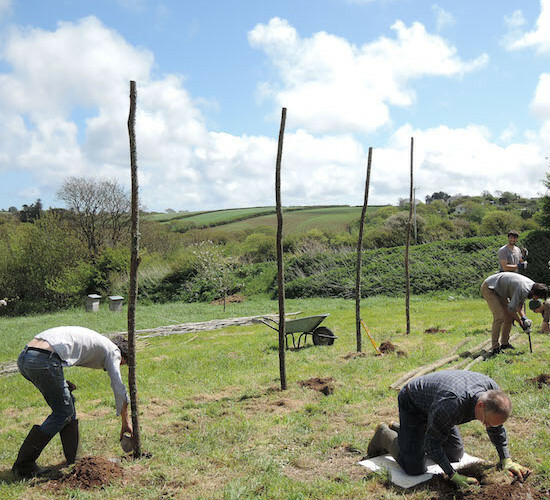 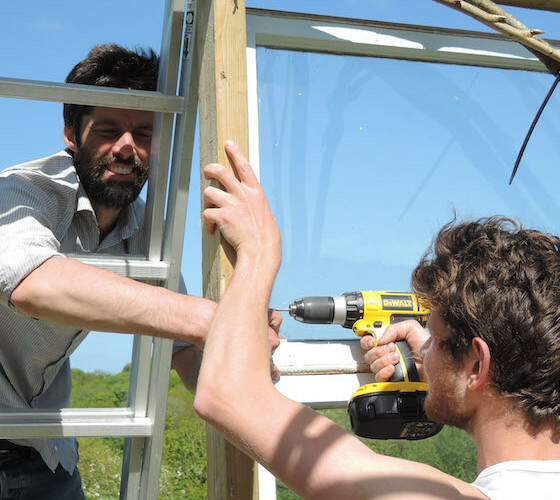 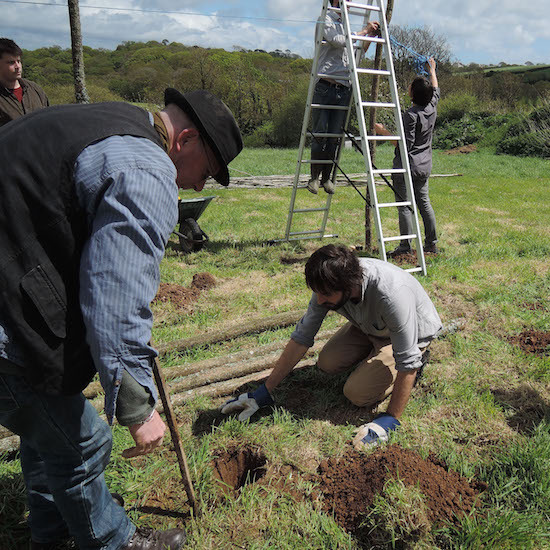 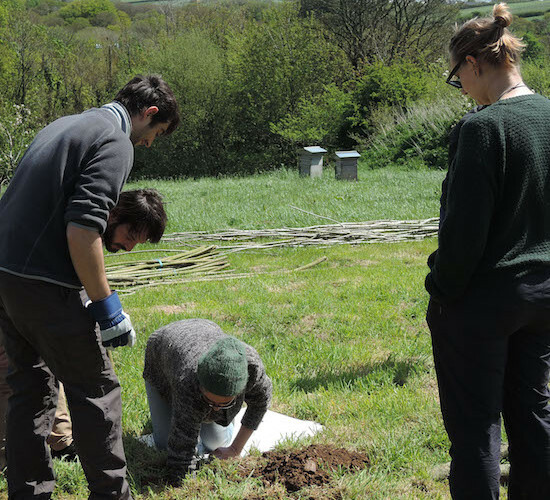 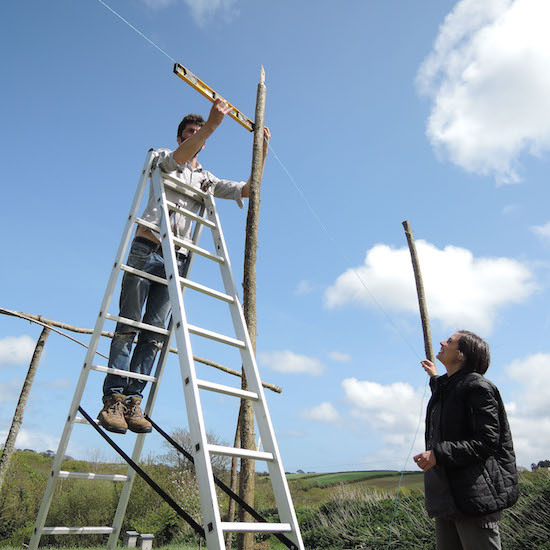 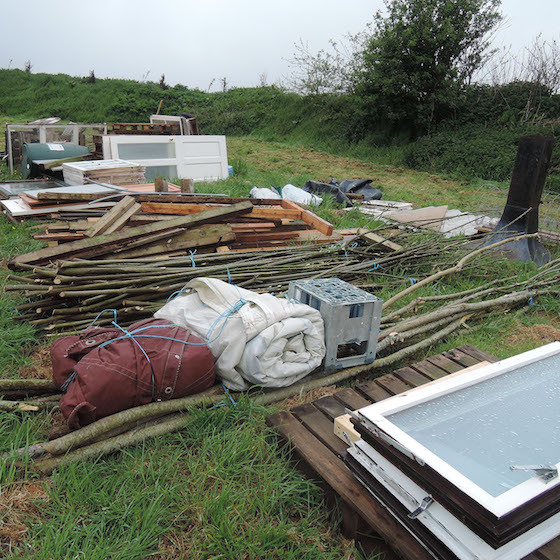 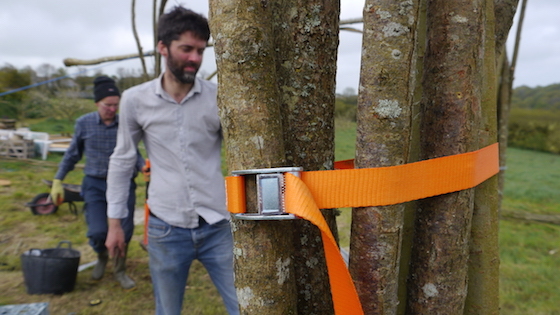 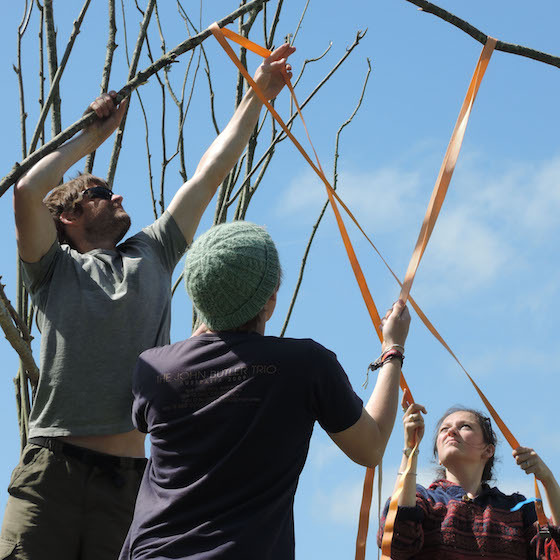 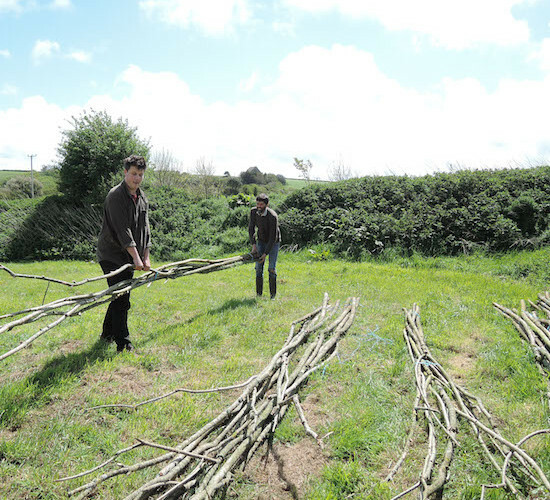 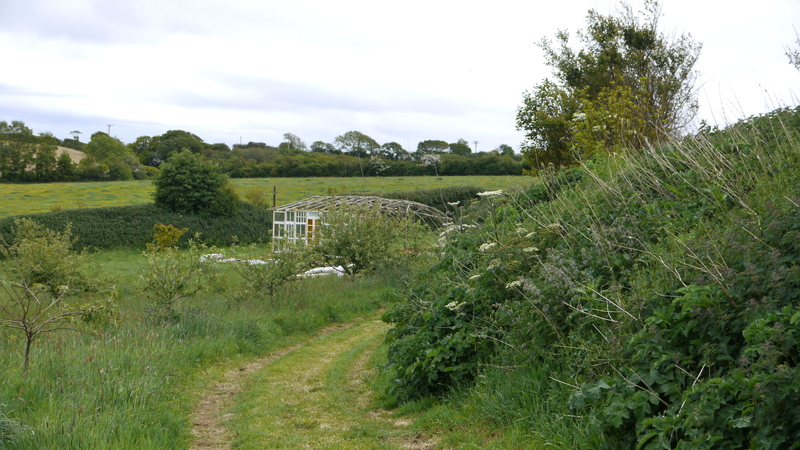 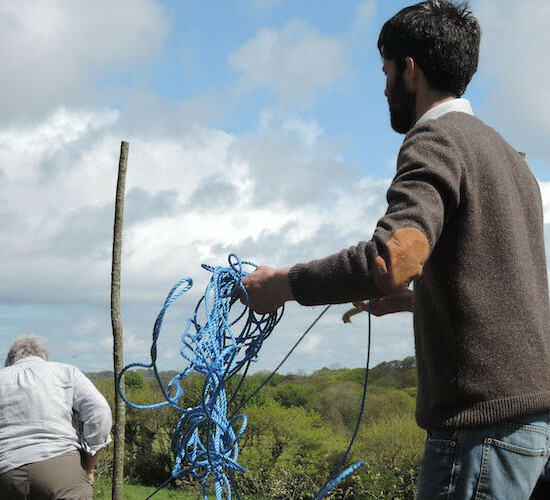 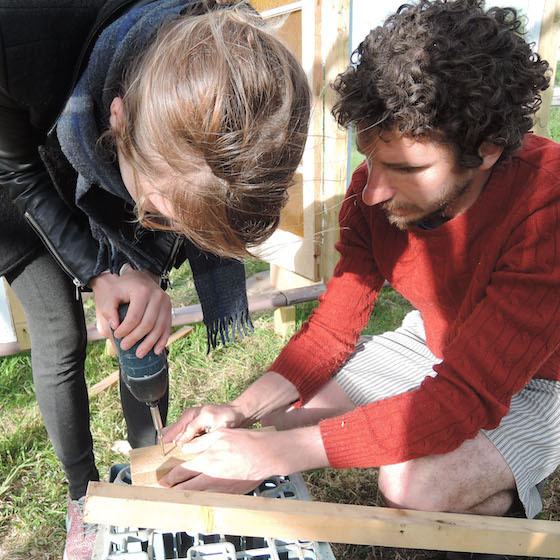 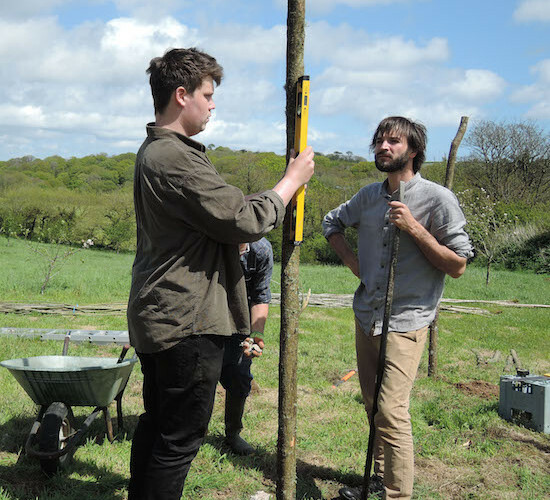 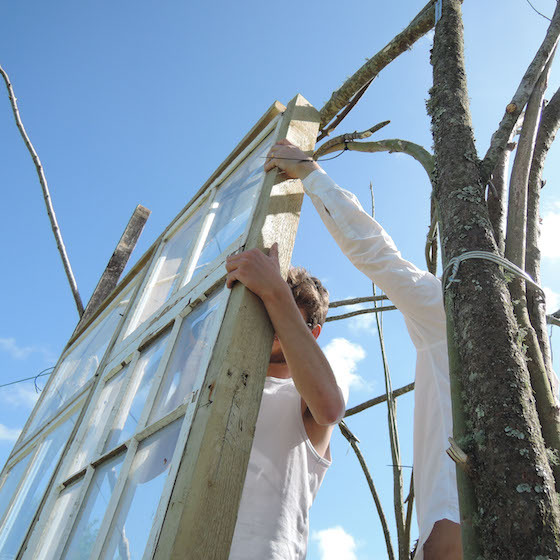 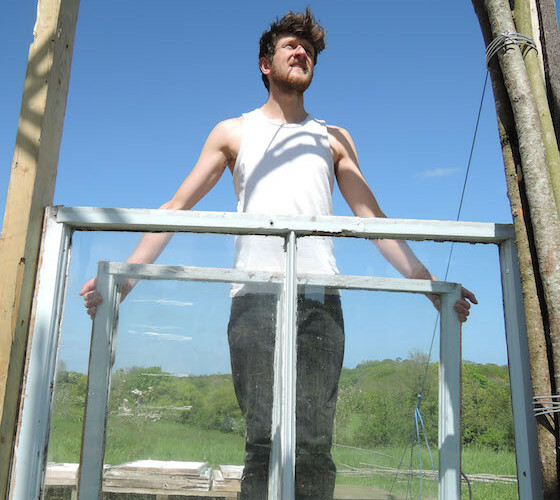 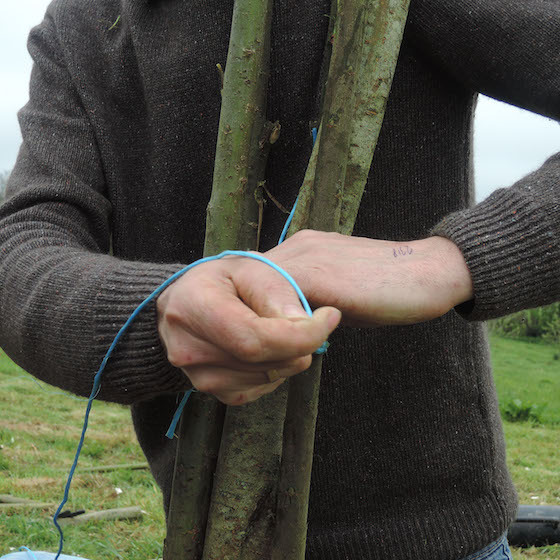 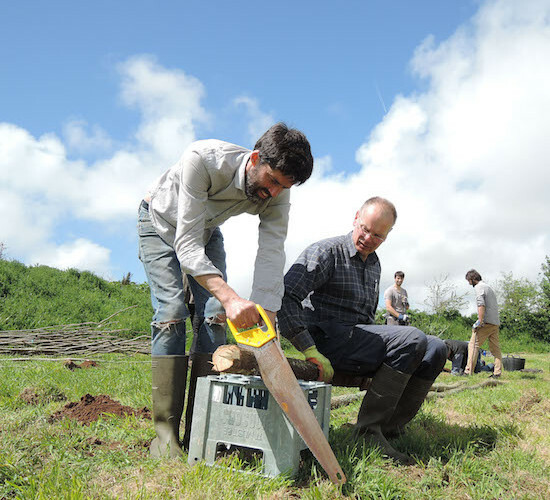 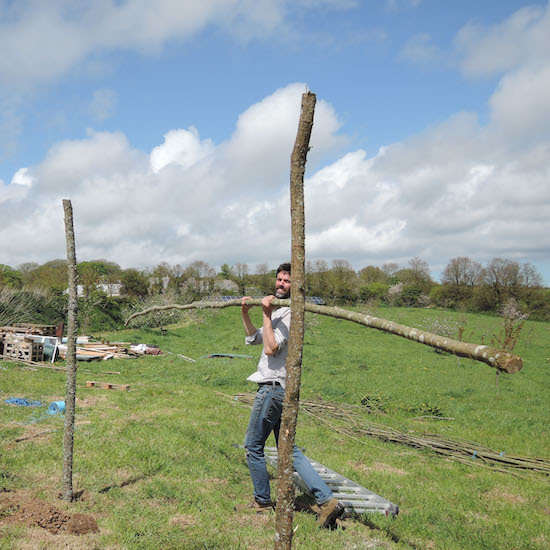 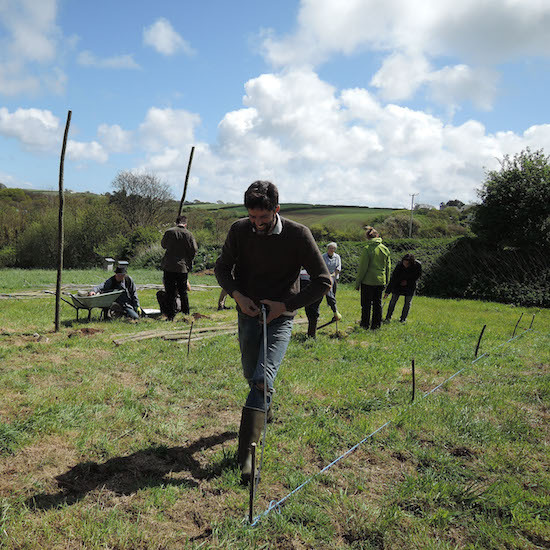 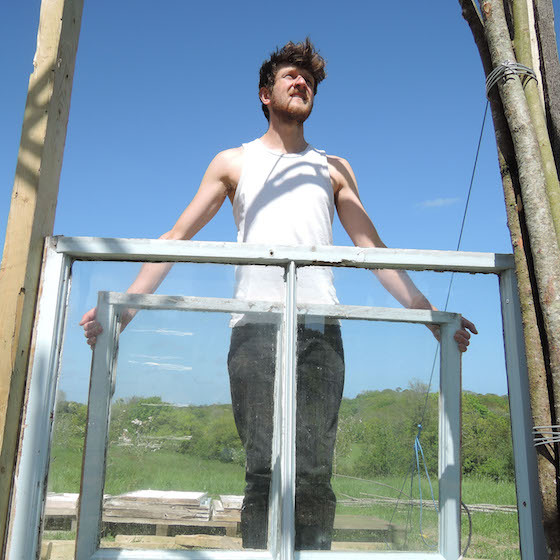 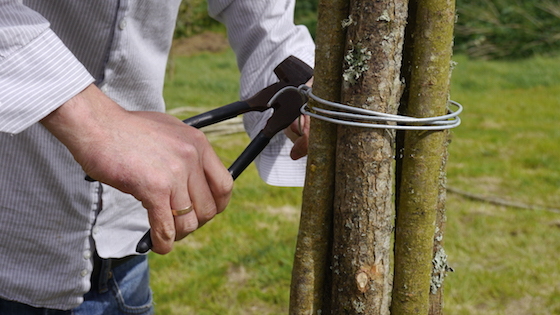 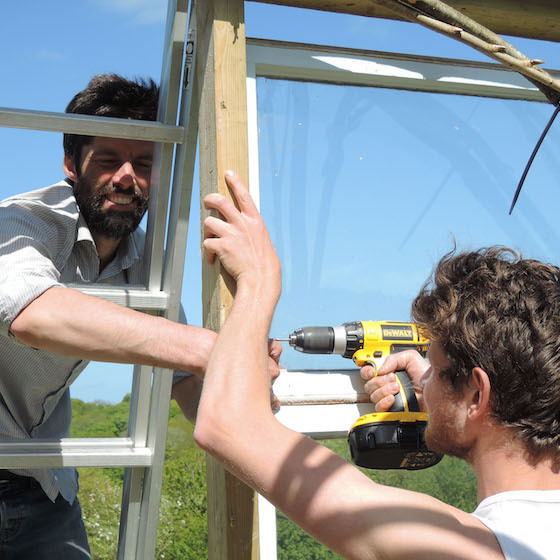 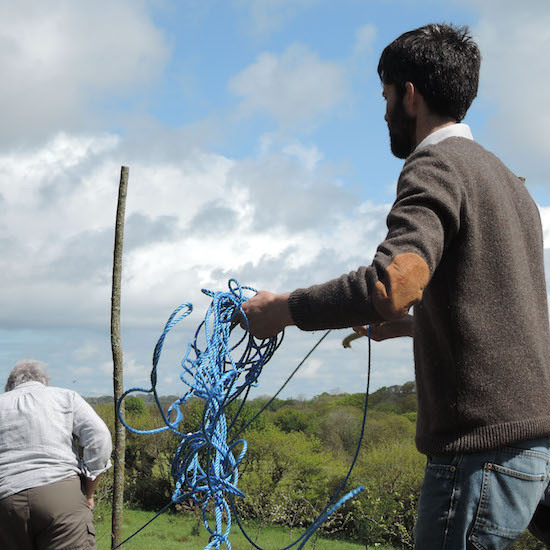 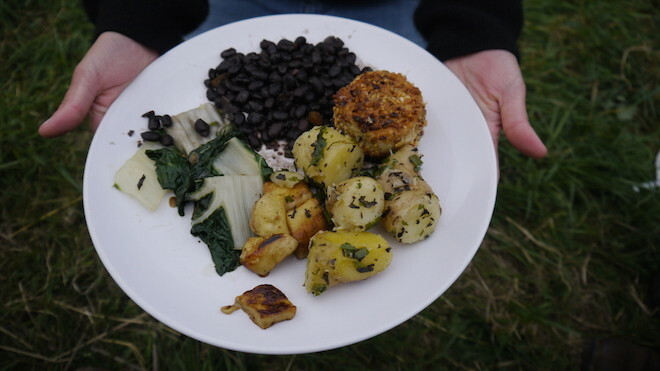 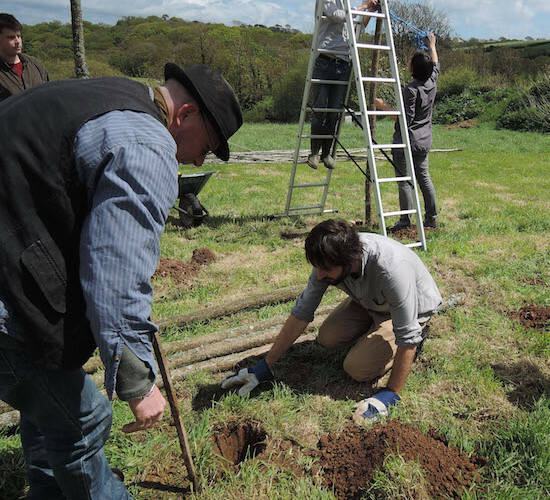 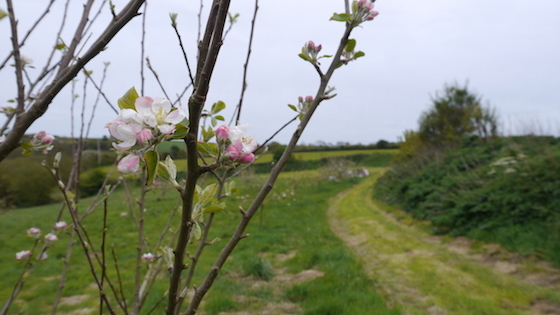 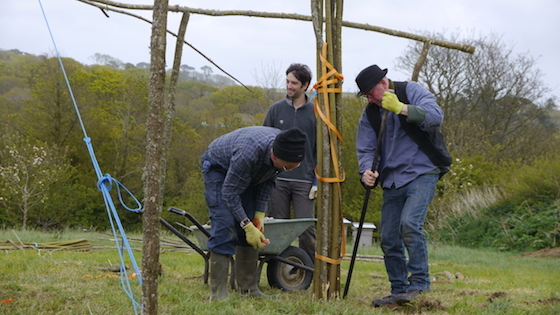 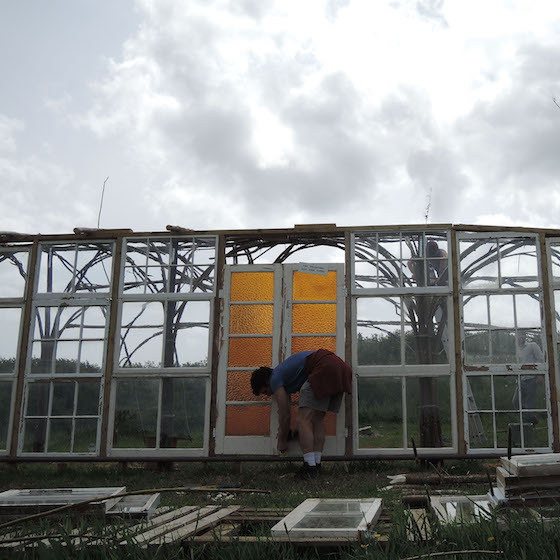 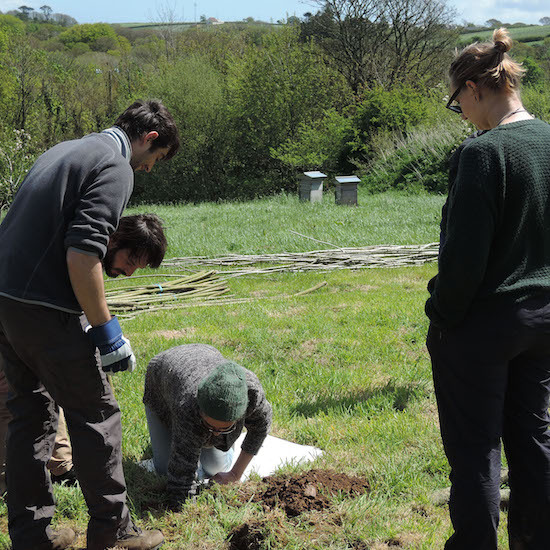 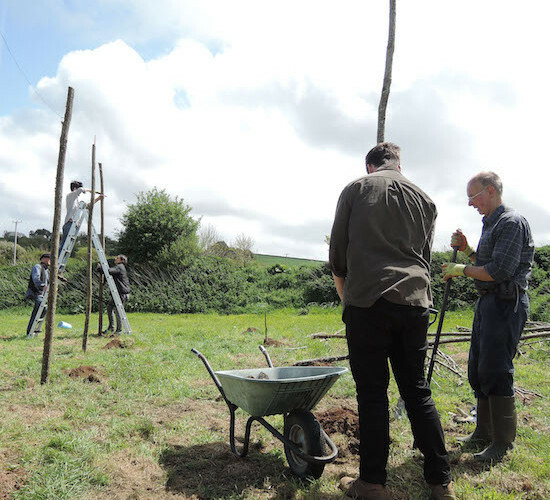 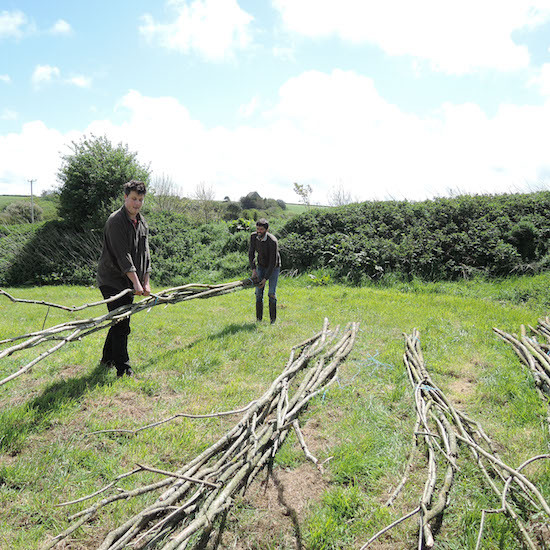 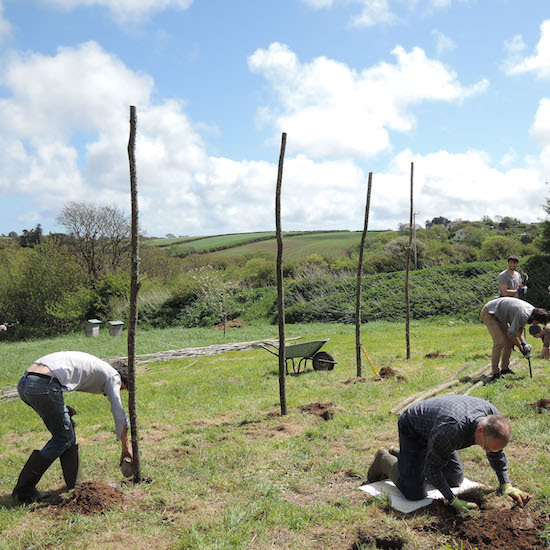 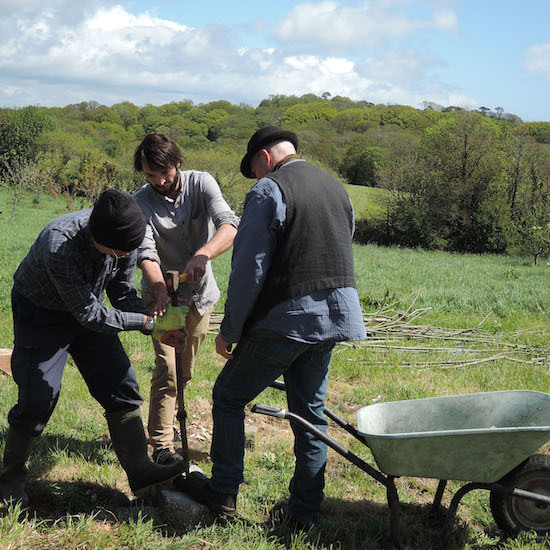 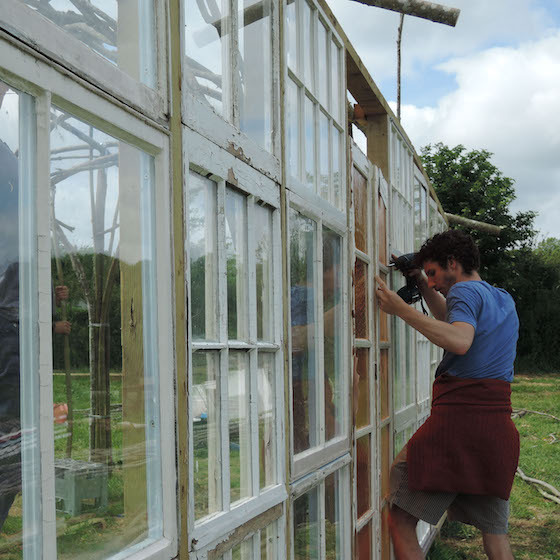 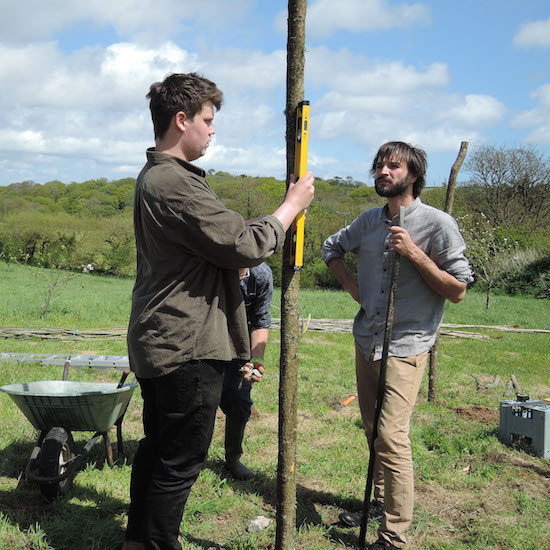 Volunteers worked with Paul on this project in a series of structured workshop days throughout May. 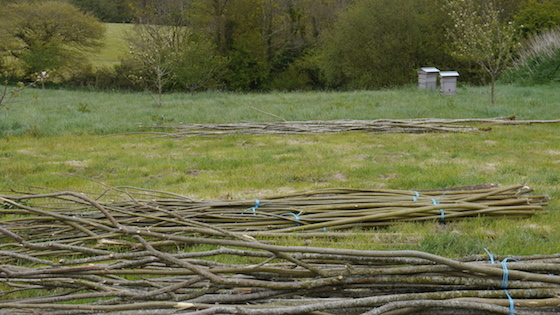 Additional work was also done by Paul and other individuals. 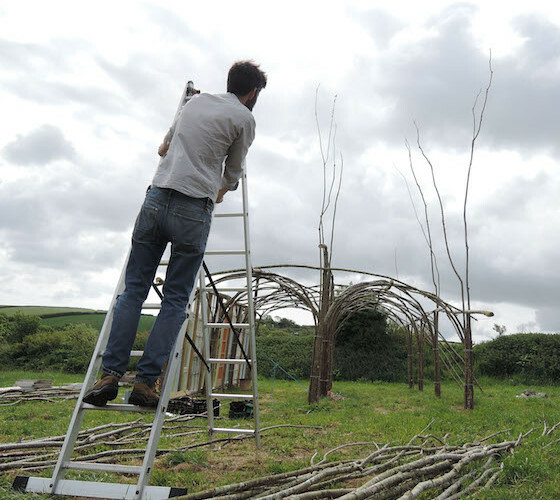 Last of the formal workshop days – however Paul will continue to work into June so if there is further interest in working with him please contact the gallery. 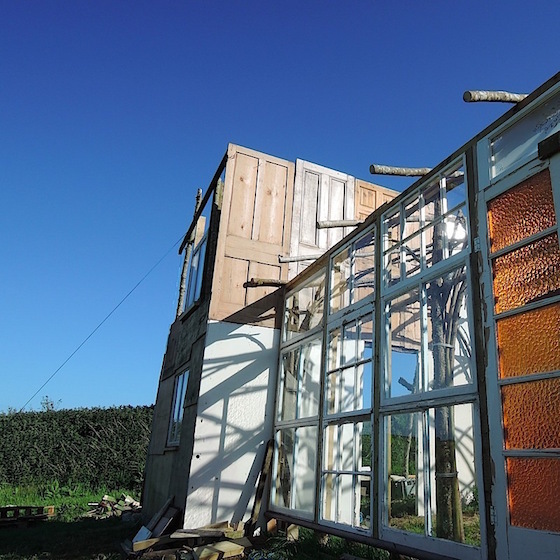 The pavilion has started to take shape and window panels added to create a south facing wall. 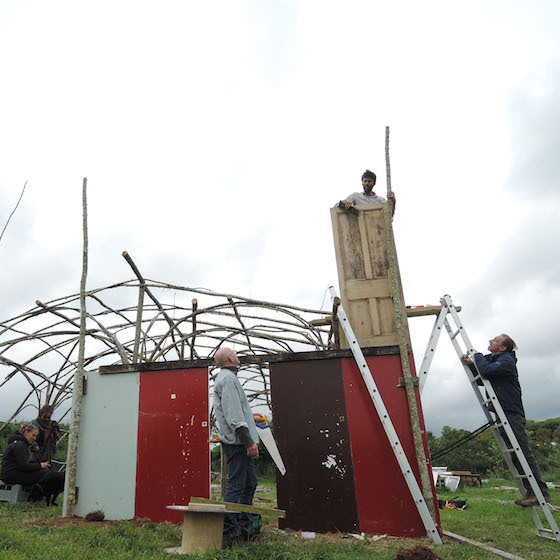 This was a crucial stage in the building process: putting in the support beams for the structure. 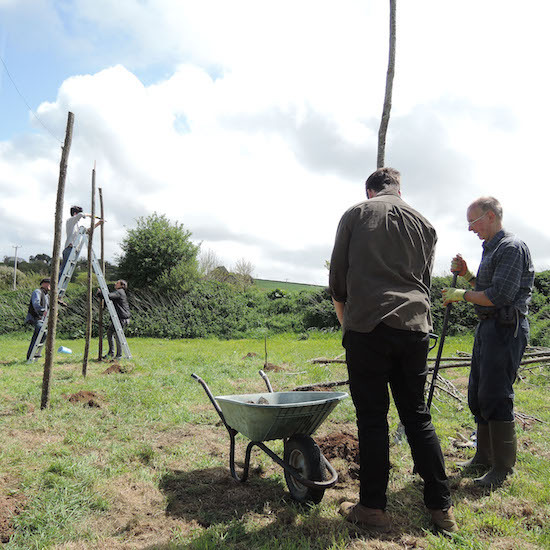 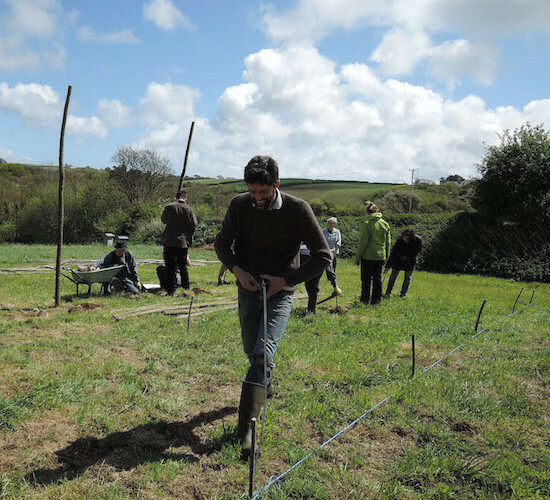 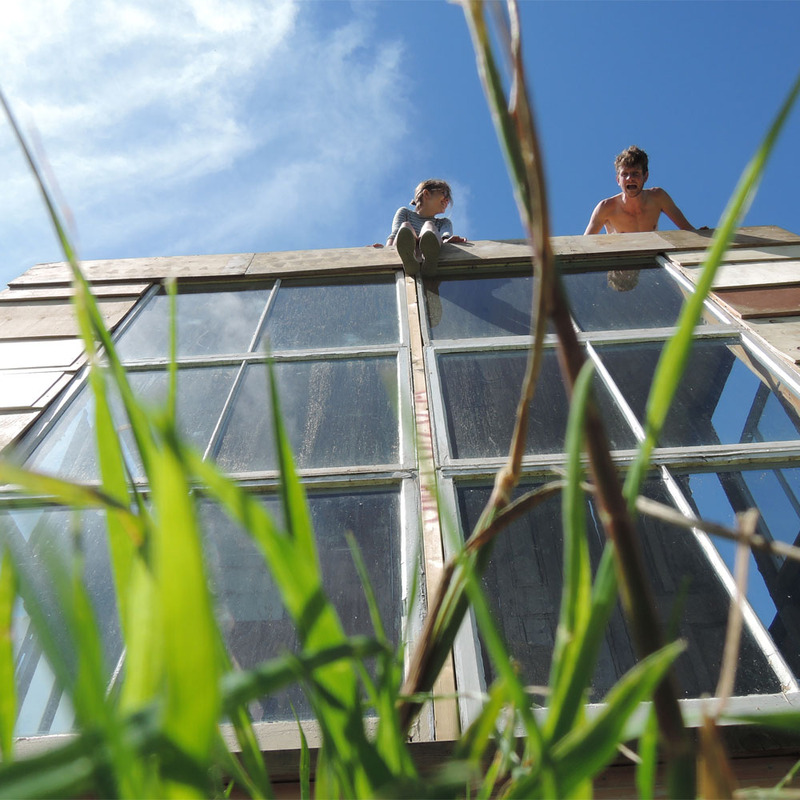 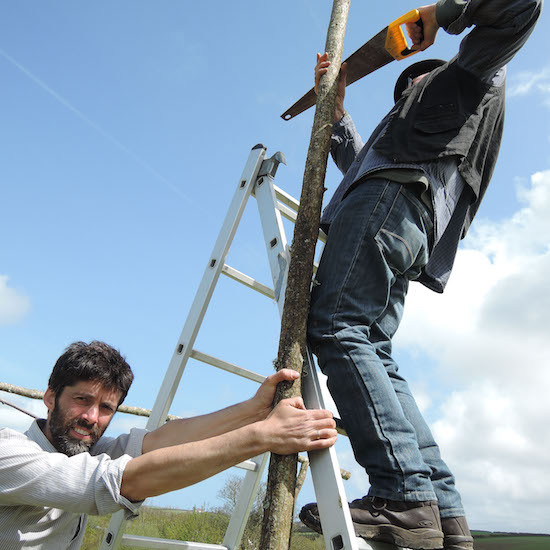 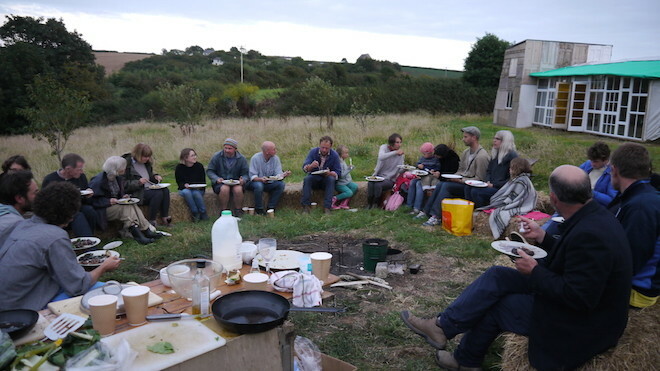 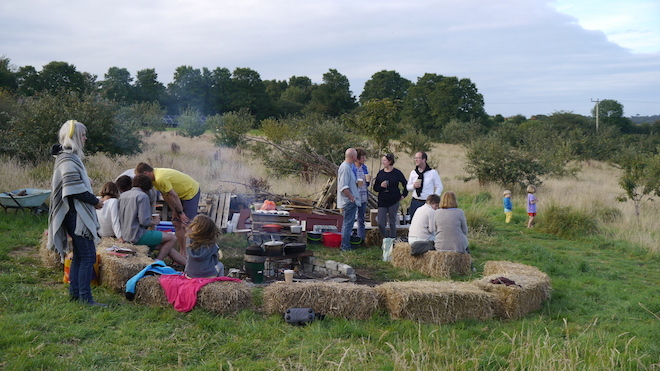 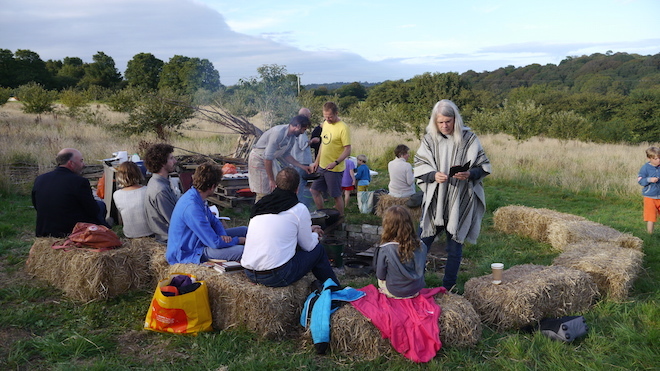 We had 9 fantastic volunteers and lovely weather to enjoy the work. 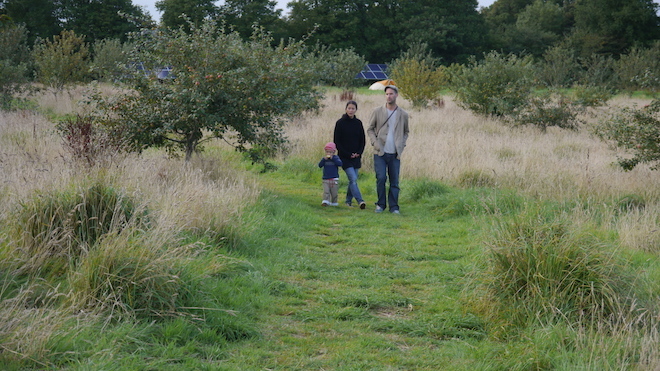 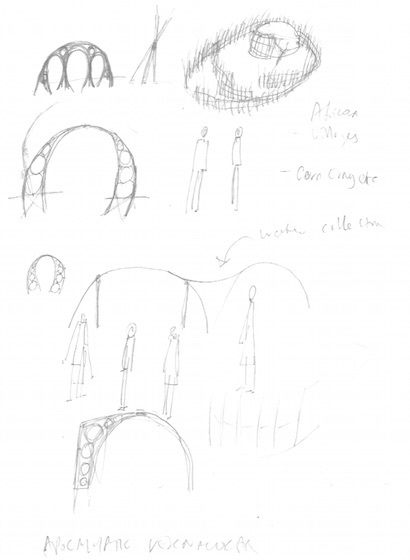 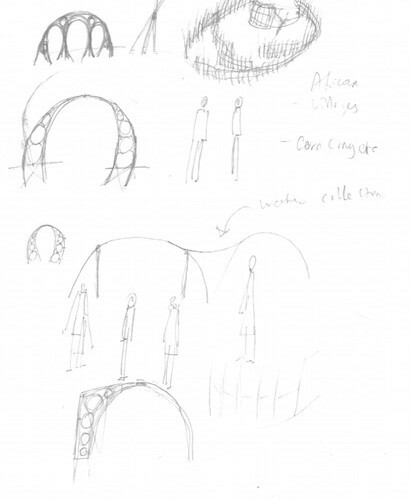 This first session was spent looking at designs and planning for the project ahead. 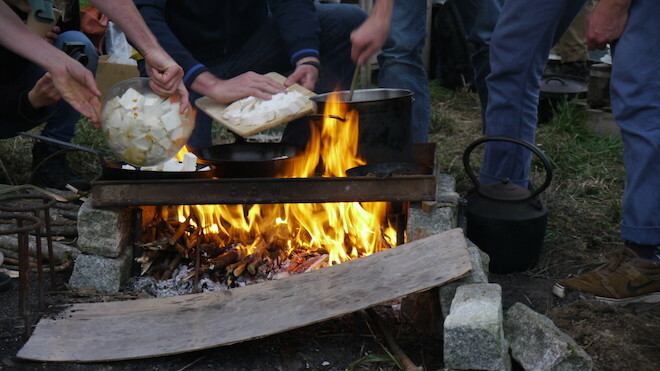 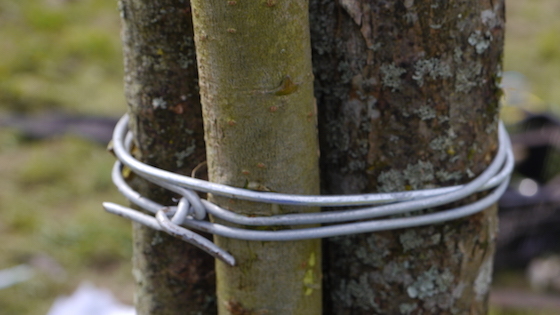 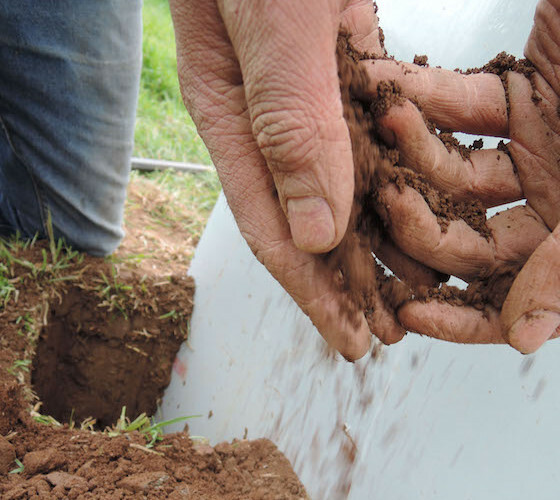 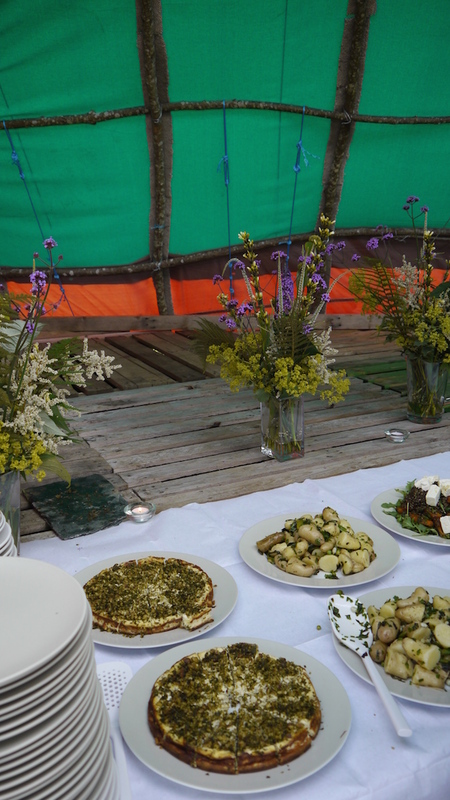 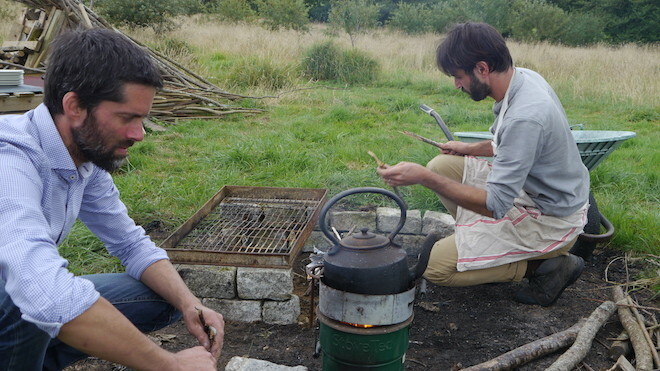 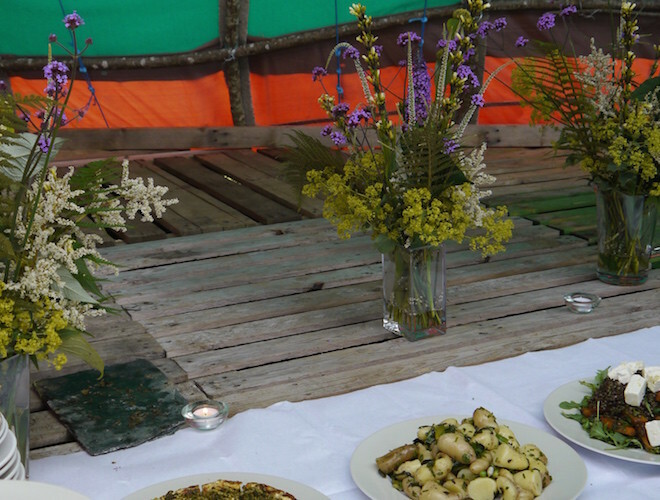 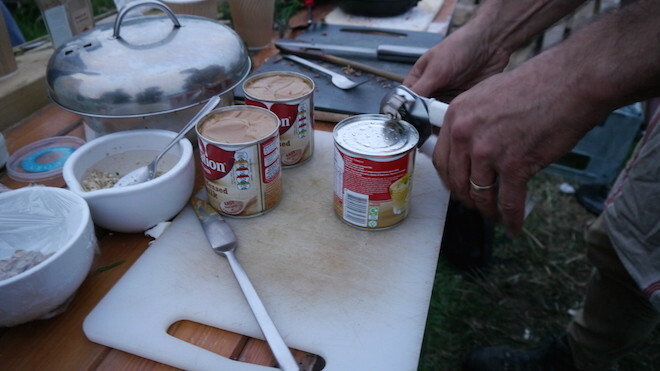 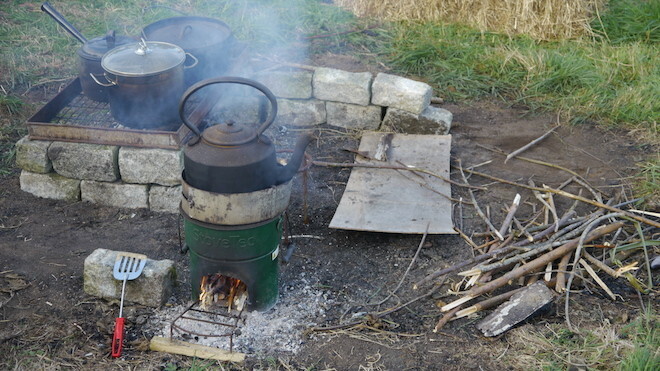 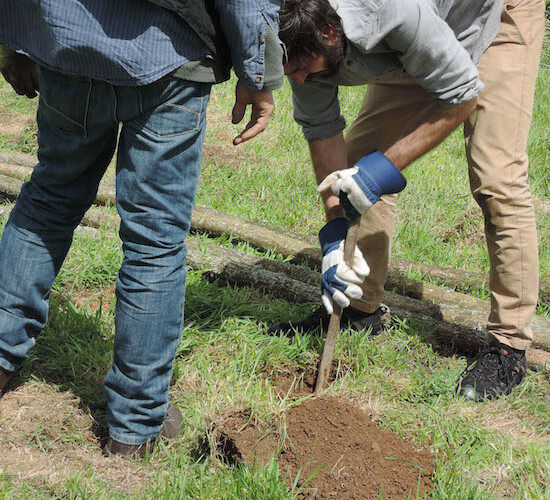 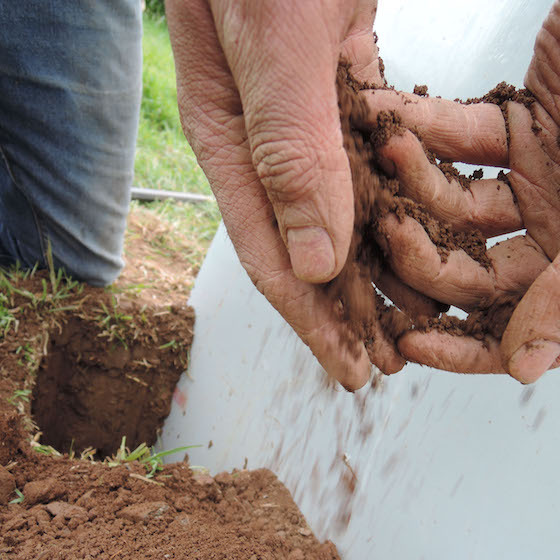 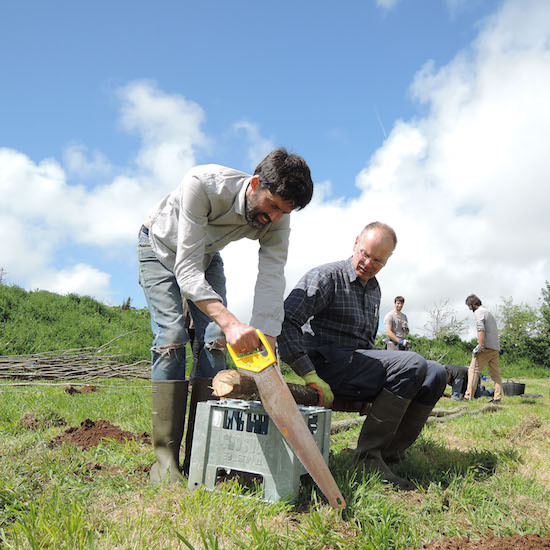 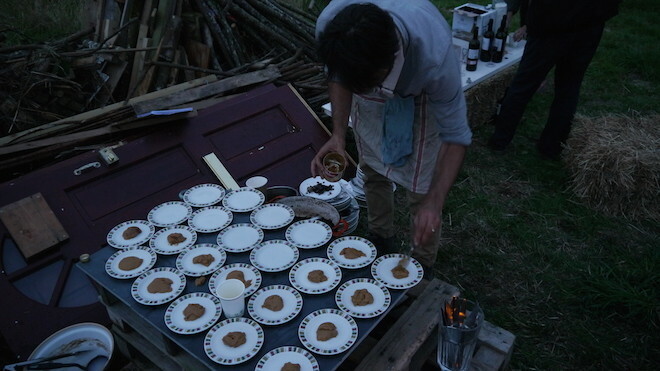 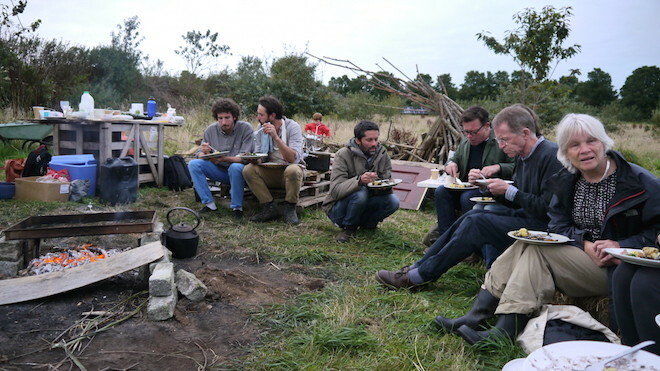 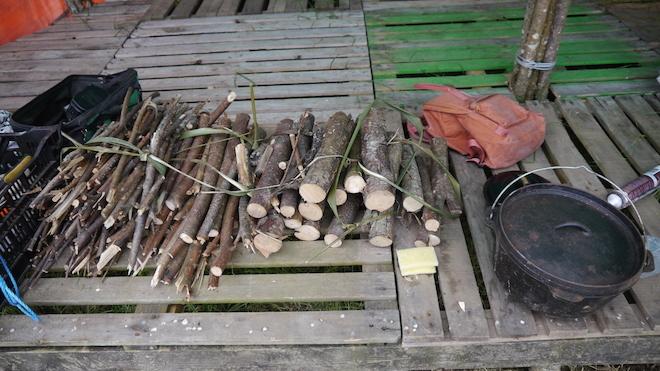 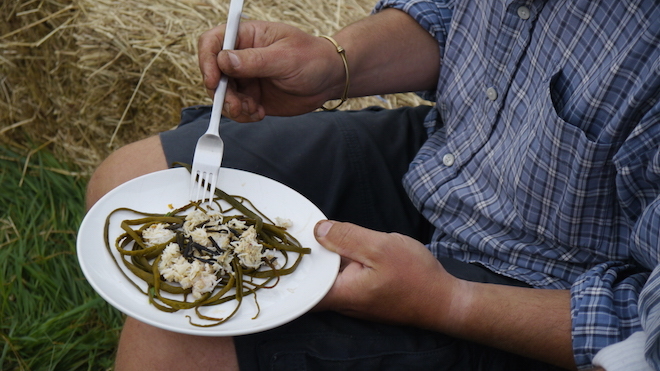 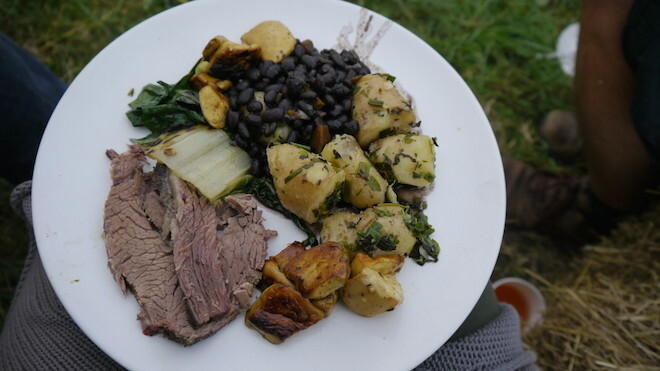 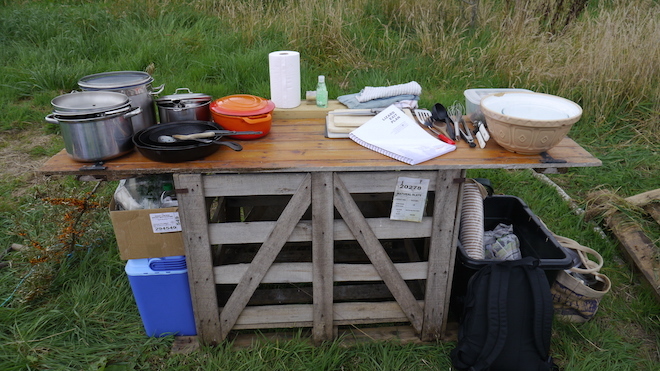 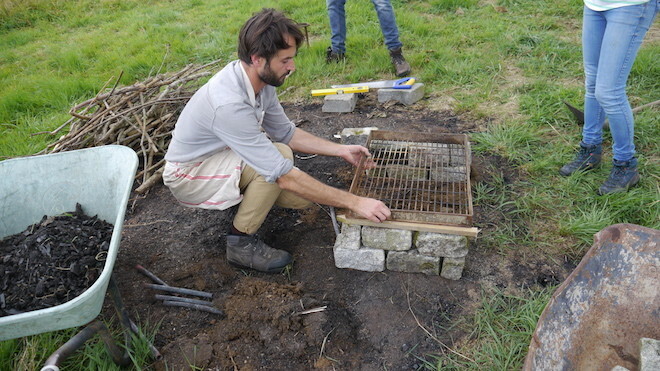 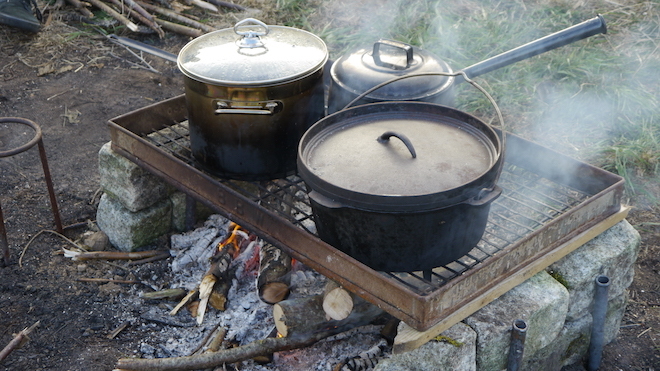 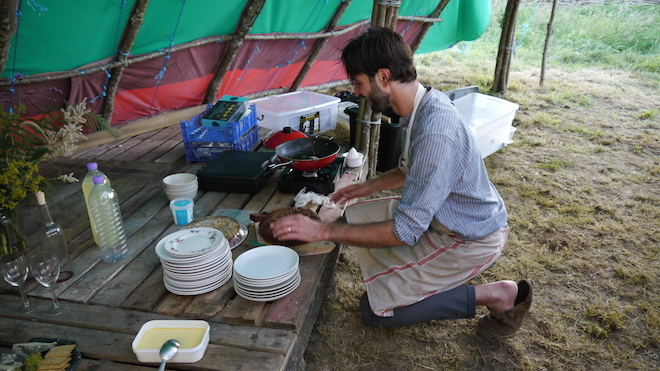 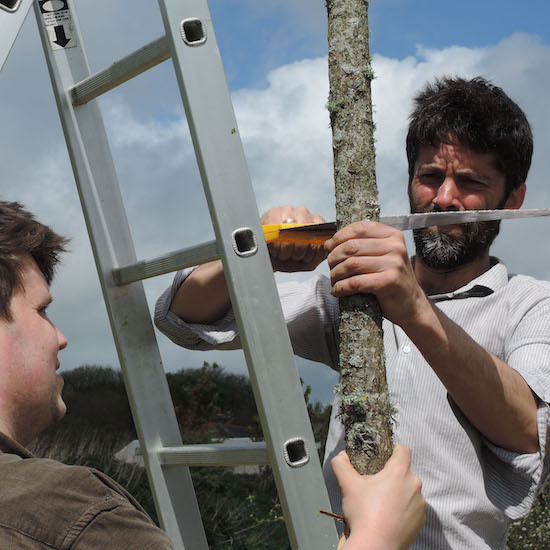 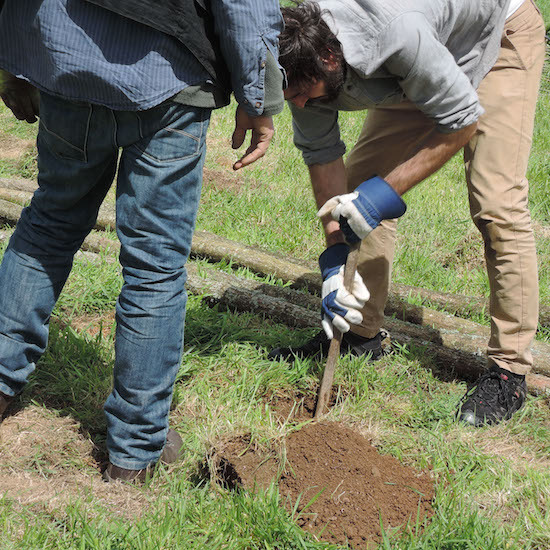 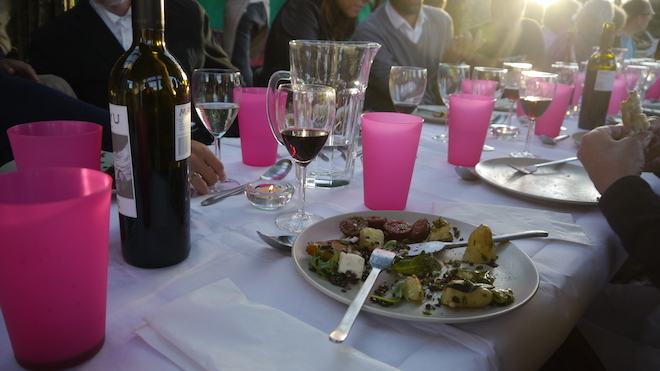 Time was also spent sourcing and gathering materials and testing various methods of construction.